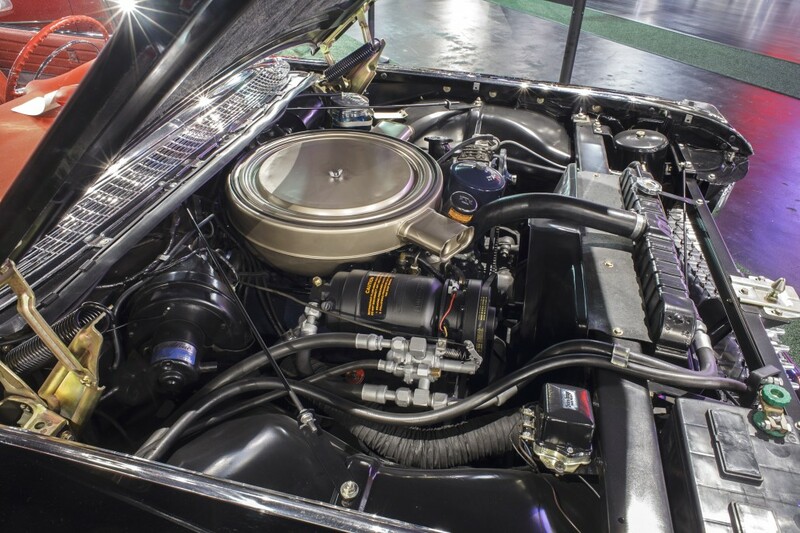 10-bolt rear end drivetrain, 700R4 automatic overdrive transmission, powered by a GM performance “fast burn 385”, same as the ZZ4 with added HP, custom suspension with tubular a–arms and rear brackets that support Ride Pro 3 air ride suspension system. 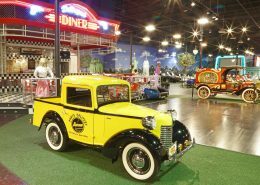 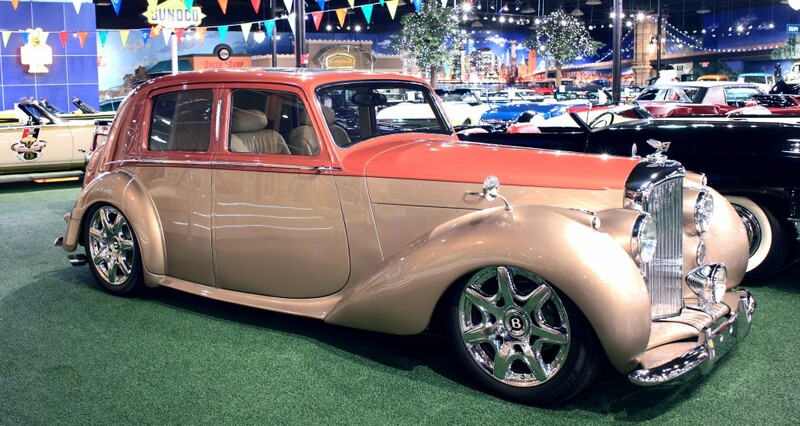 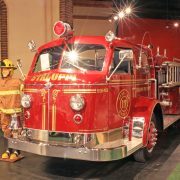 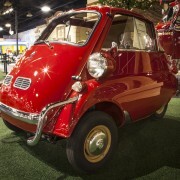 Complete restoration, total weight of car is only 770 lbs and has a 3 gallon gas tank, top speed of 53 mph, 298CC engine rated at 13HP, 4–speed manual transmission. 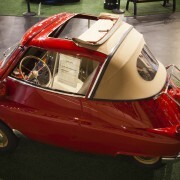 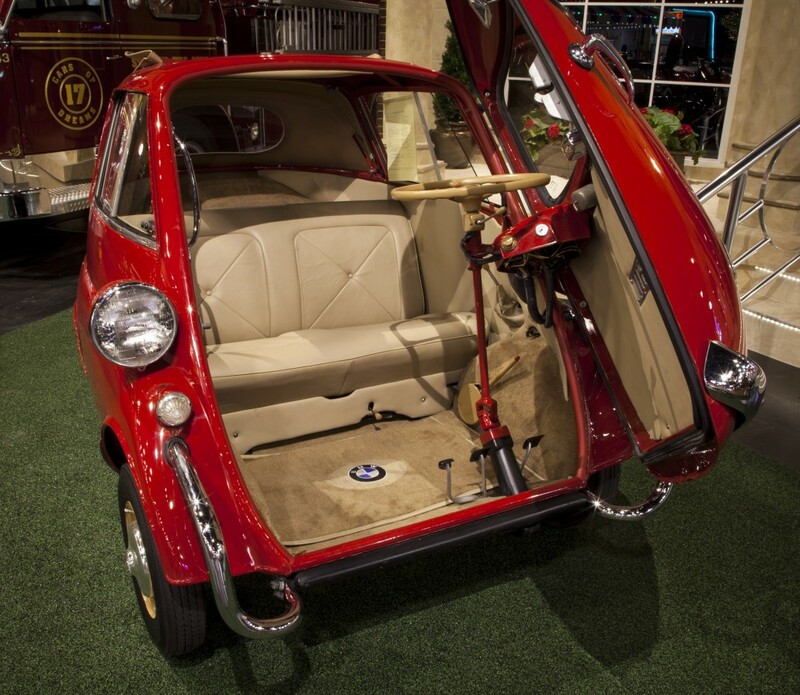 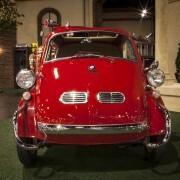 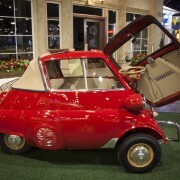 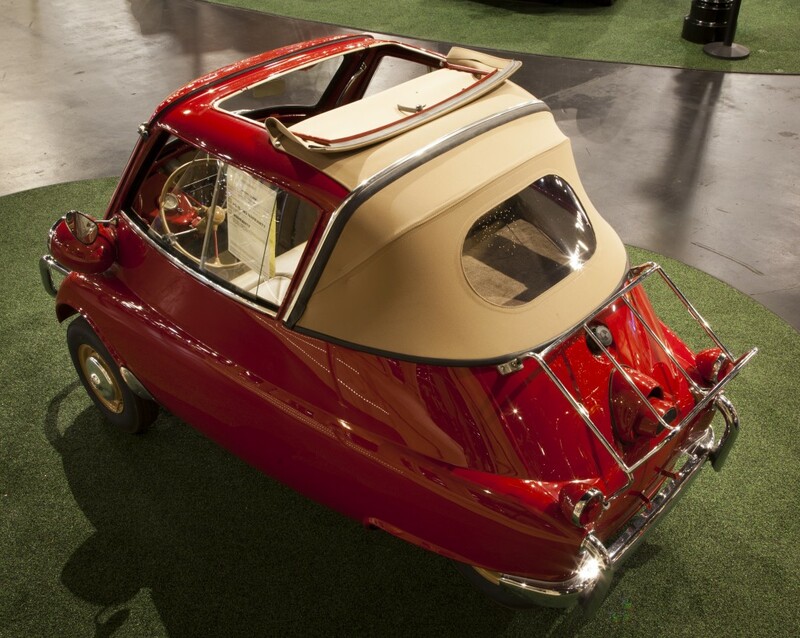 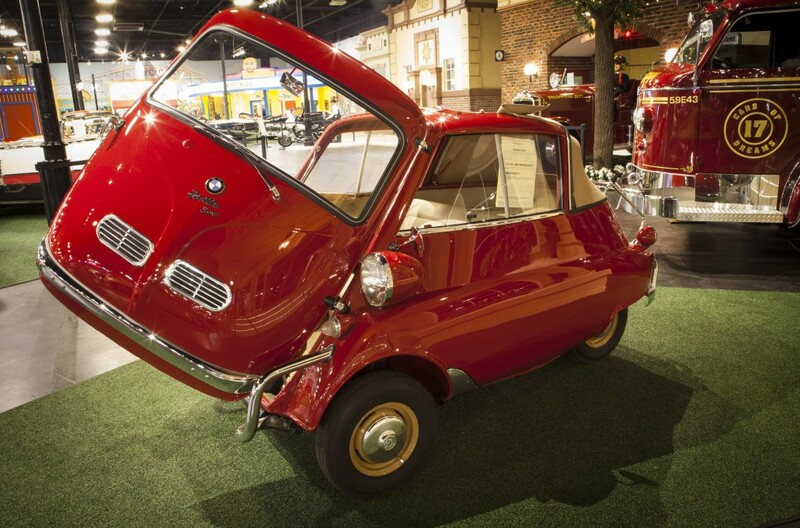 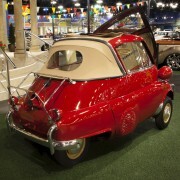 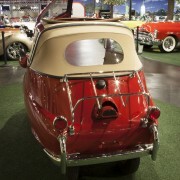 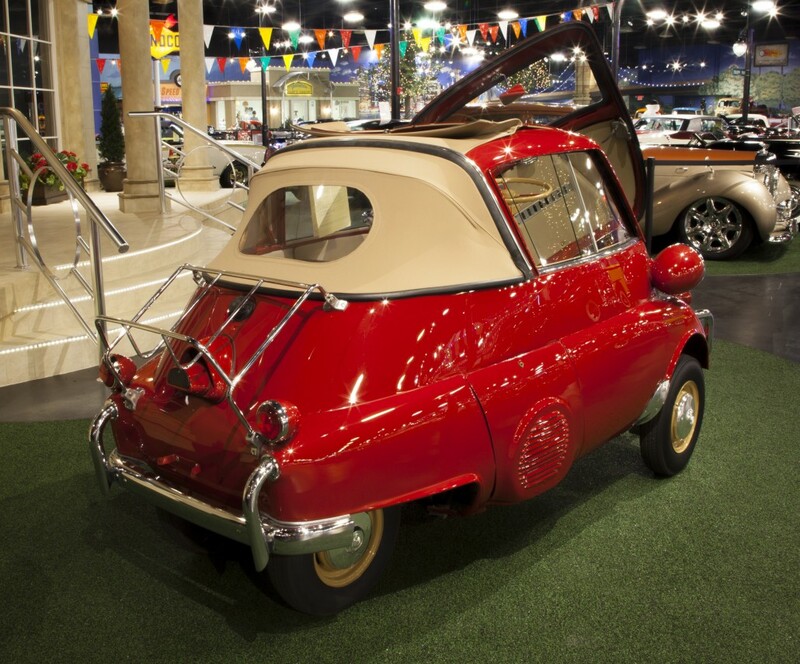 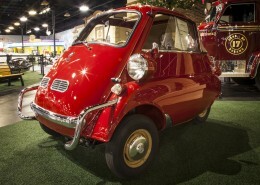 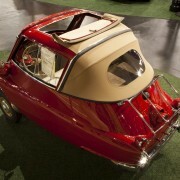 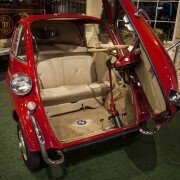 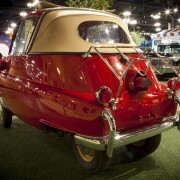 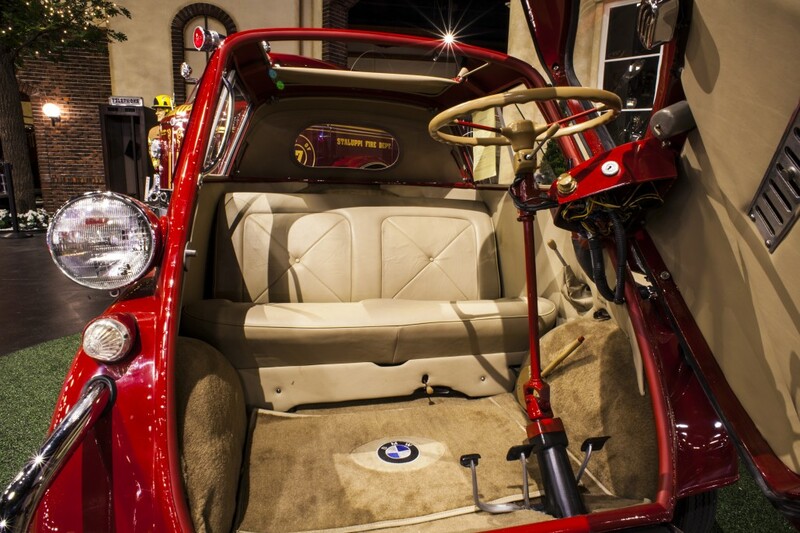 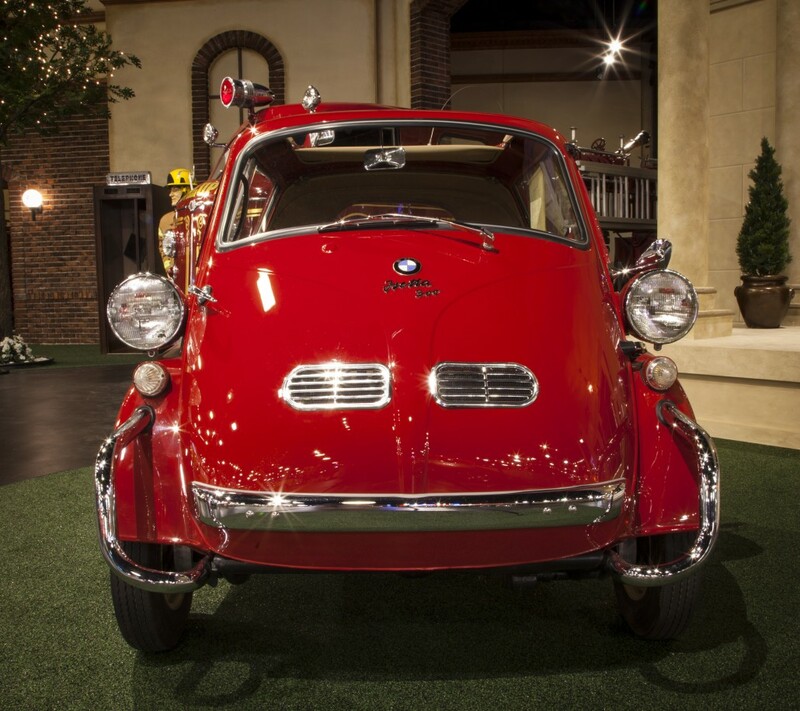 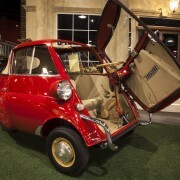 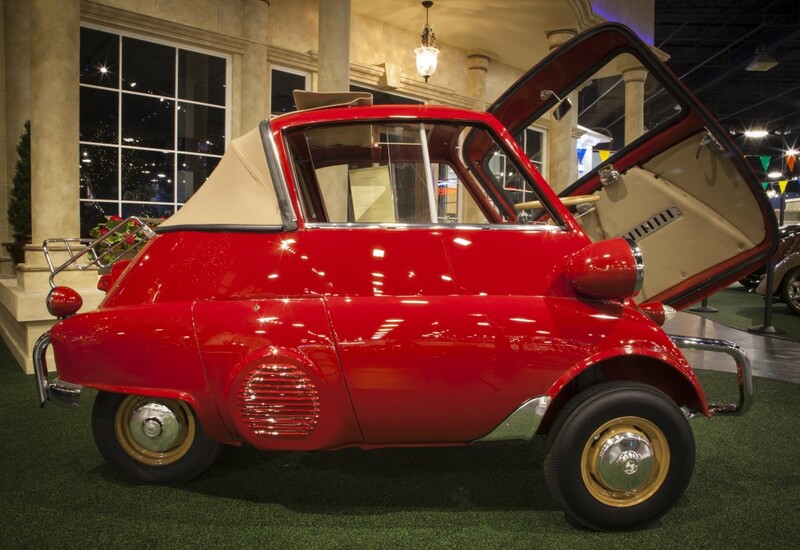 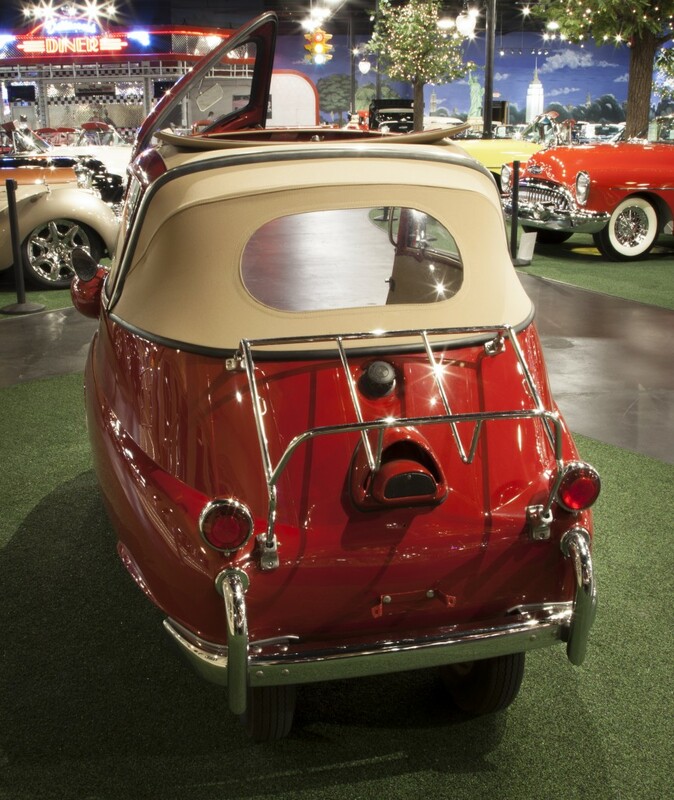 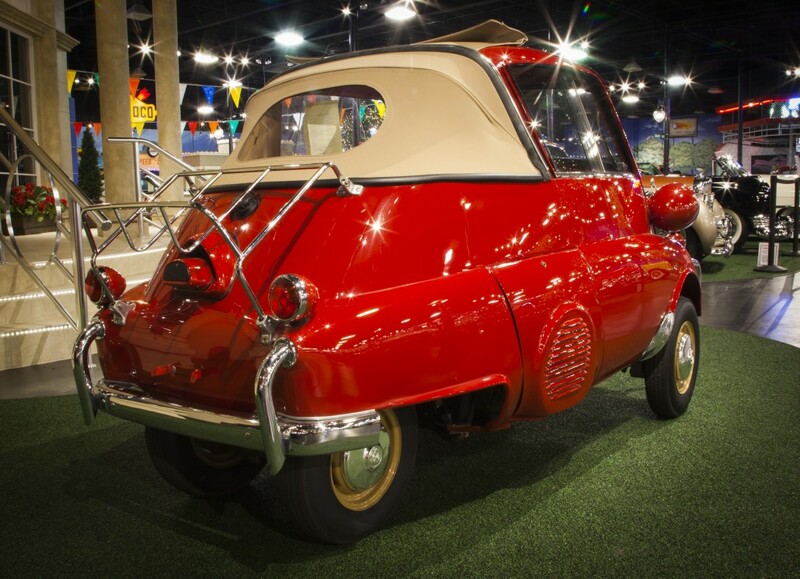 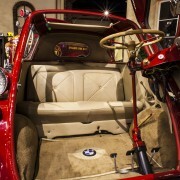 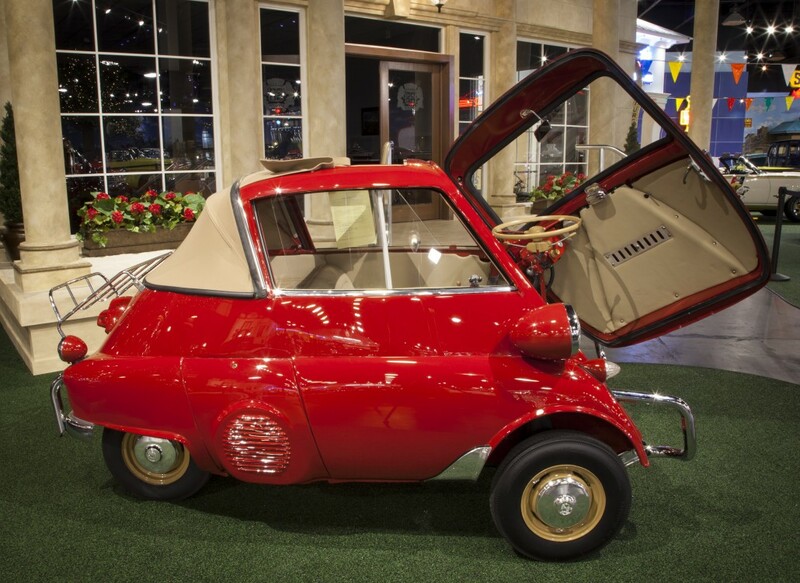 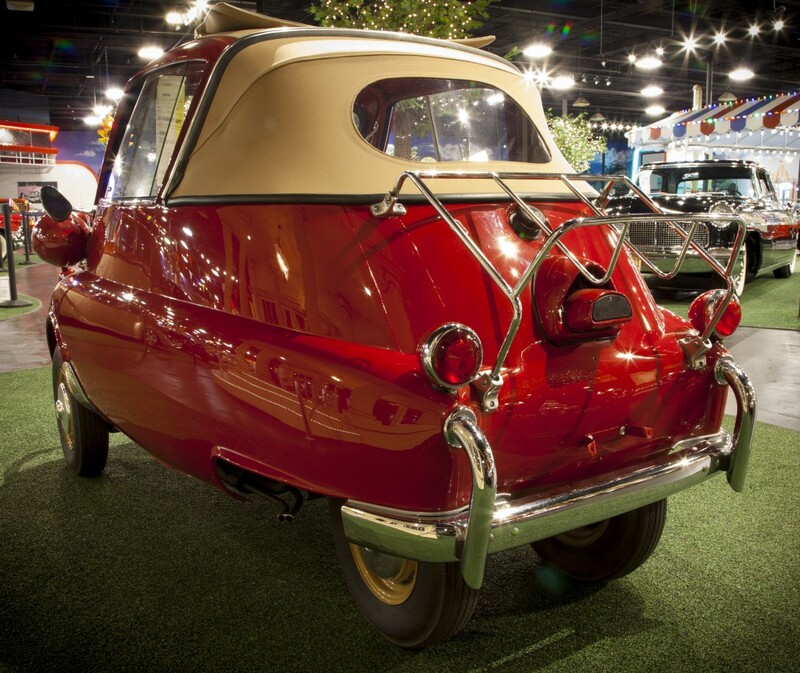 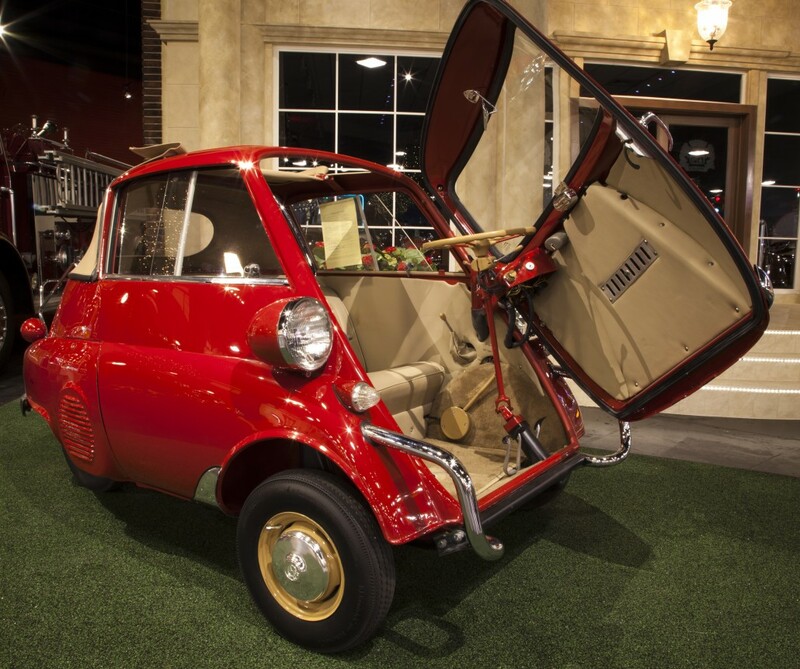 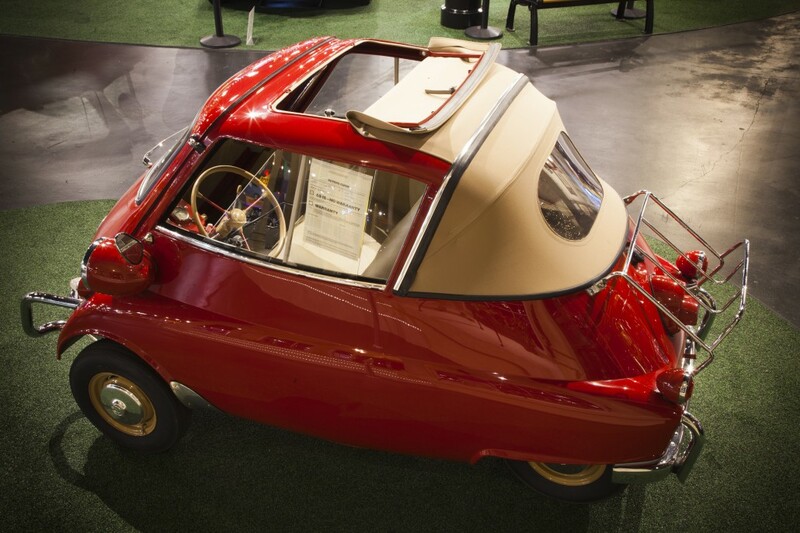 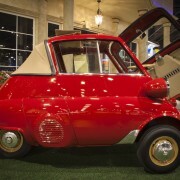 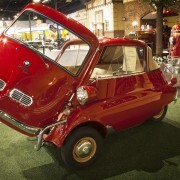 Known fondly by Isetta and BMW enthusiasts as the “rolling egg”. 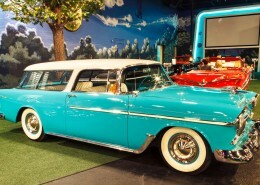 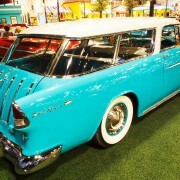 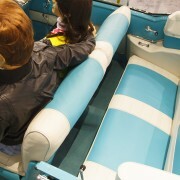 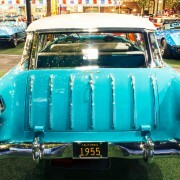 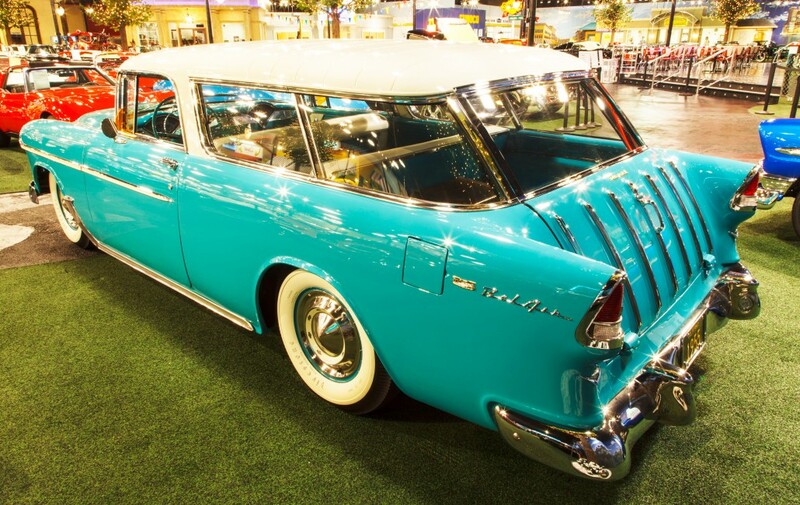 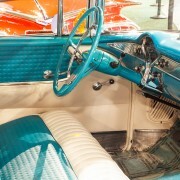 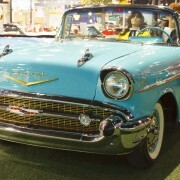 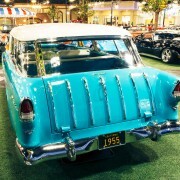 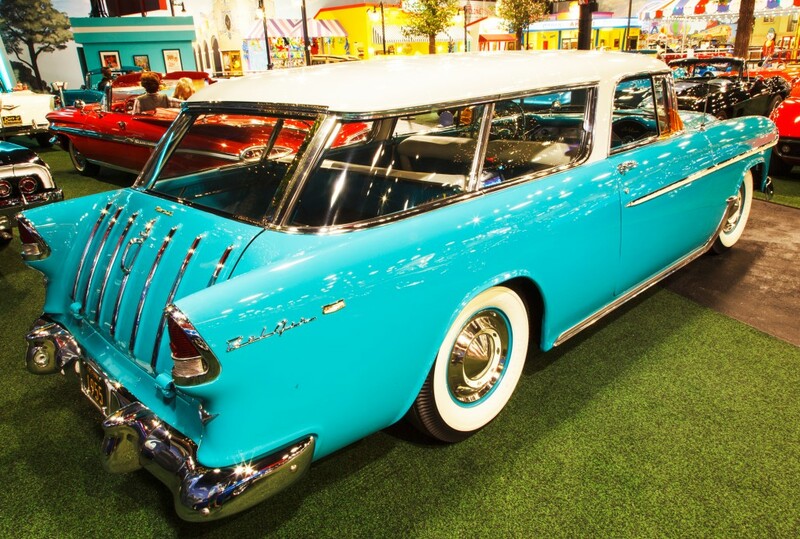 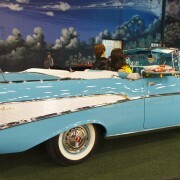 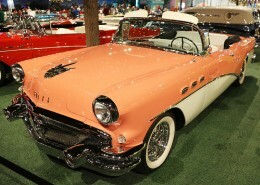 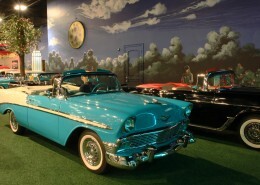 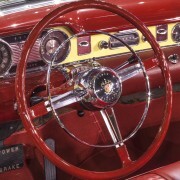 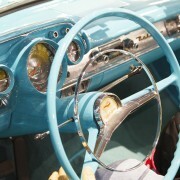 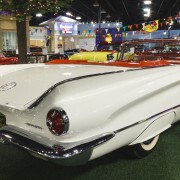 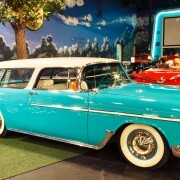 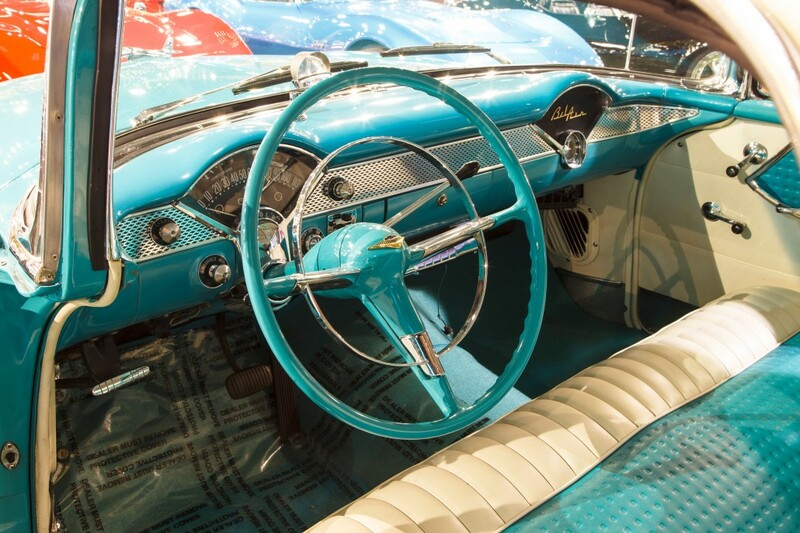 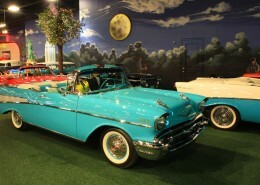 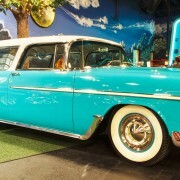 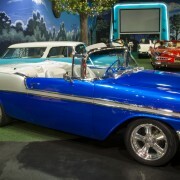 1957 “Tropical Edition” with vented front door. 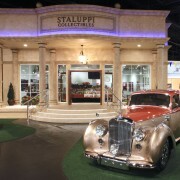 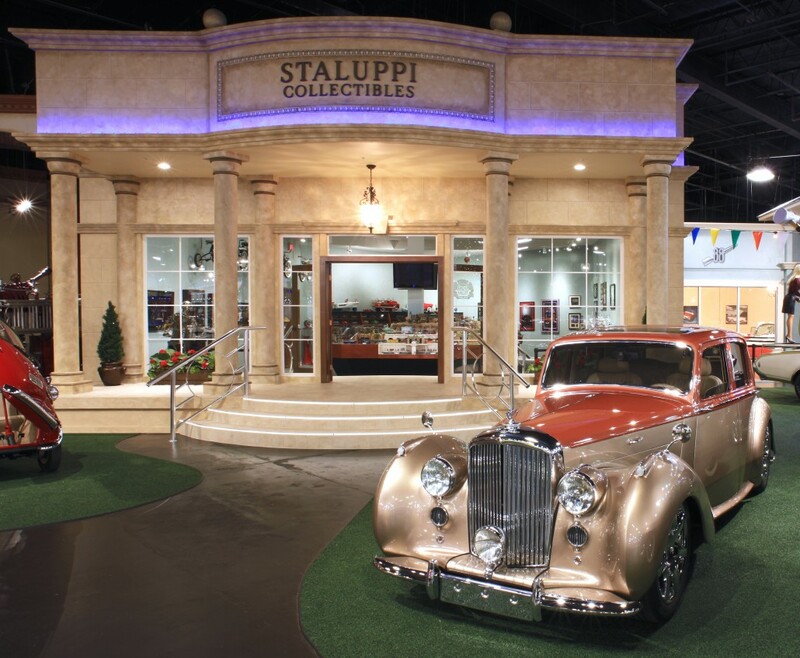 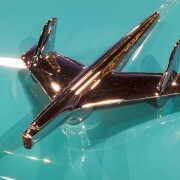 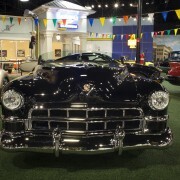 This model was sold in South America and a few in south Florida. 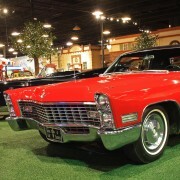 77 pounds of pure fun. 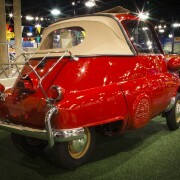 Not much excitement, with a 1 cylinder 13HP motor, top speed about 50 – but very cool. 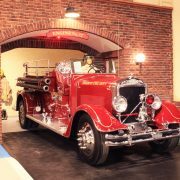 Professional rotisserie restoration, powered by a 322CID, 188HP V8 engine, power windows, seats, radio antenna, steering and brakes. 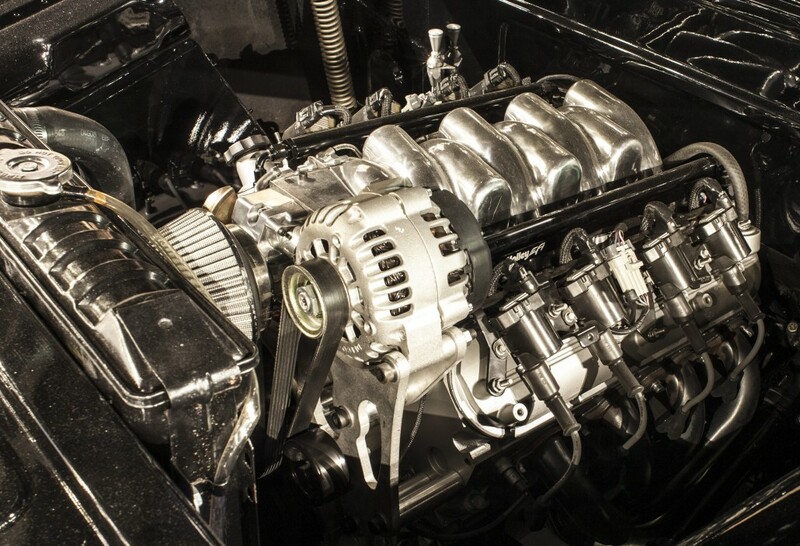 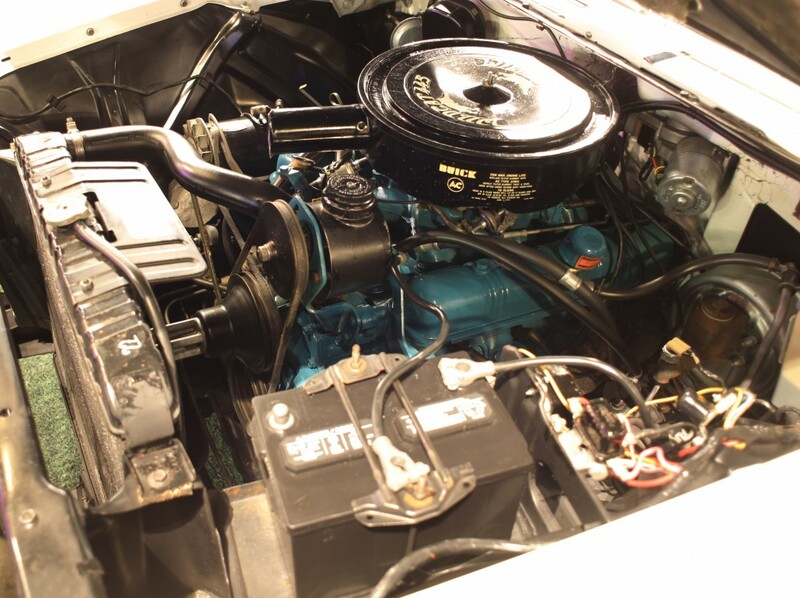 Frame-off, Rotisserie nut and bolt restoration, 322CID V8, automatic transmission, power steering and dual exhaust. 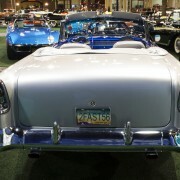 Rare rear bumper with correct exhaust ports. 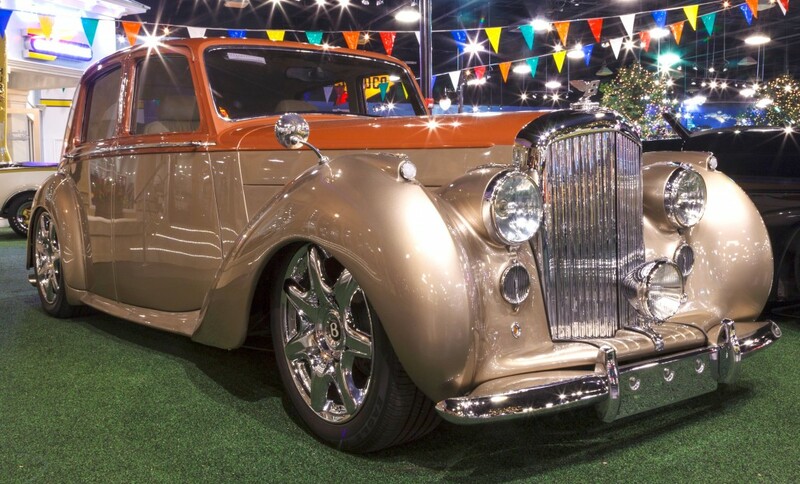 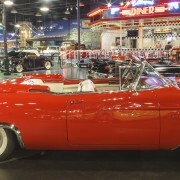 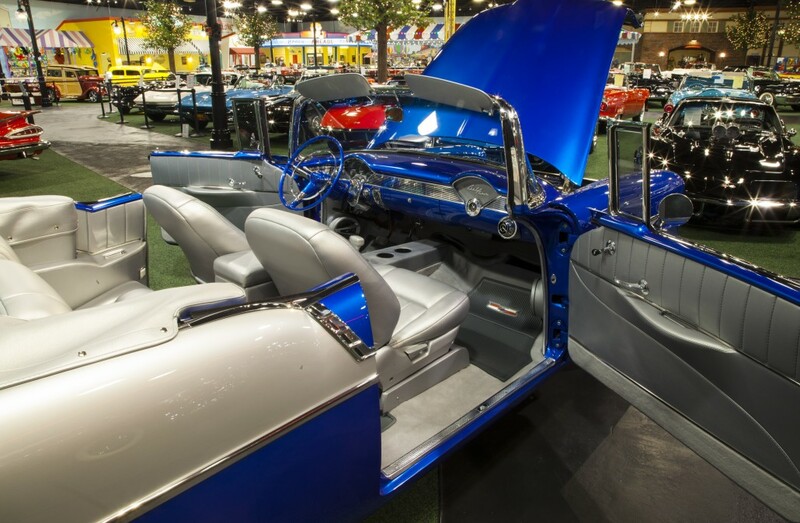 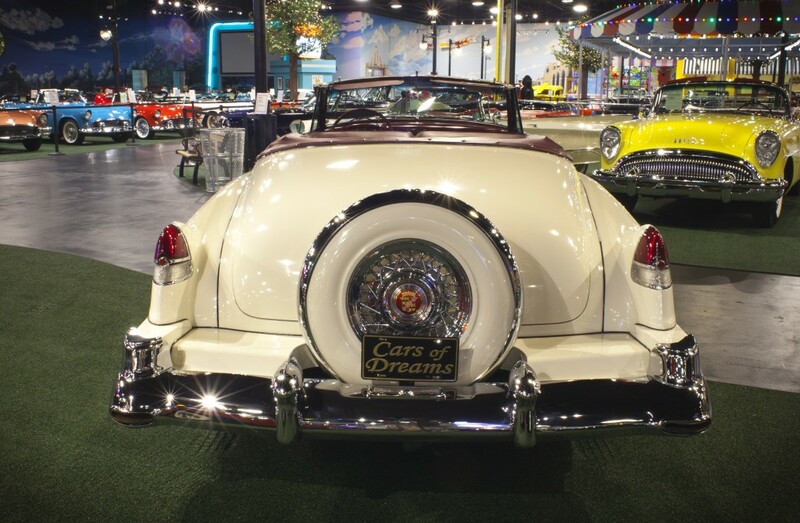 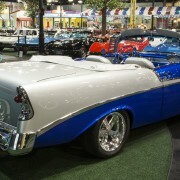 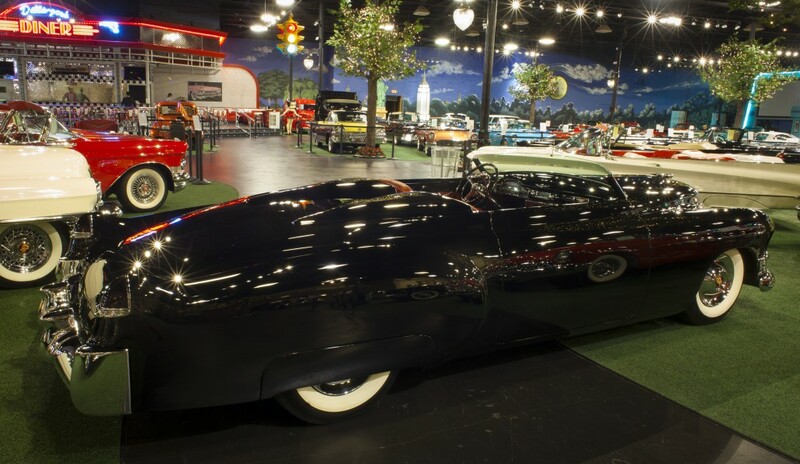 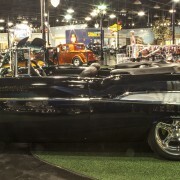 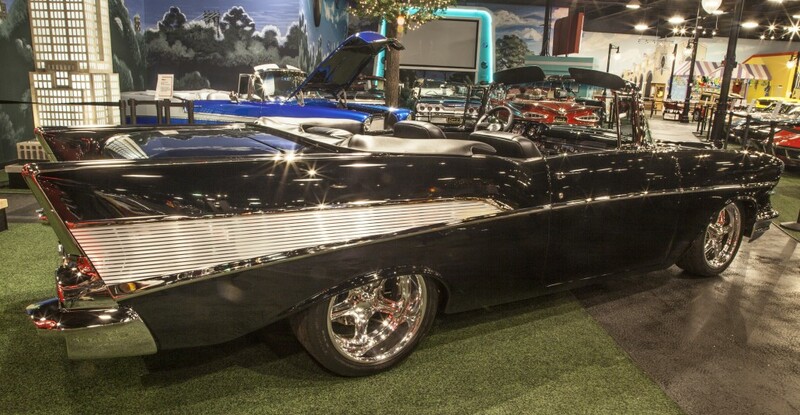 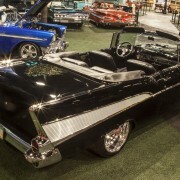 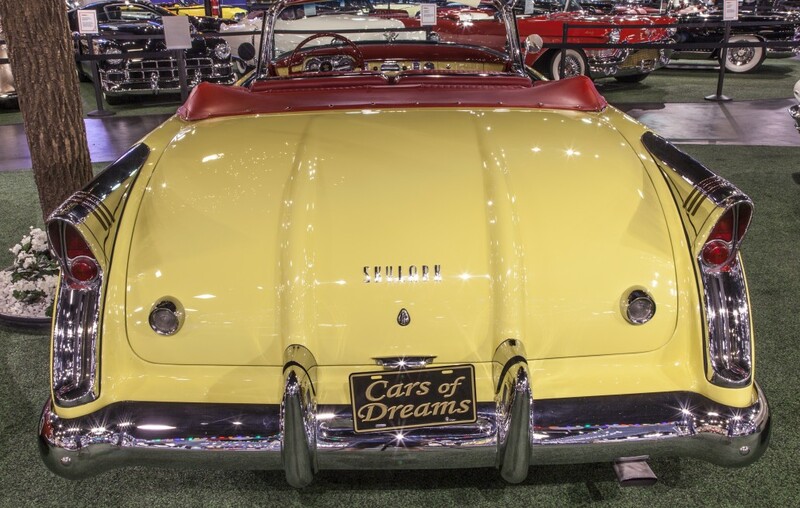 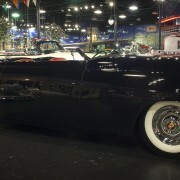 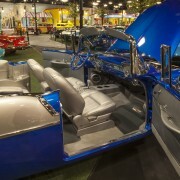 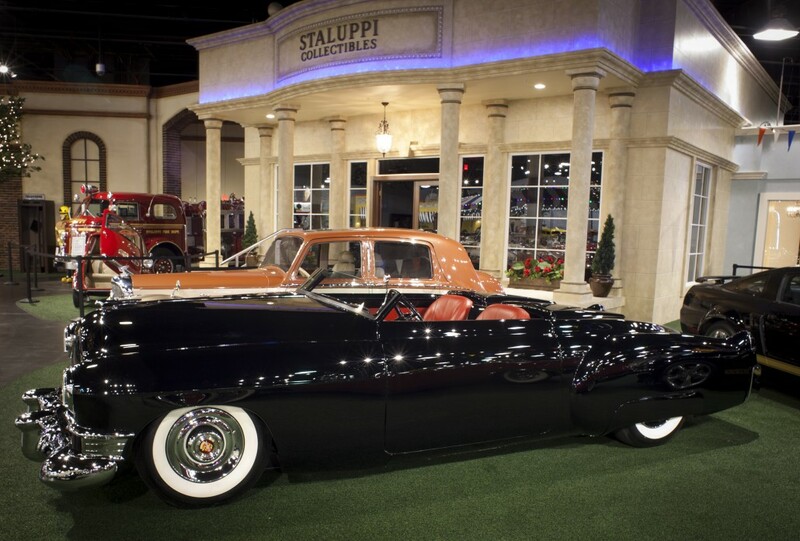 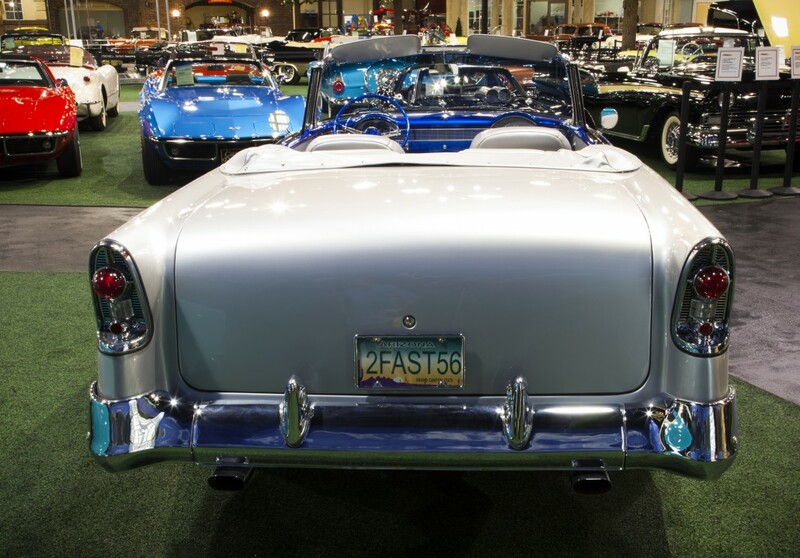 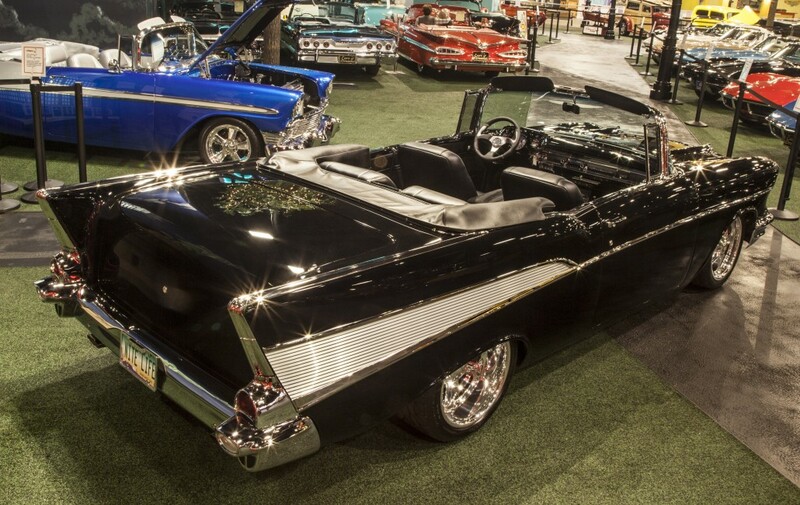 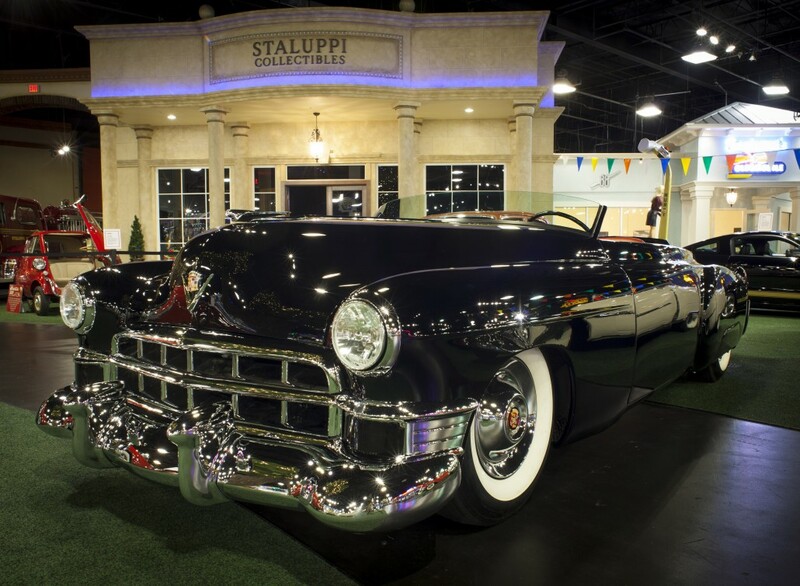 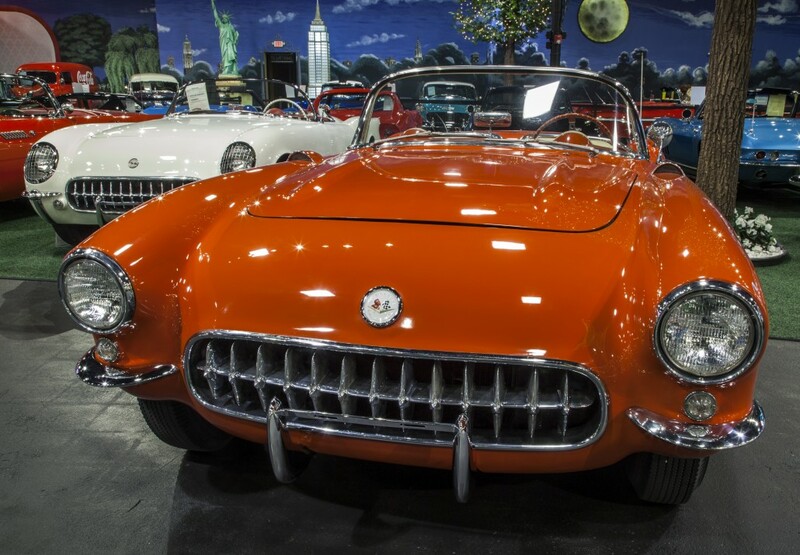 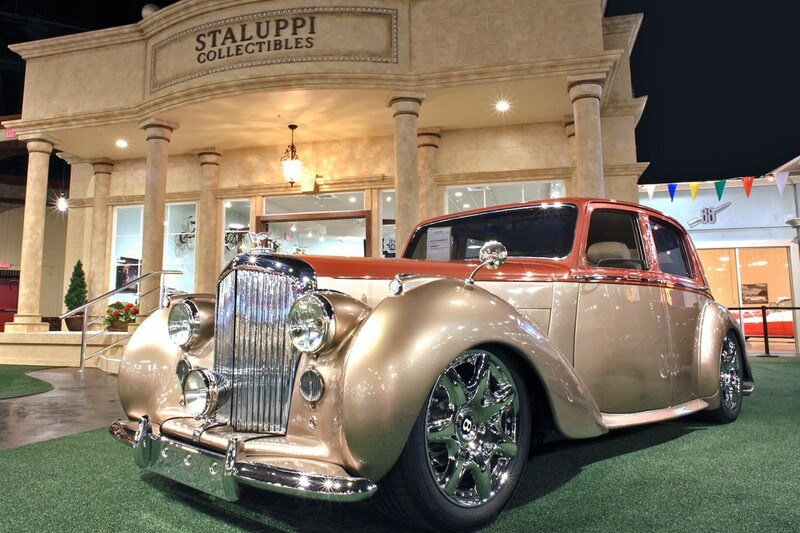 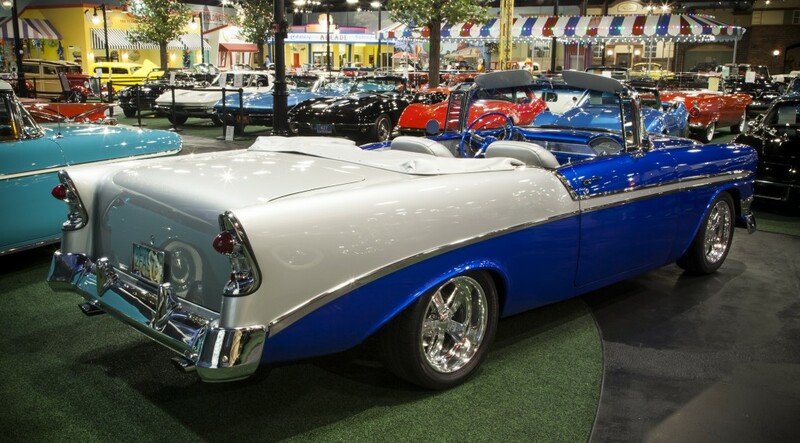 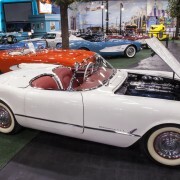 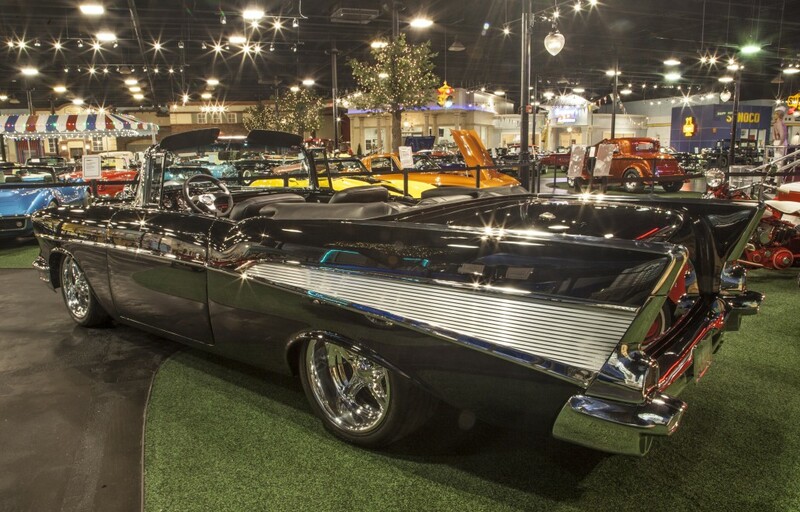 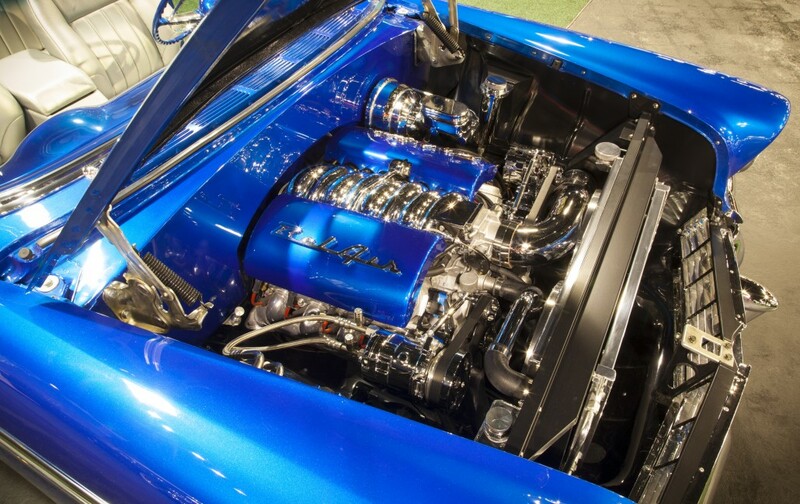 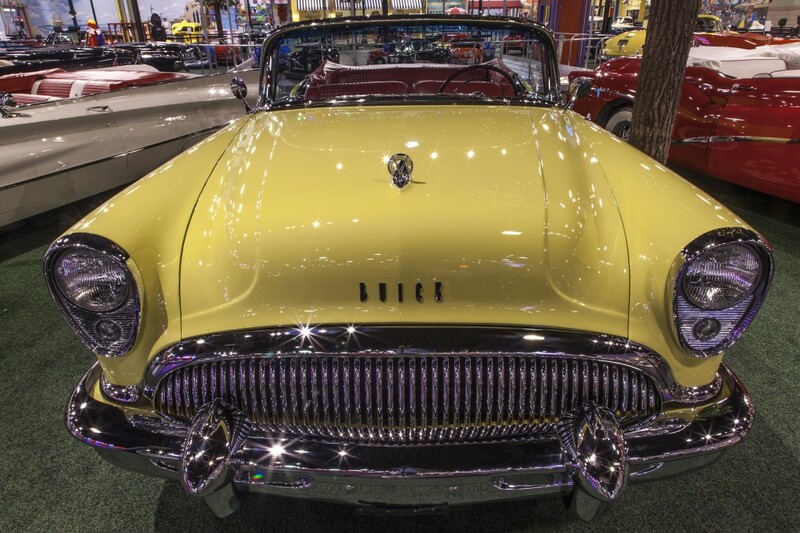 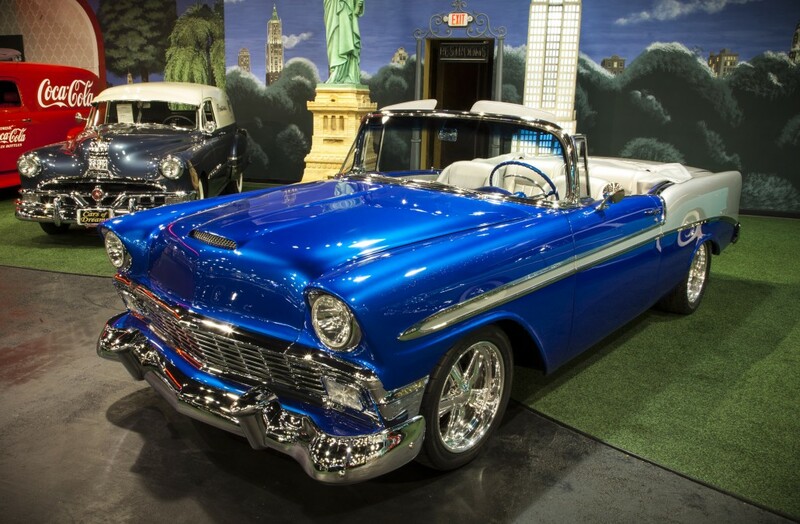 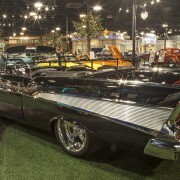 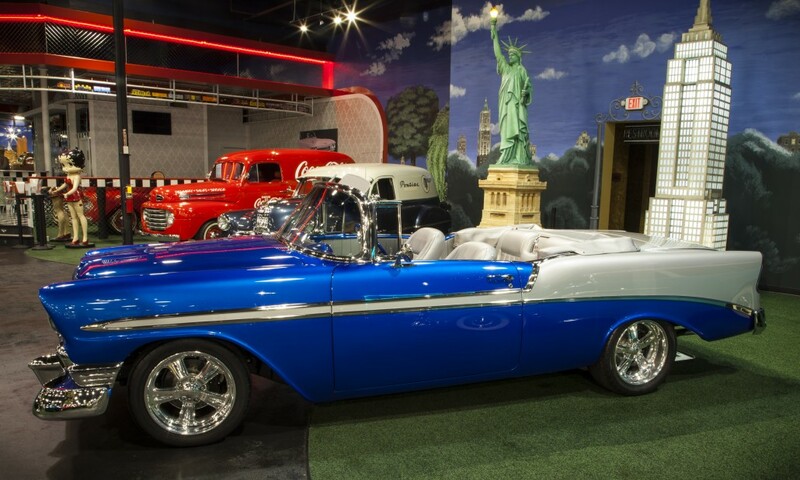 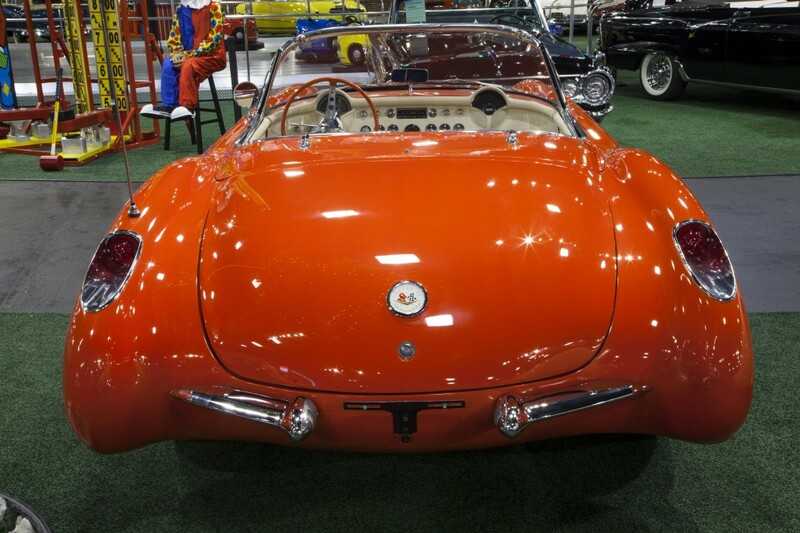 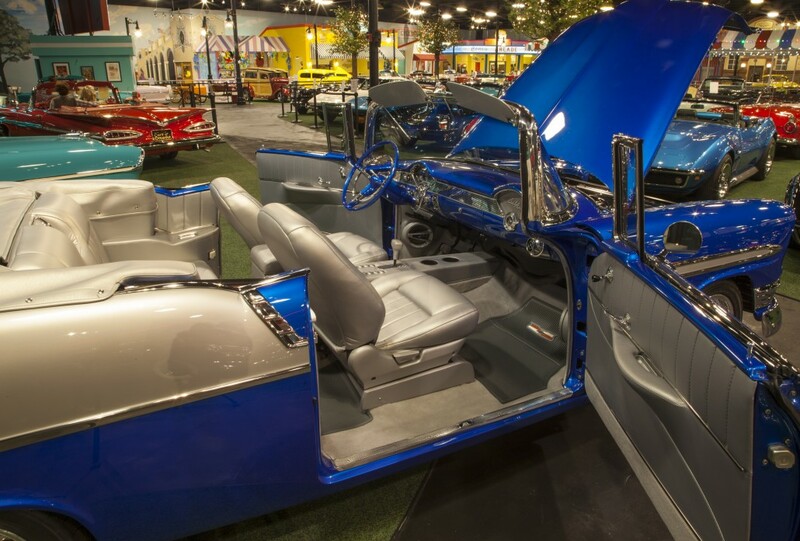 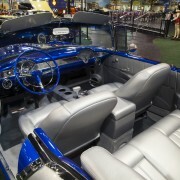 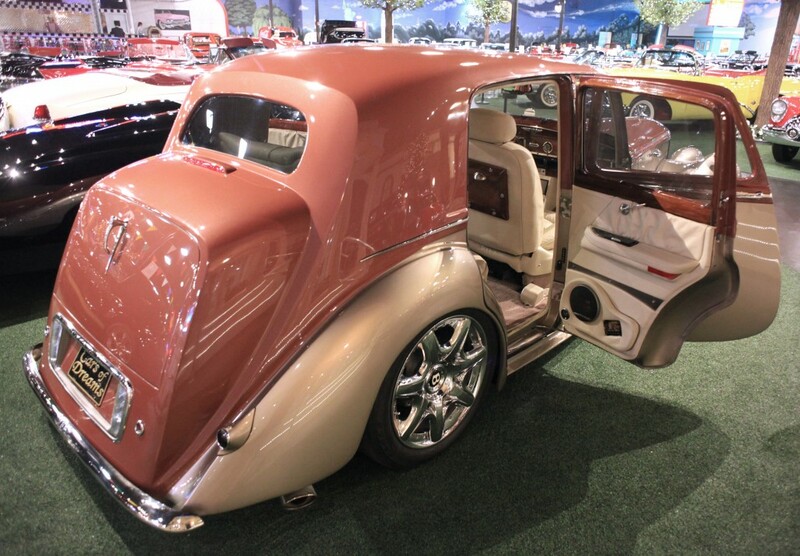 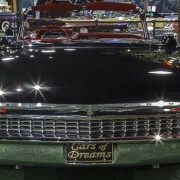 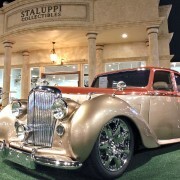 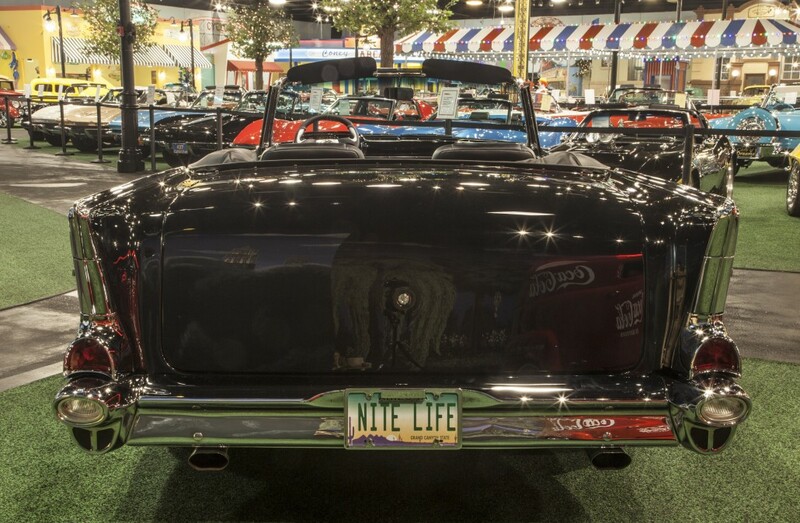 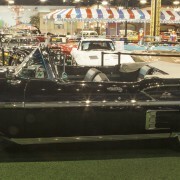 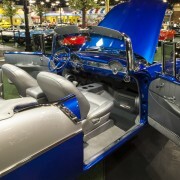 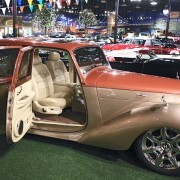 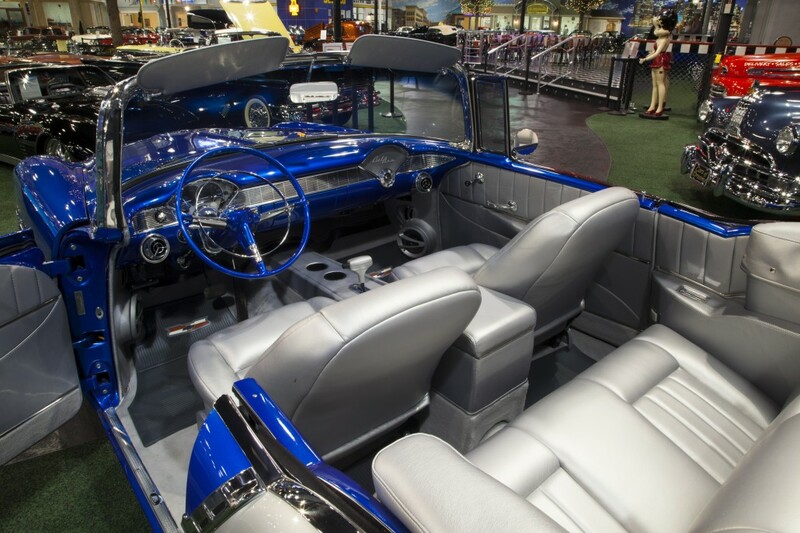 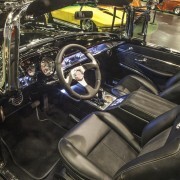 One-of-a-kind, modified front to back, full custom all steel 2–seat roadster, powered by a LS fuel injected motor backed by an overdrive transmission. 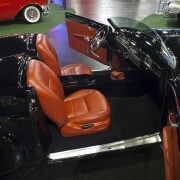 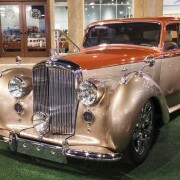 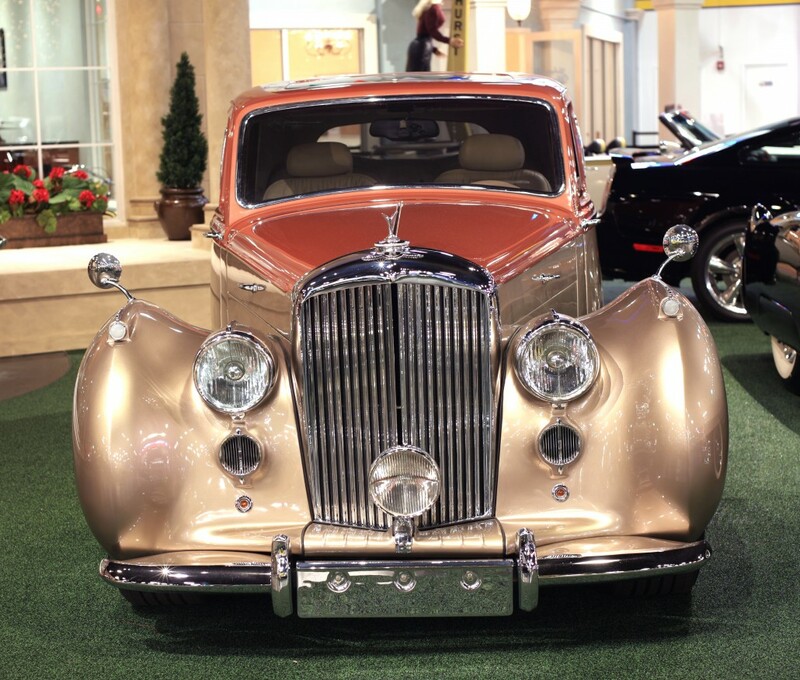 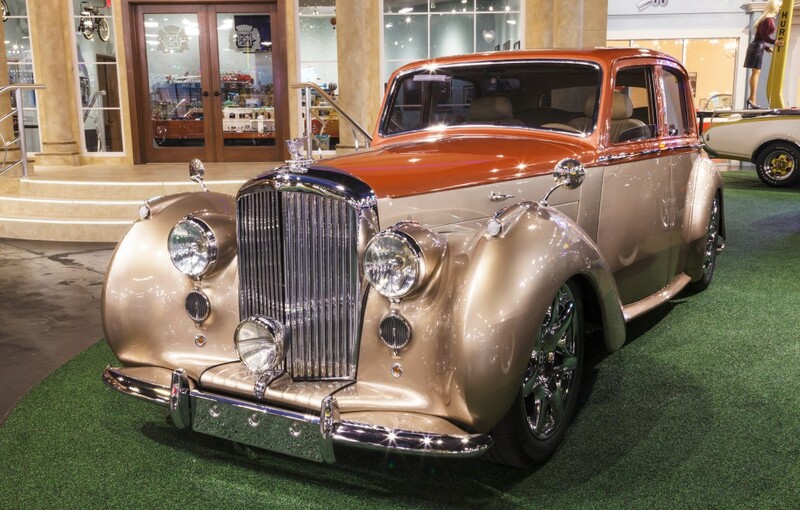 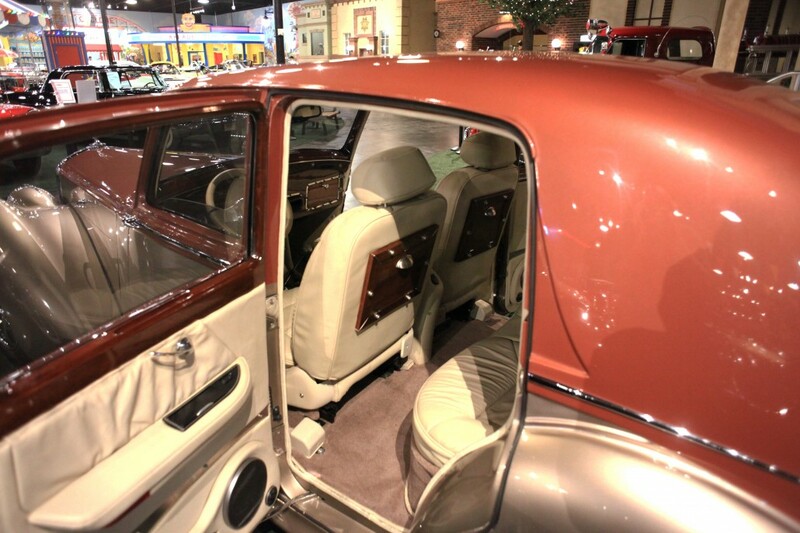 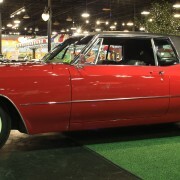 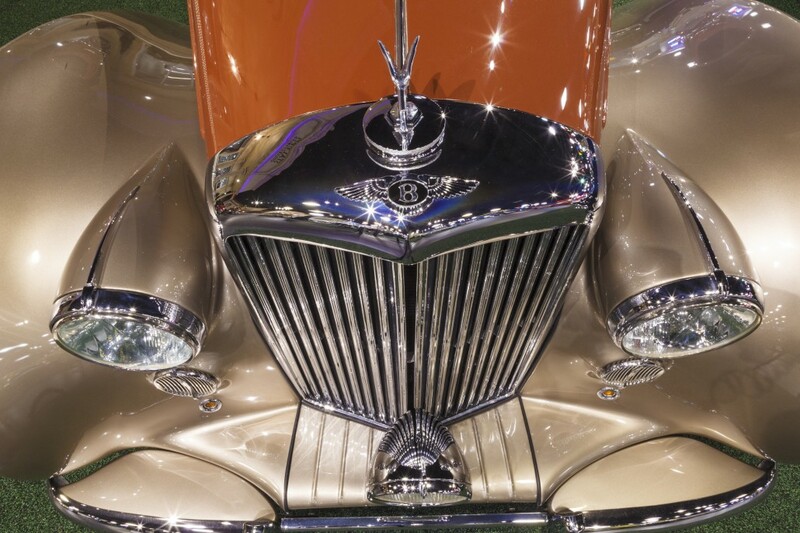 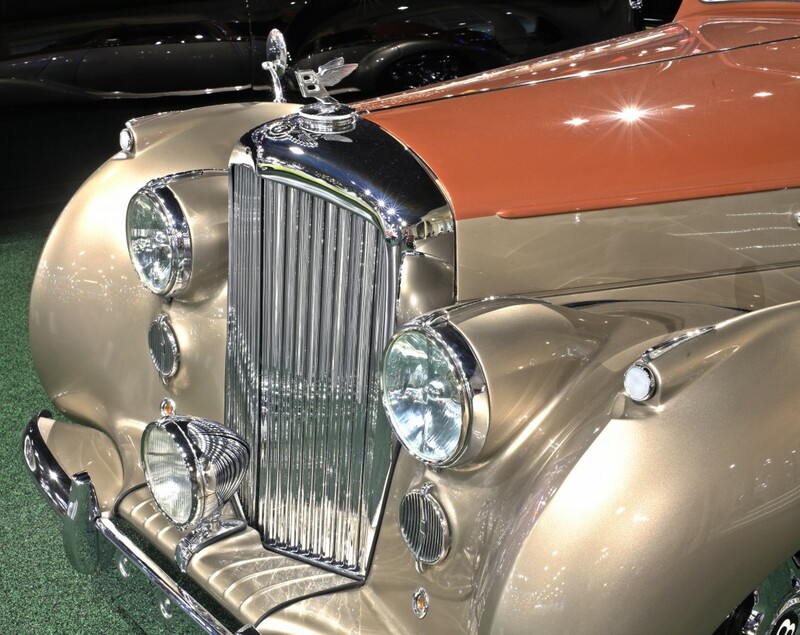 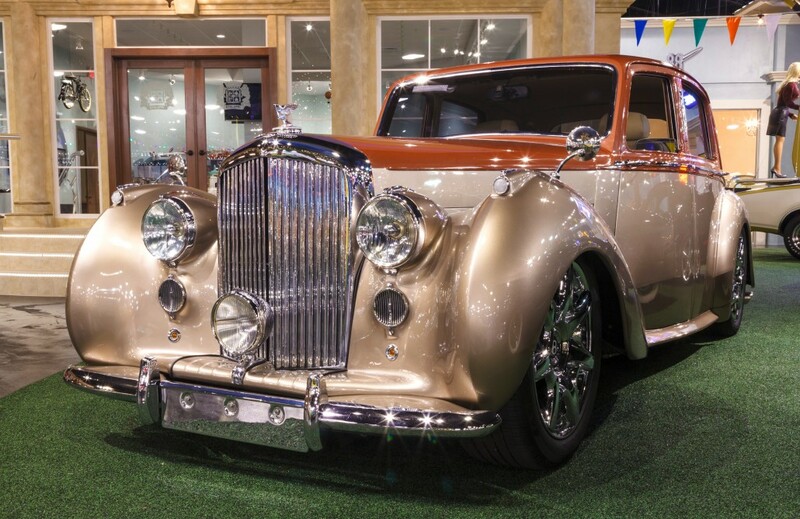 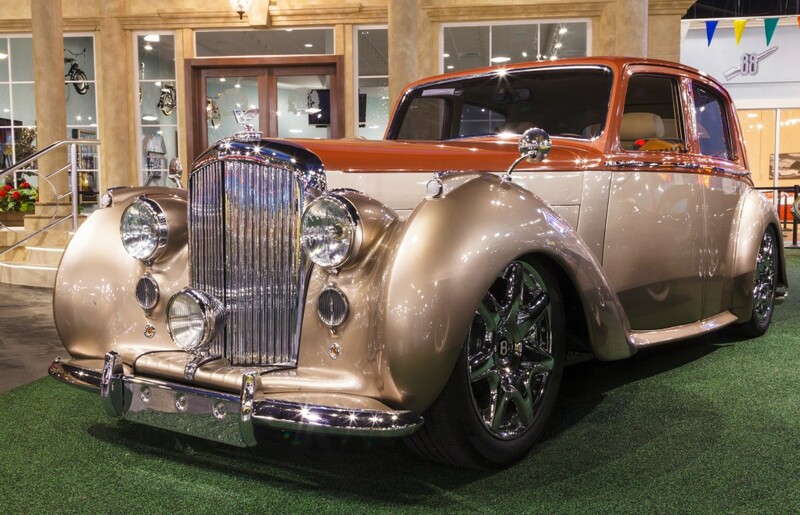 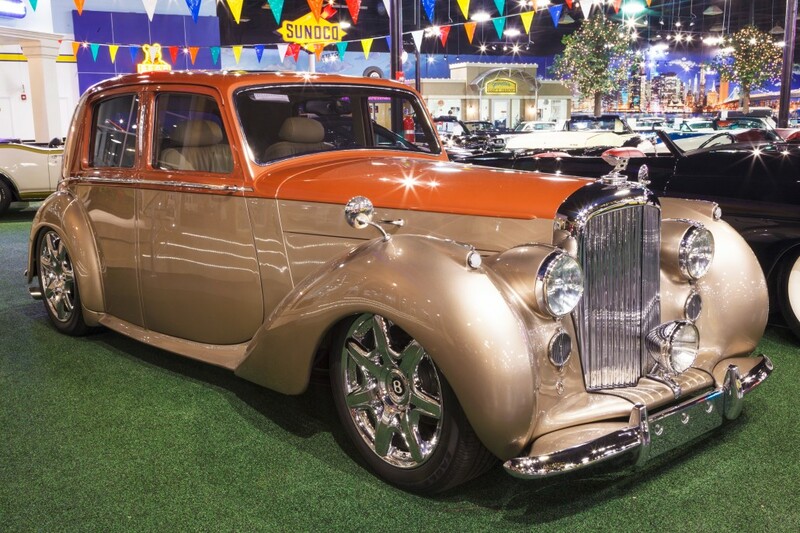 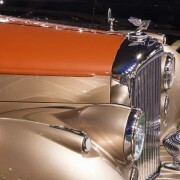 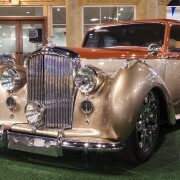 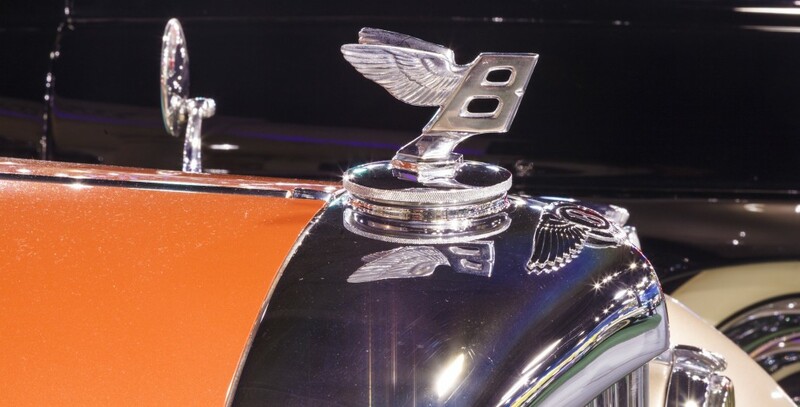 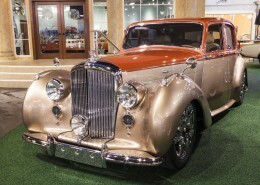 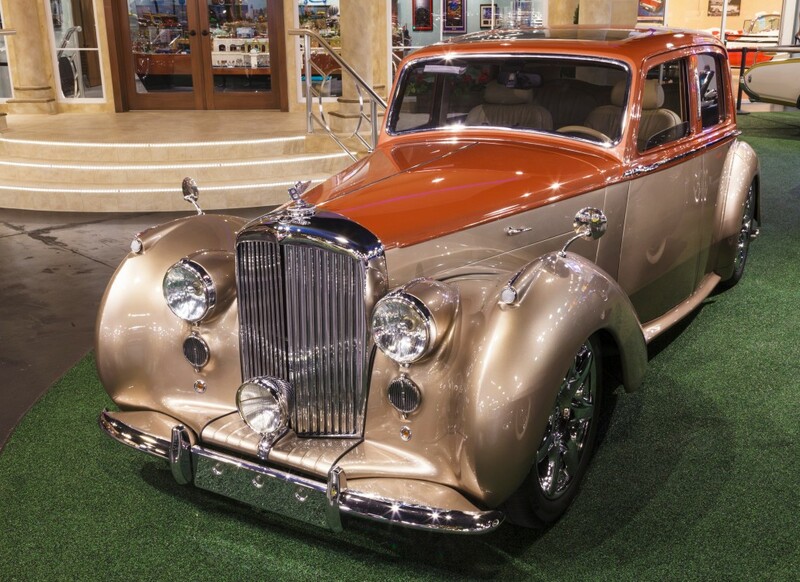 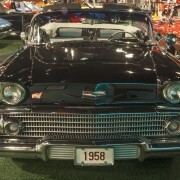 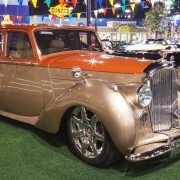 Frame-off restoration, power steering, power seat, power brakes, power windows, power roof, continental kit. 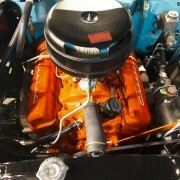 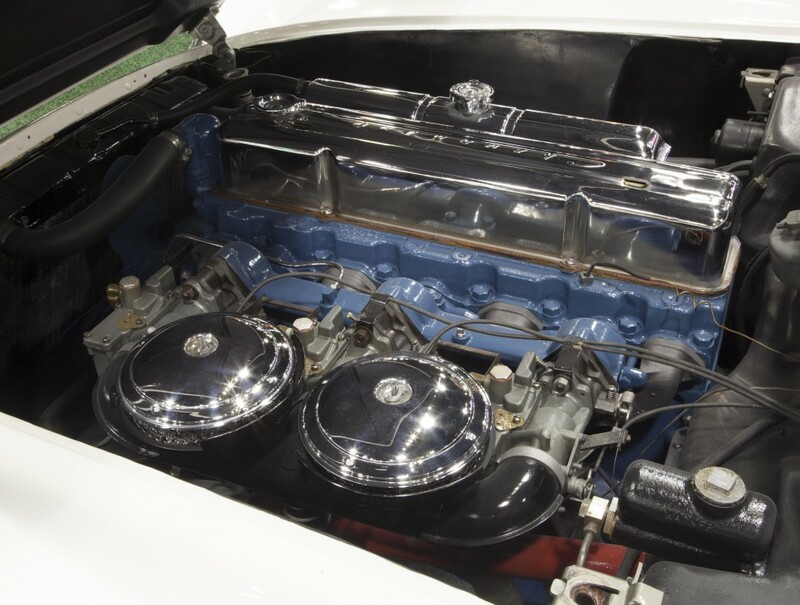 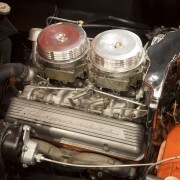 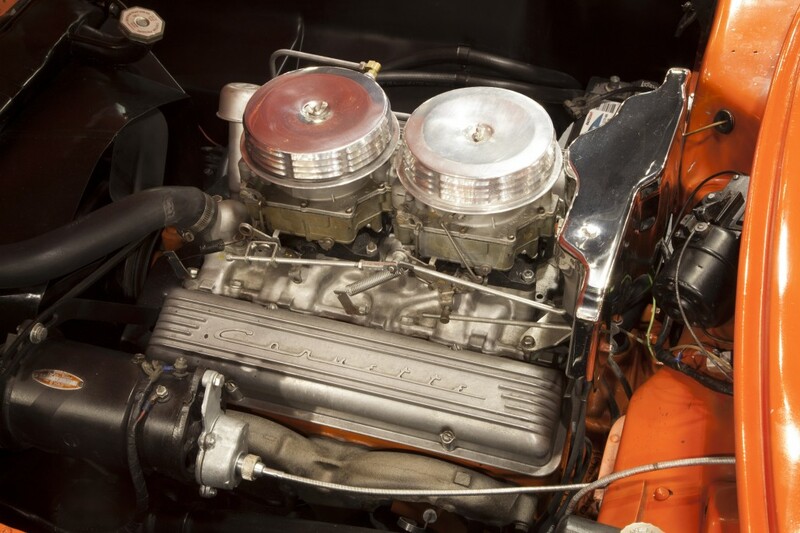 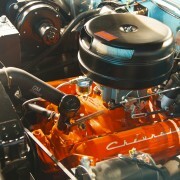 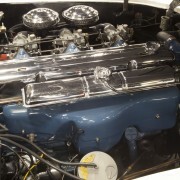 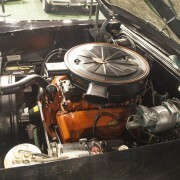 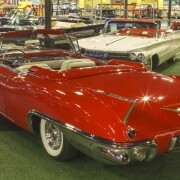 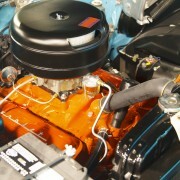 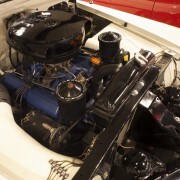 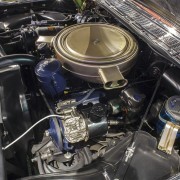 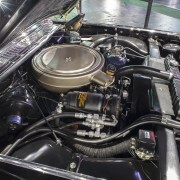 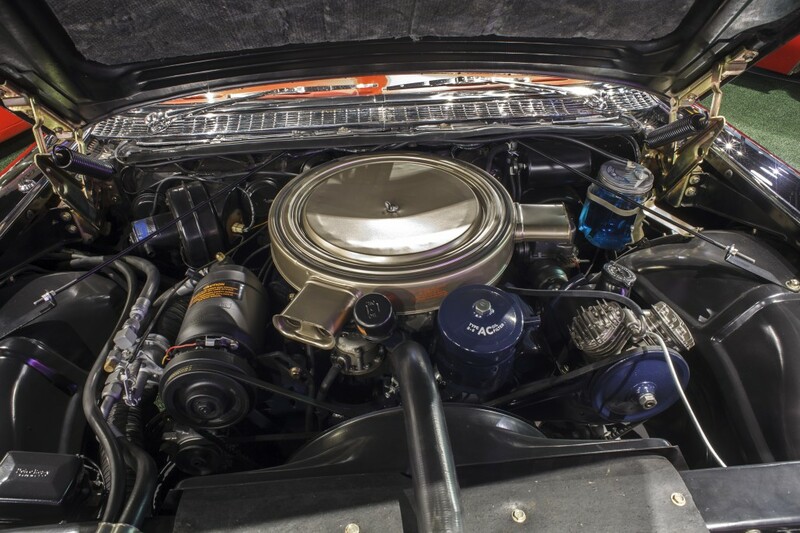 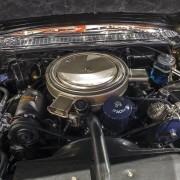 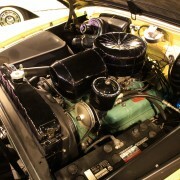 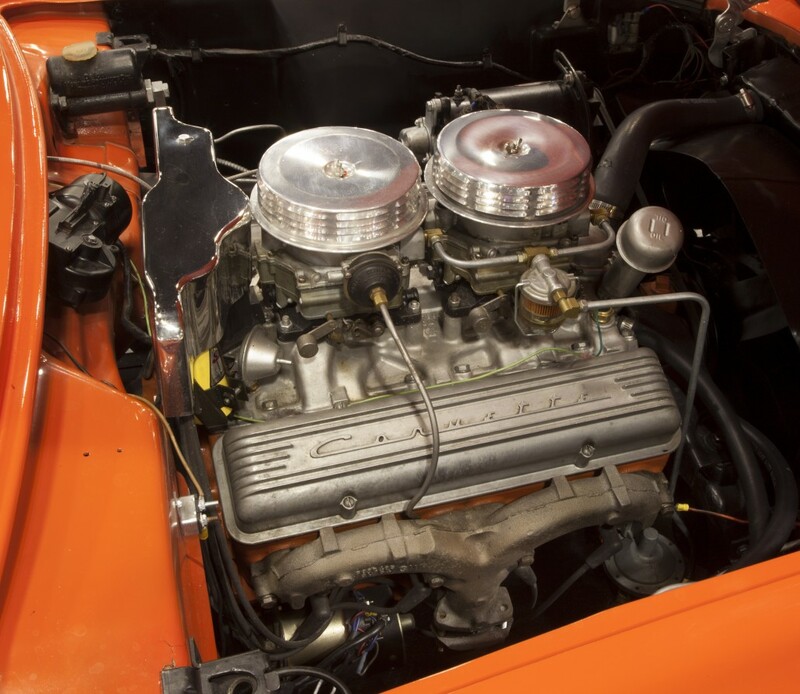 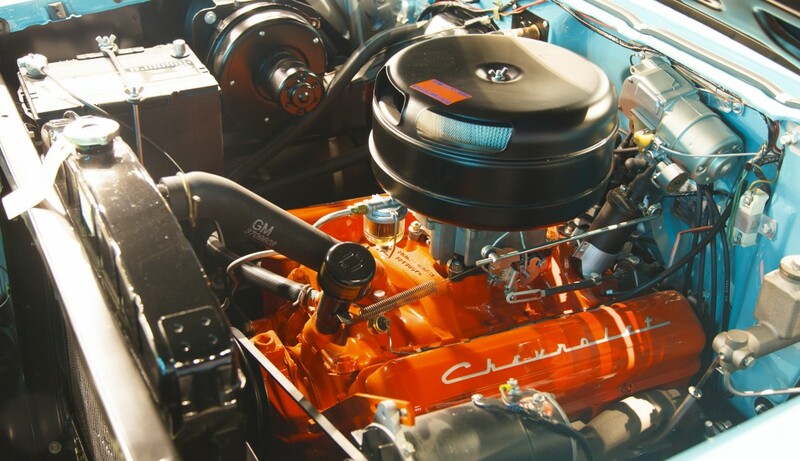 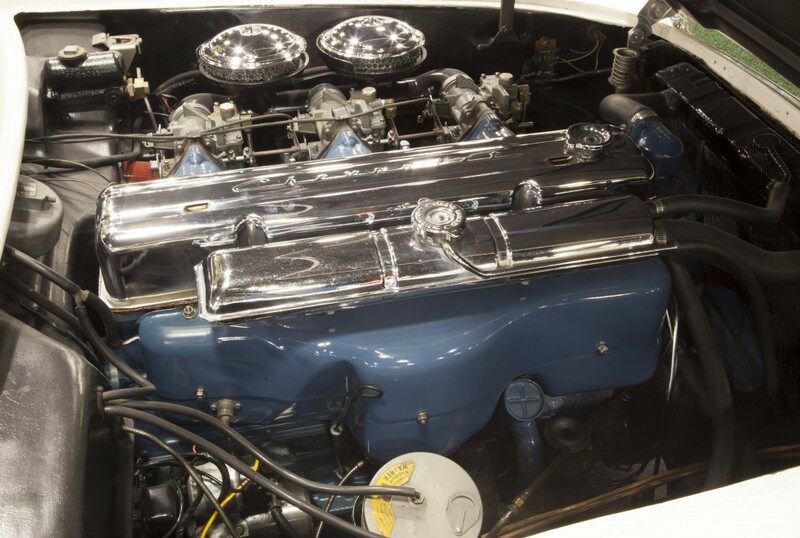 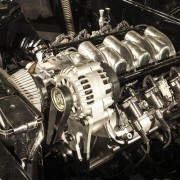 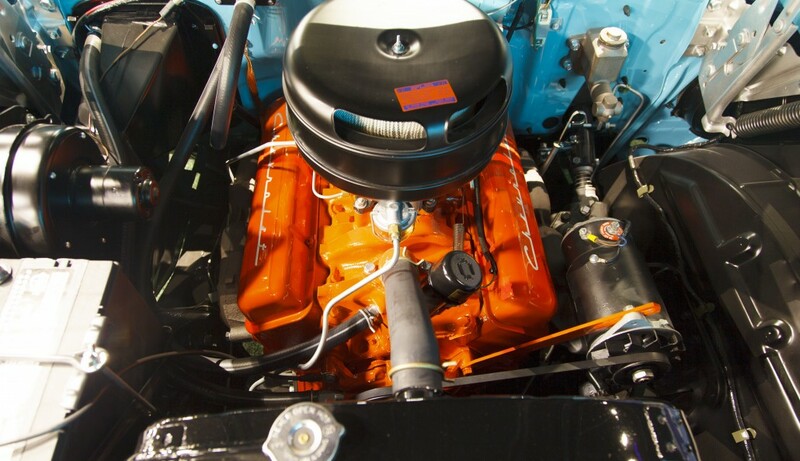 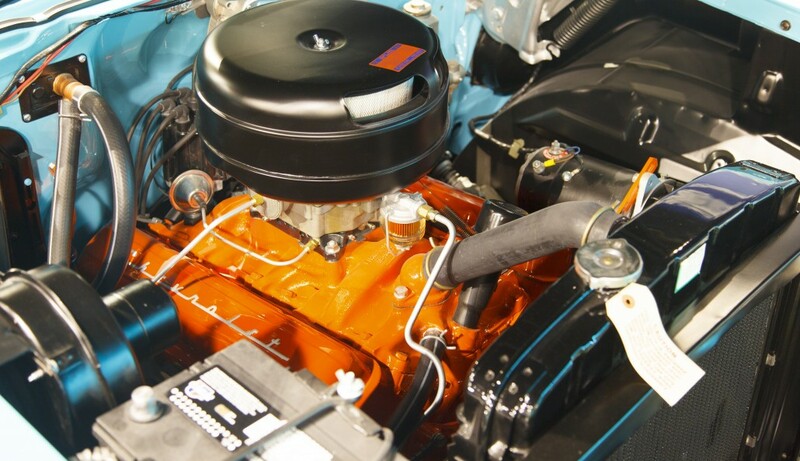 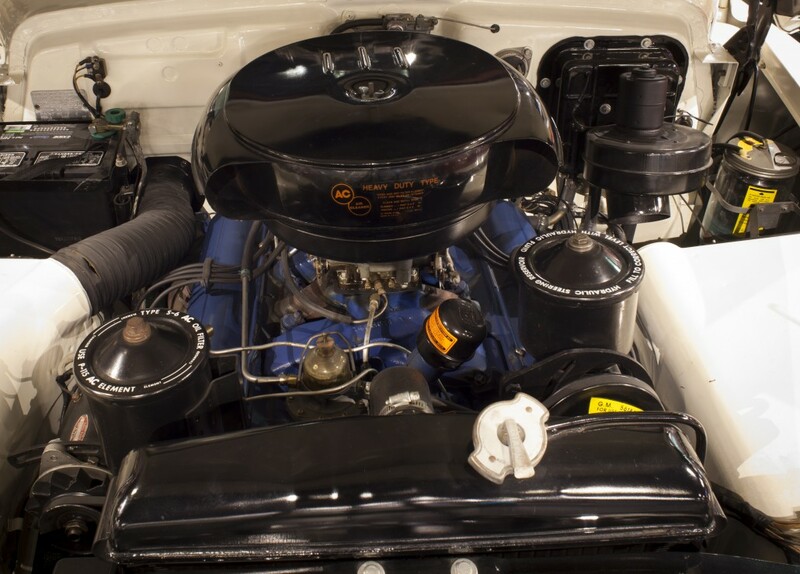 1,800 produced in 1957, 365CID, V8, 325HP, twin 4–barrel carburetors, car weighs in at 4,930 lbs. 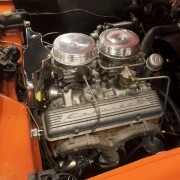 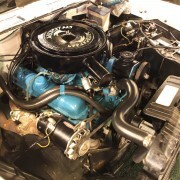 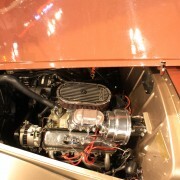 carburetor, power top, one of 815 built. 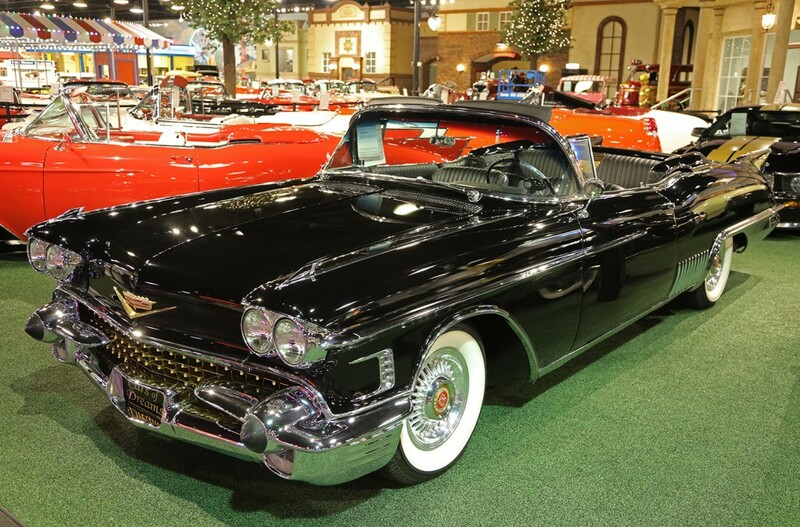 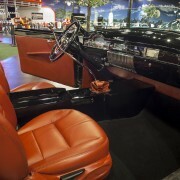 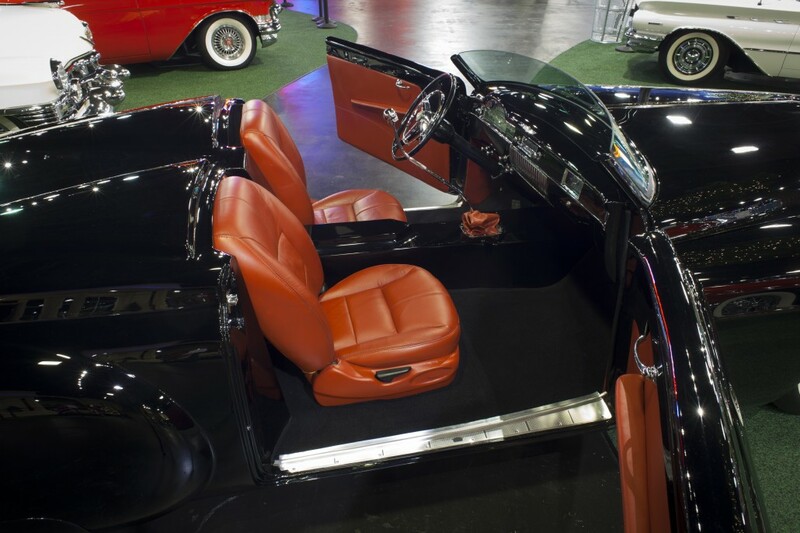 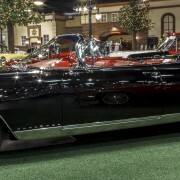 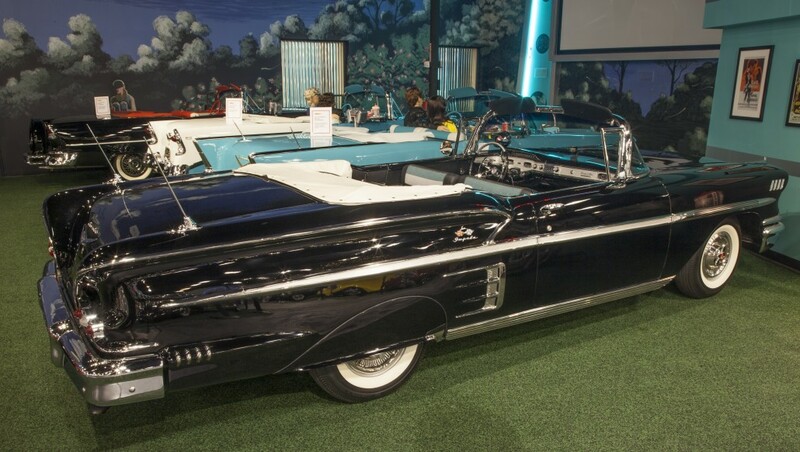 Finished in its original and desirable color of ebony over red, standard features include a heater, fog lamps, air suspension, 6–way power seat, power top, remote control trunk lid lock, electric door locks. 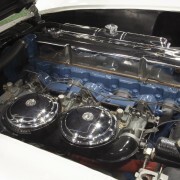 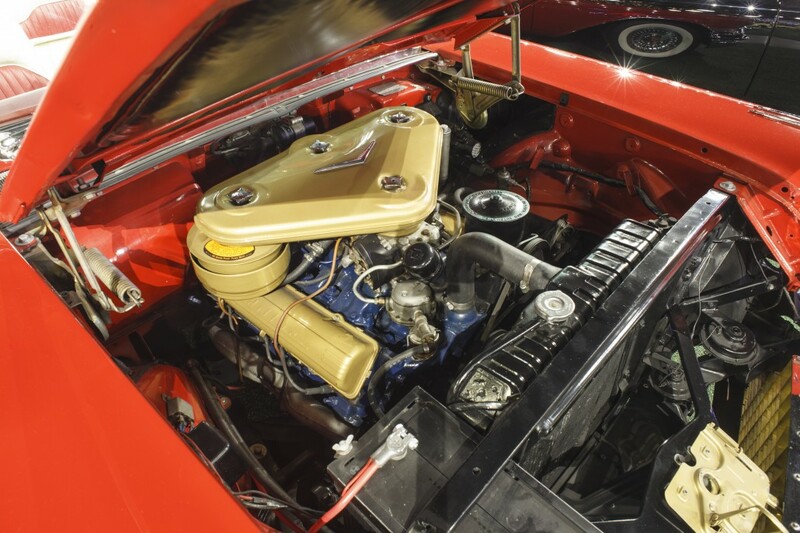 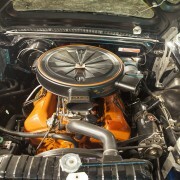 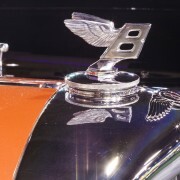 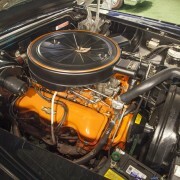 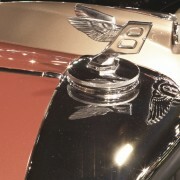 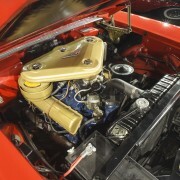 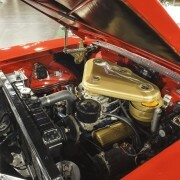 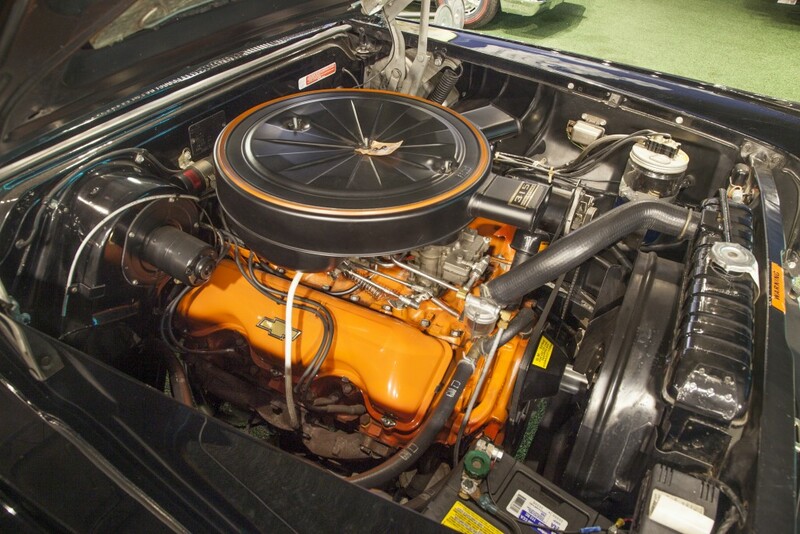 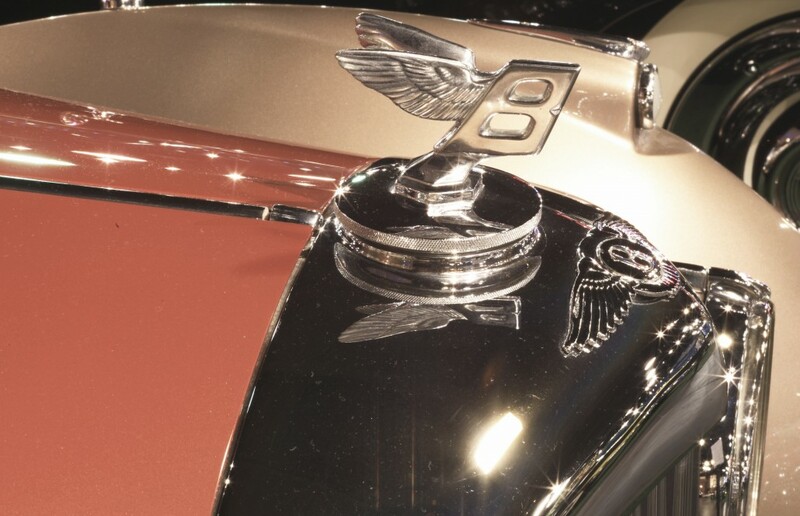 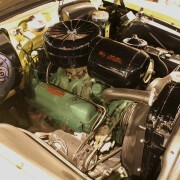 Only 1,285 of this V8 model were built, correct 390 engine with Tri-power and set-up Parade boot, automatic transmission. 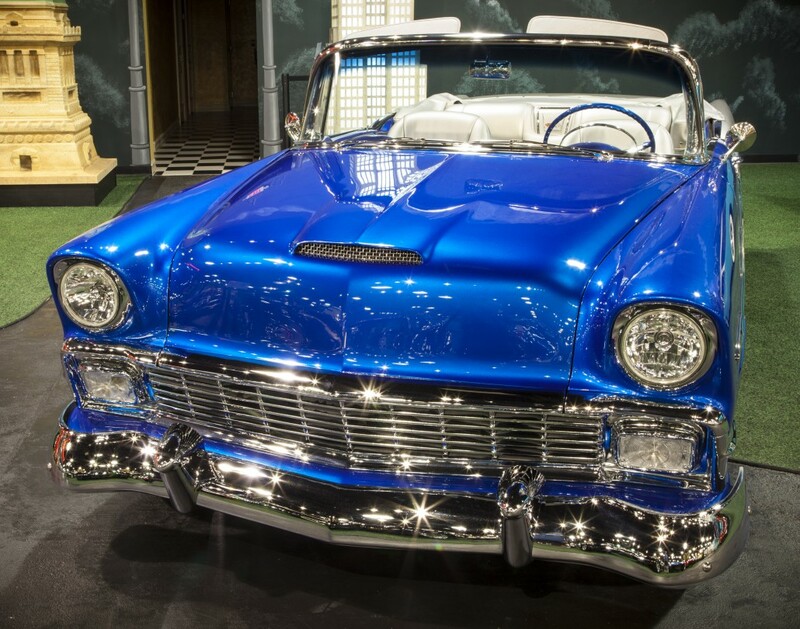 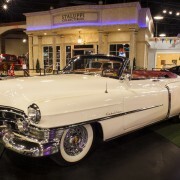 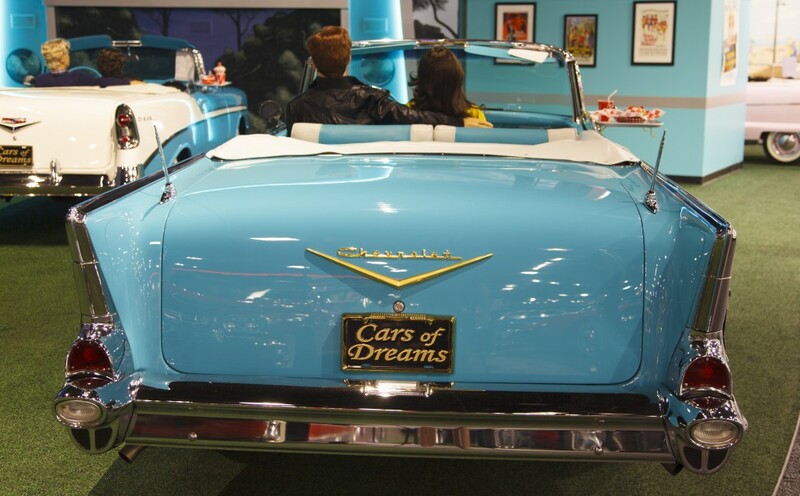 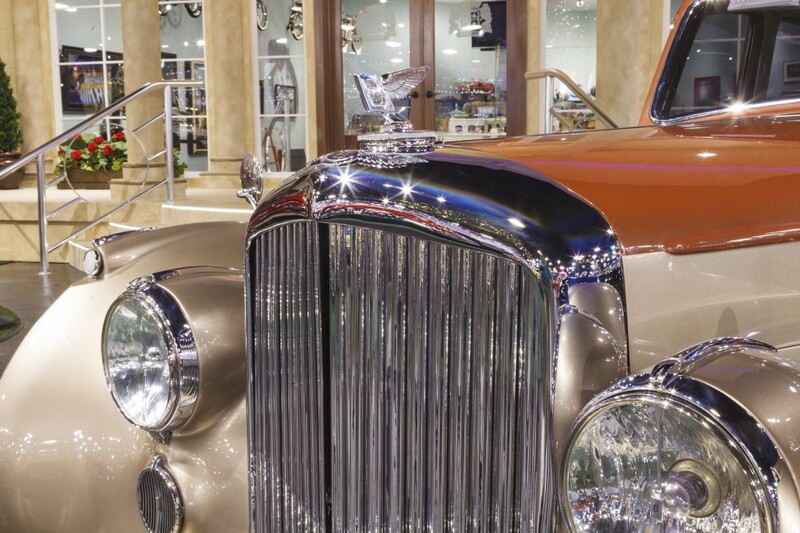 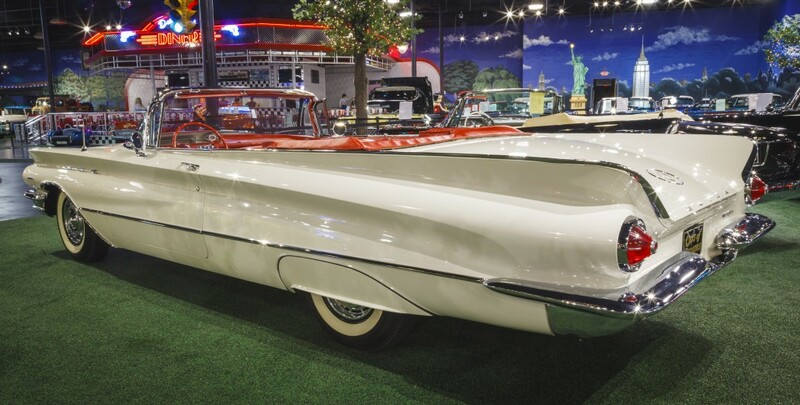 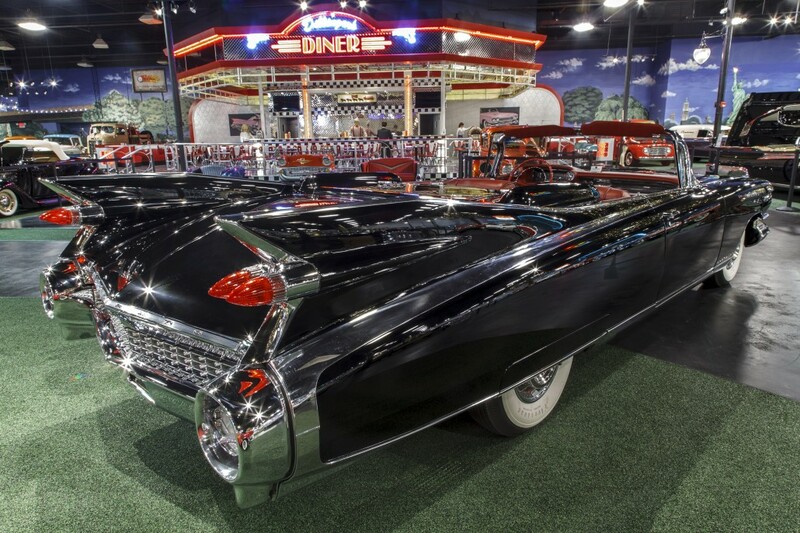 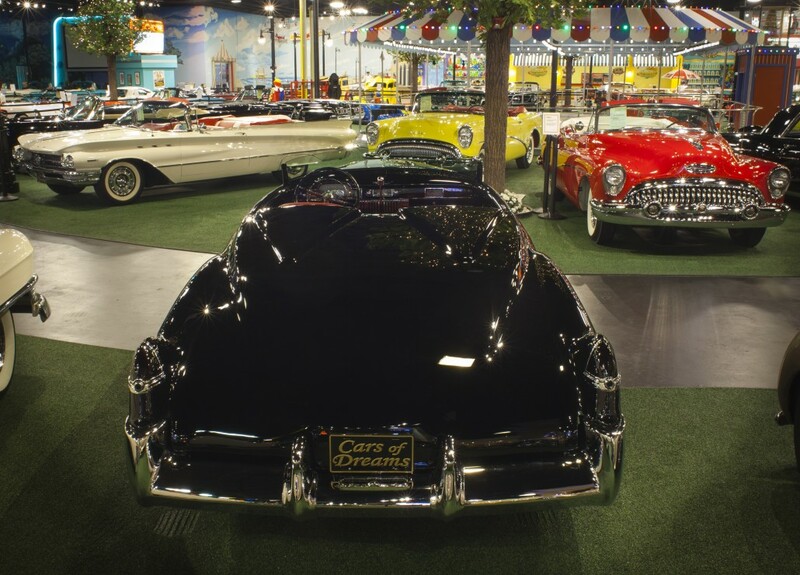 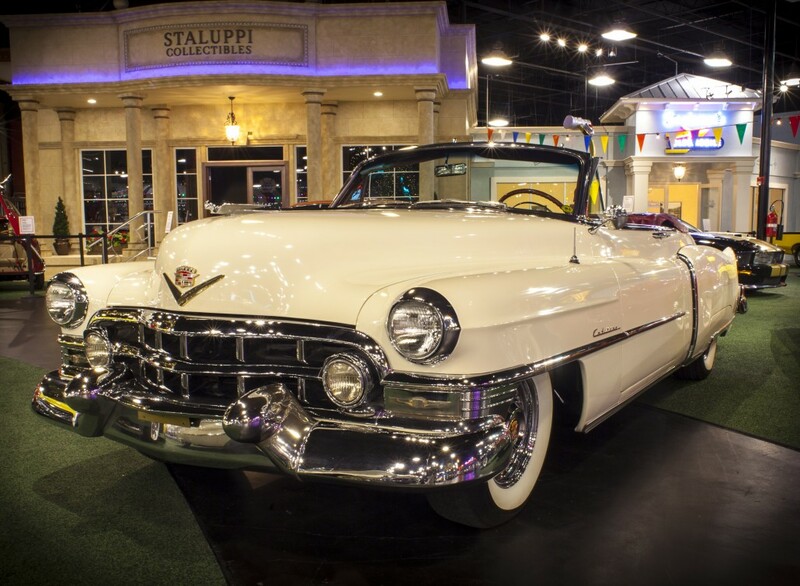 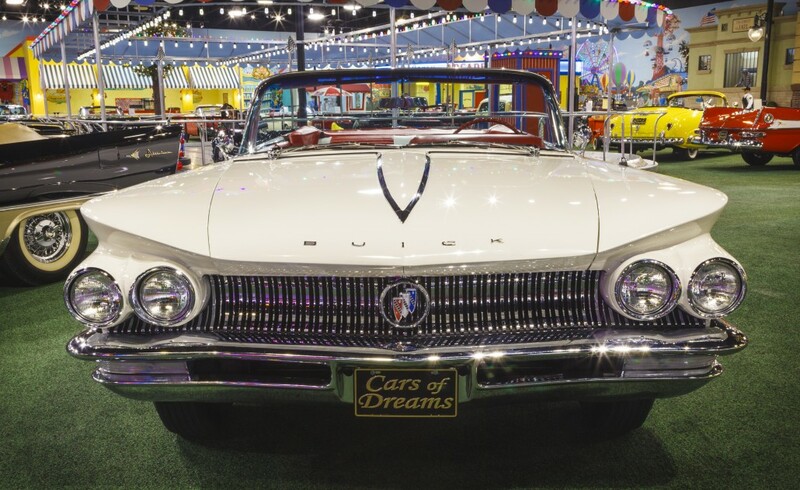 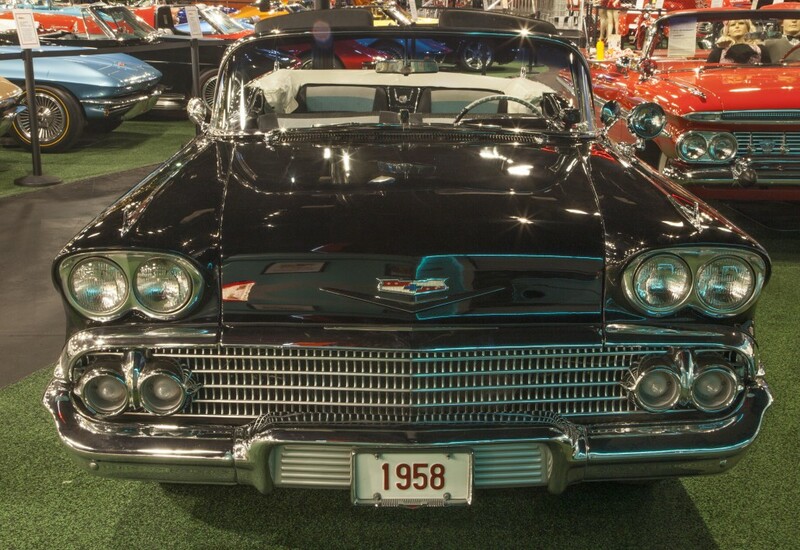 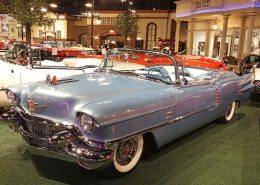 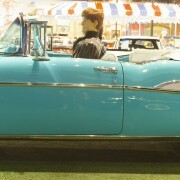 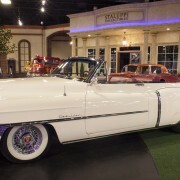 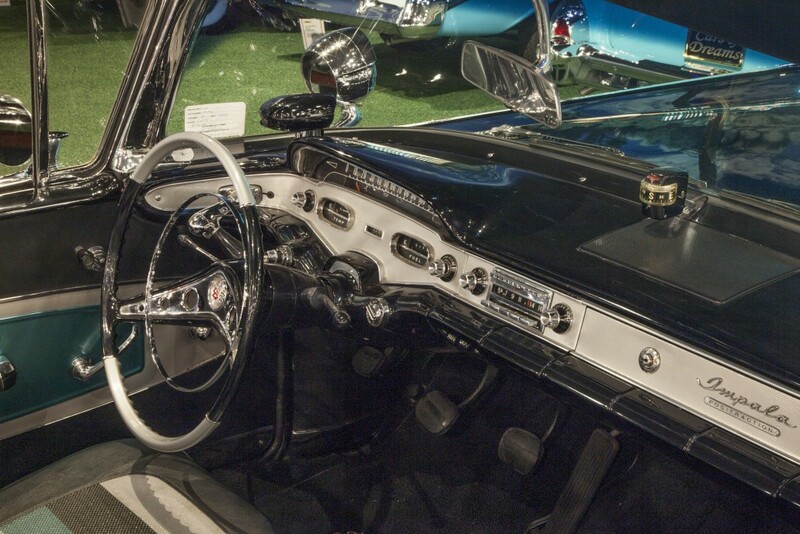 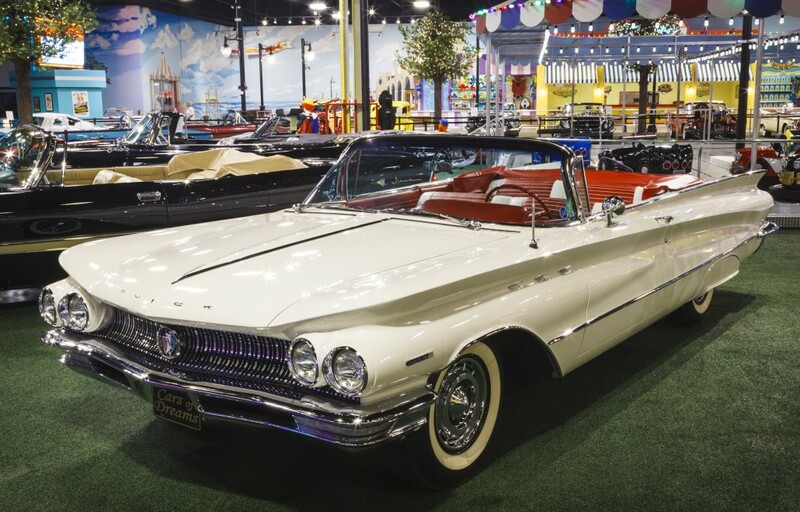 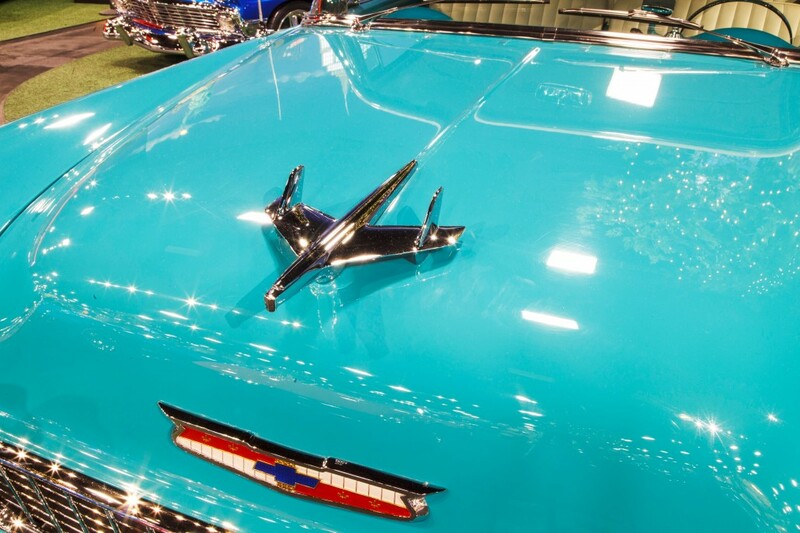 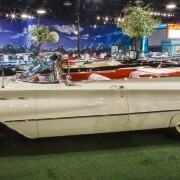 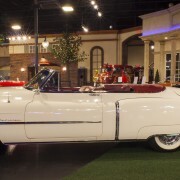 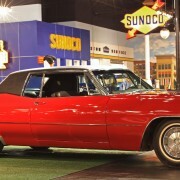 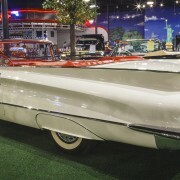 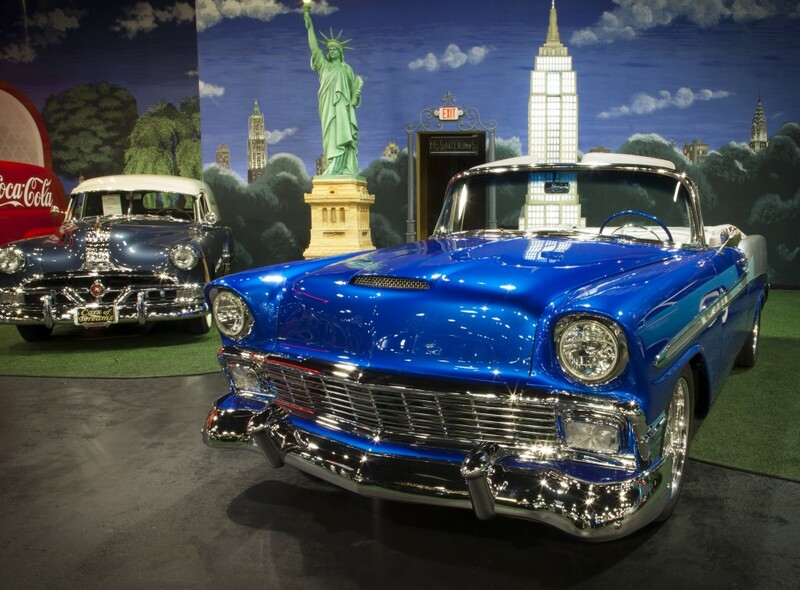 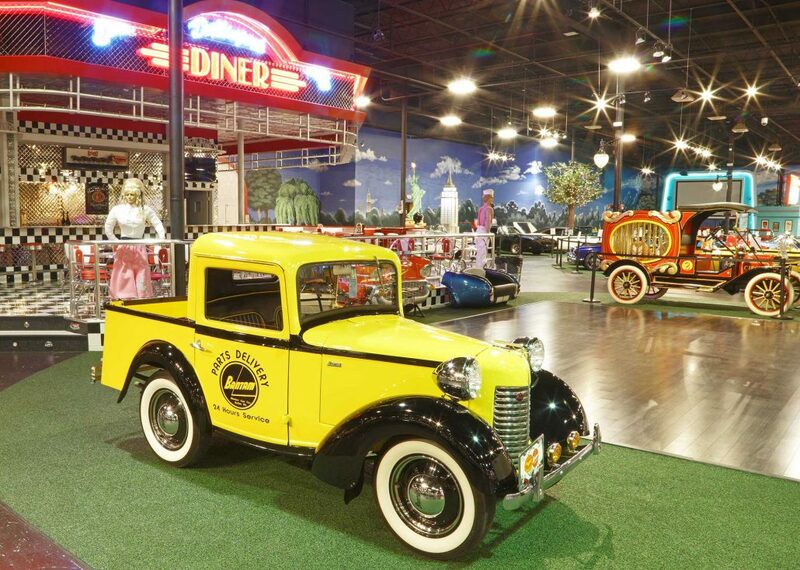 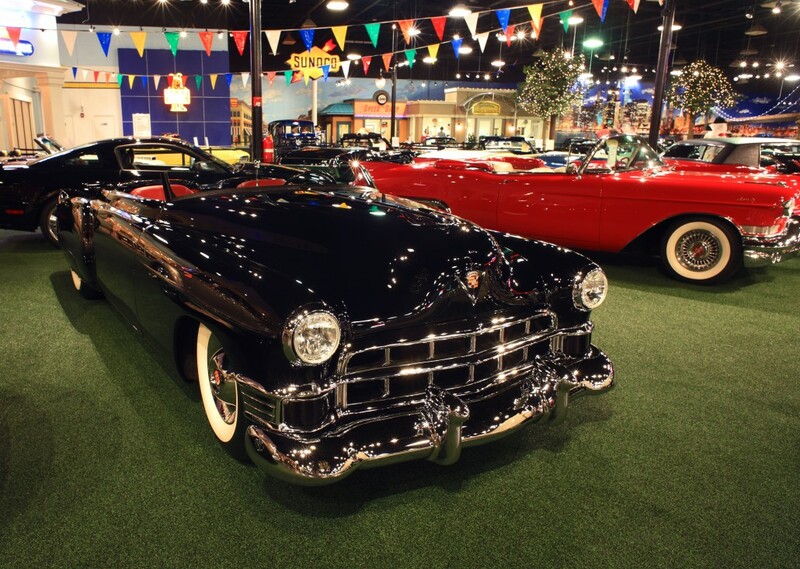 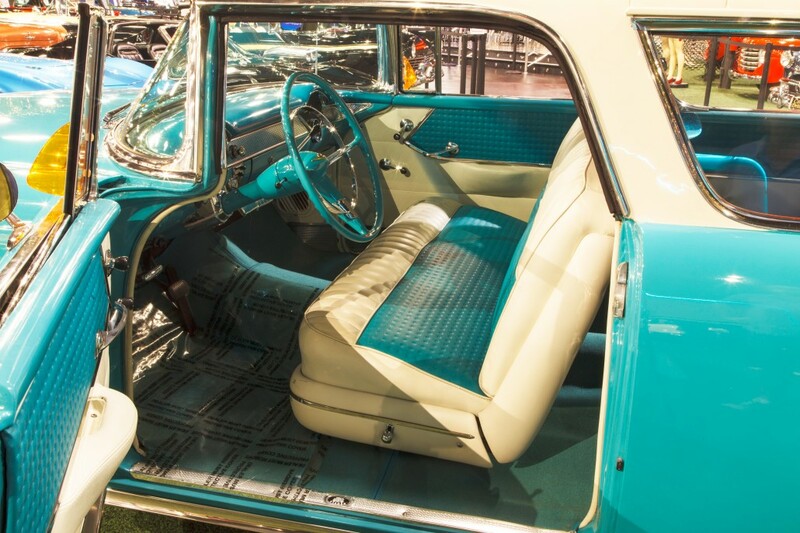 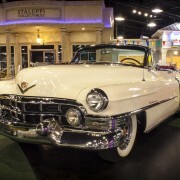 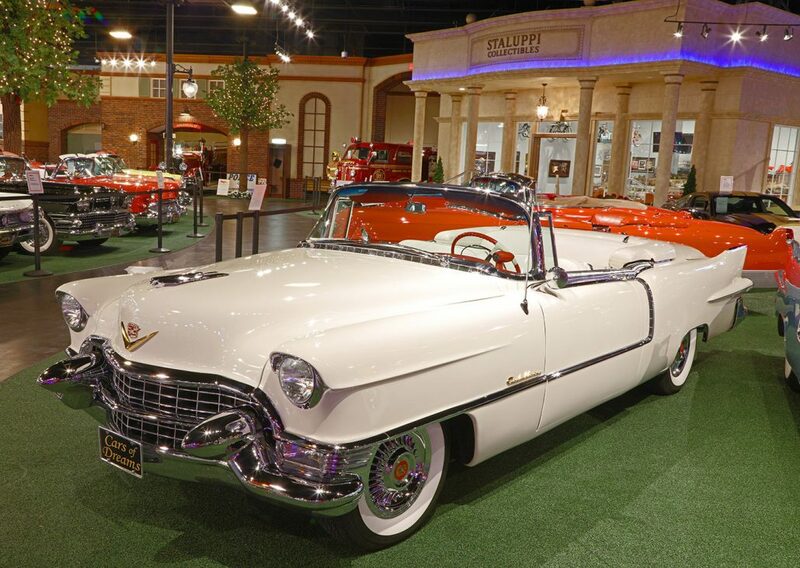 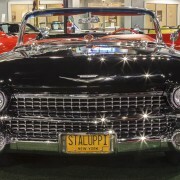 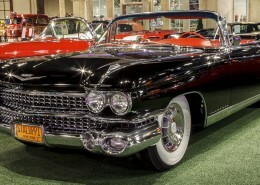 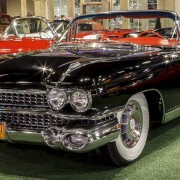 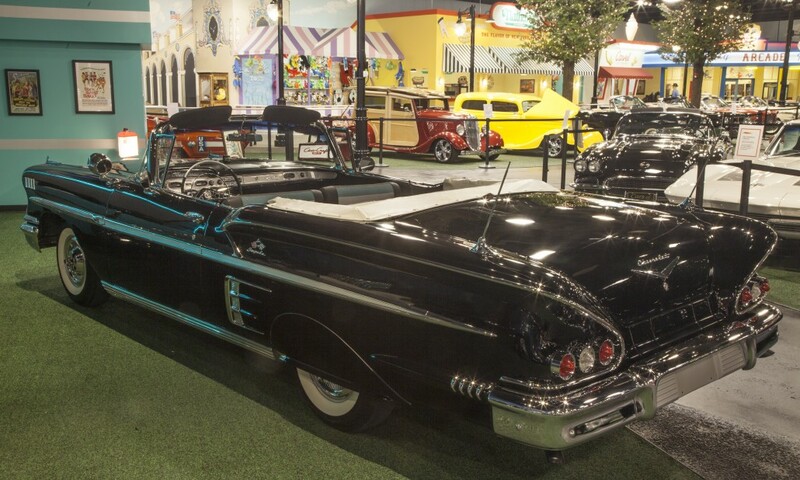 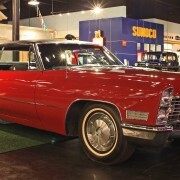 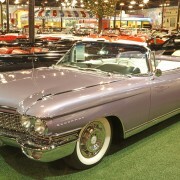 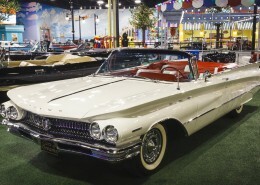 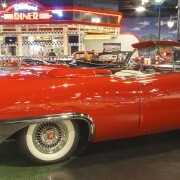 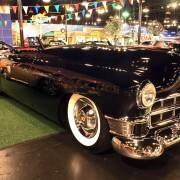 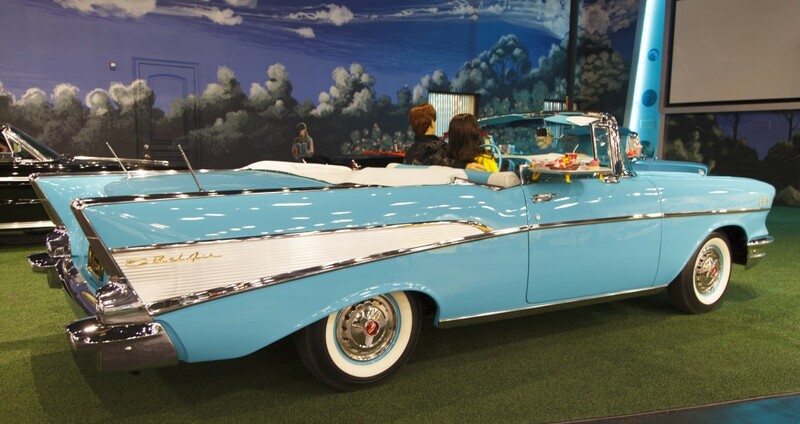 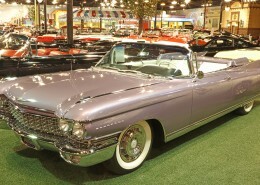 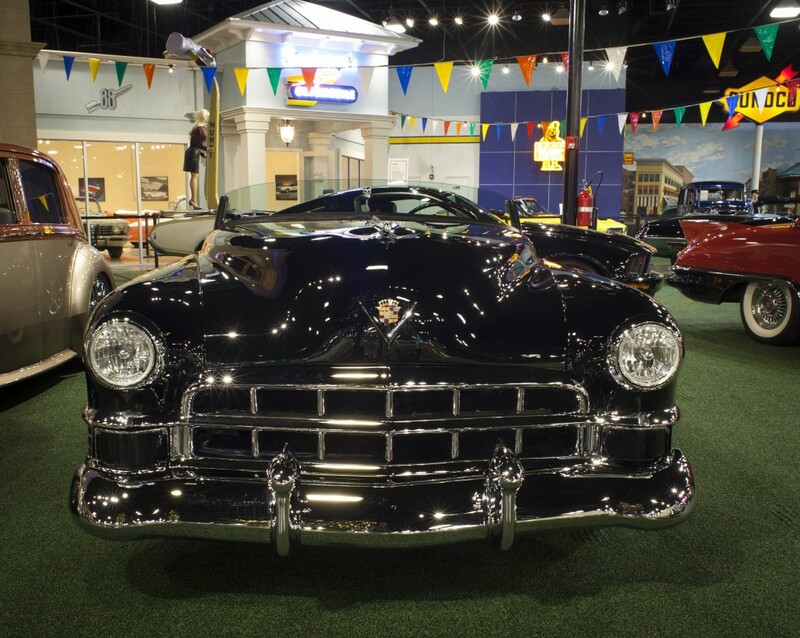 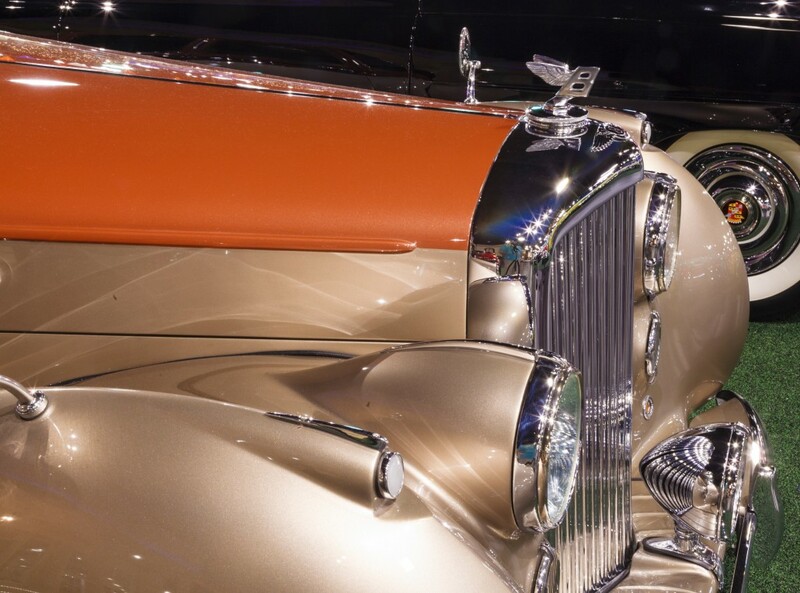 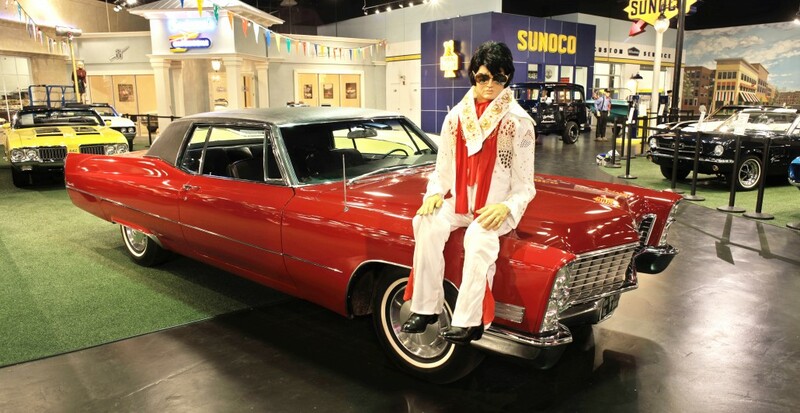 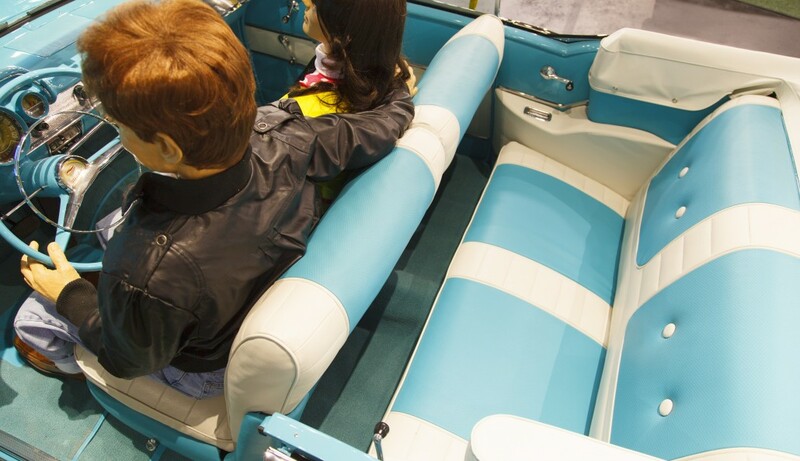 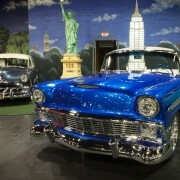 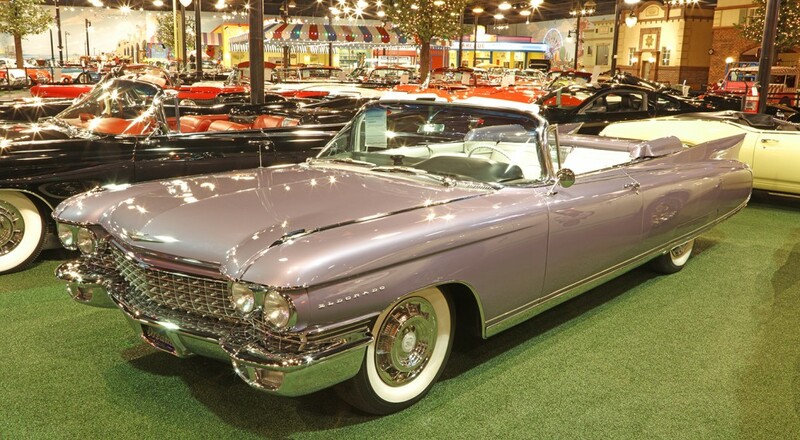 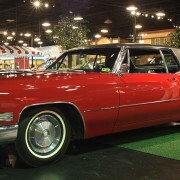 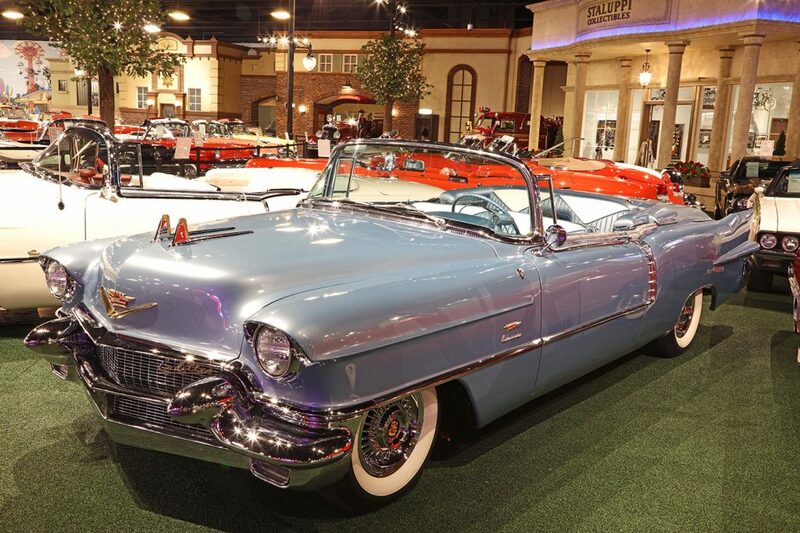 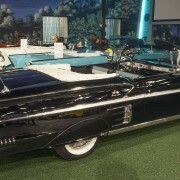 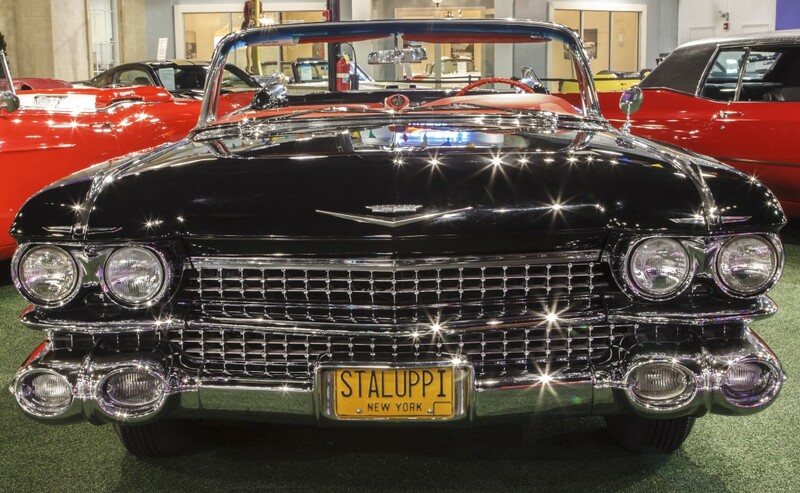 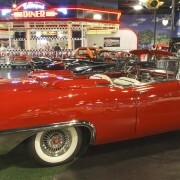 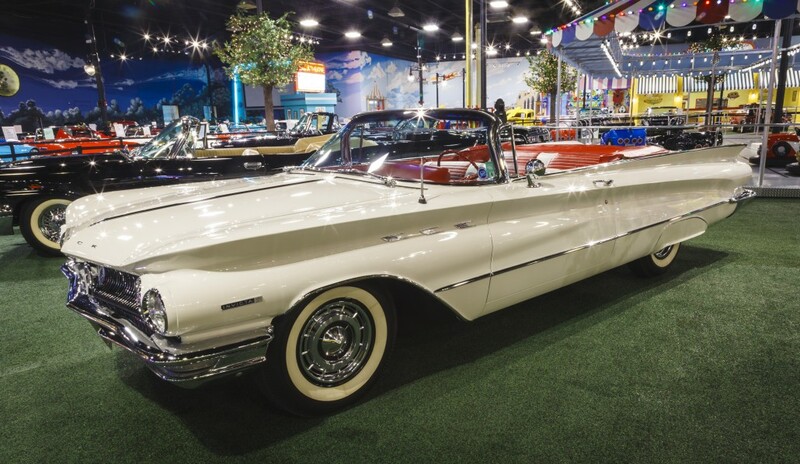 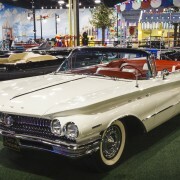 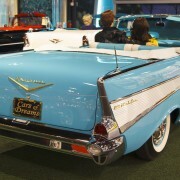 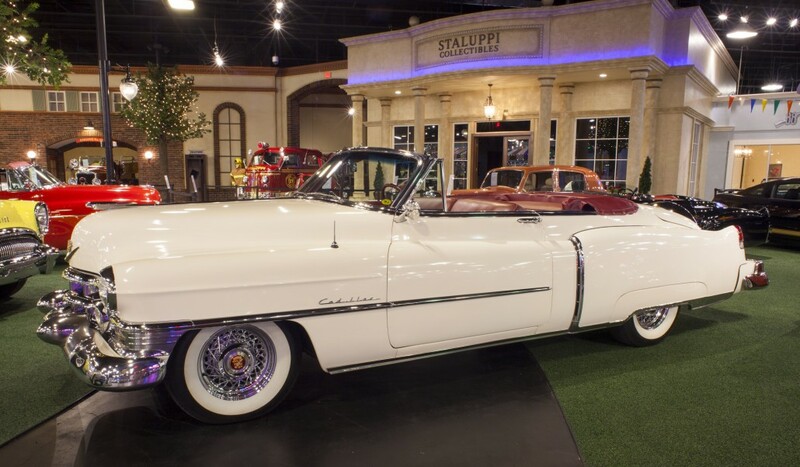 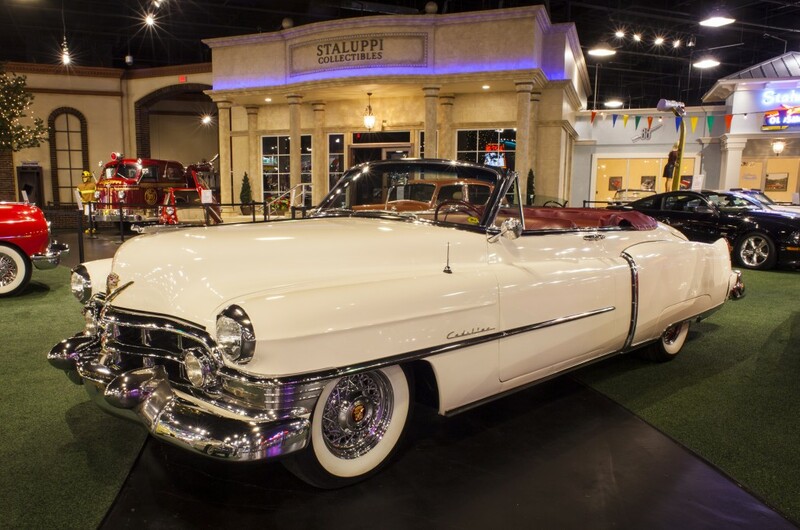 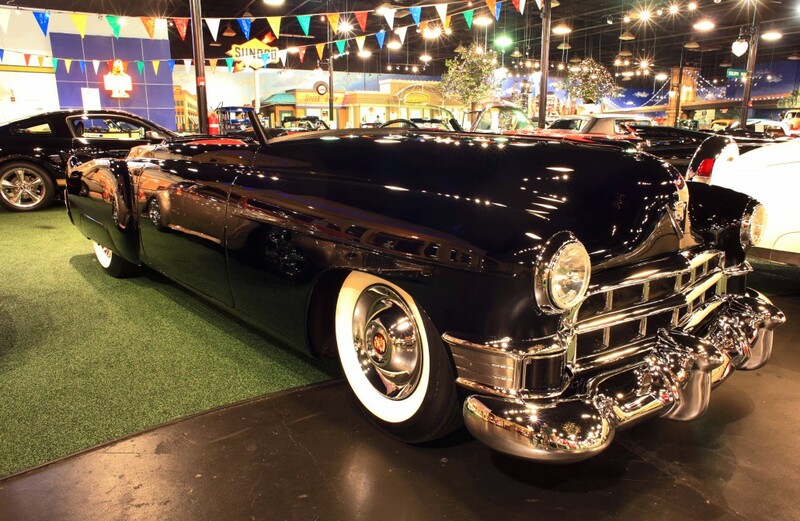 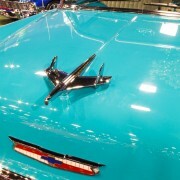 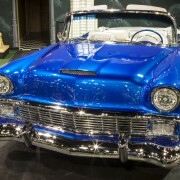 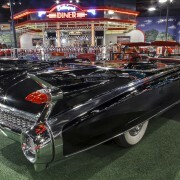 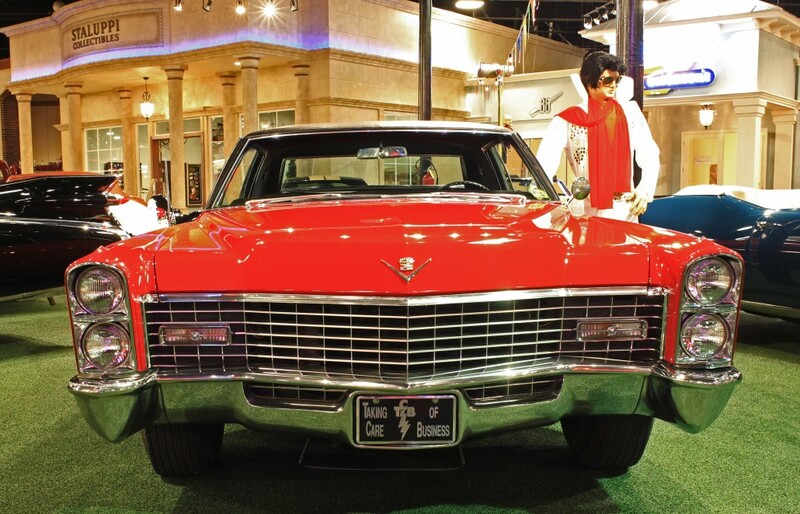 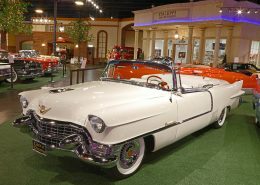 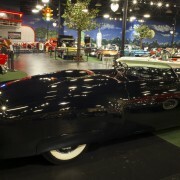 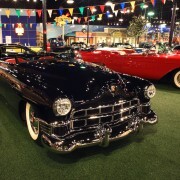 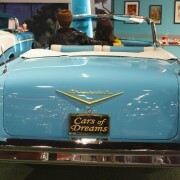 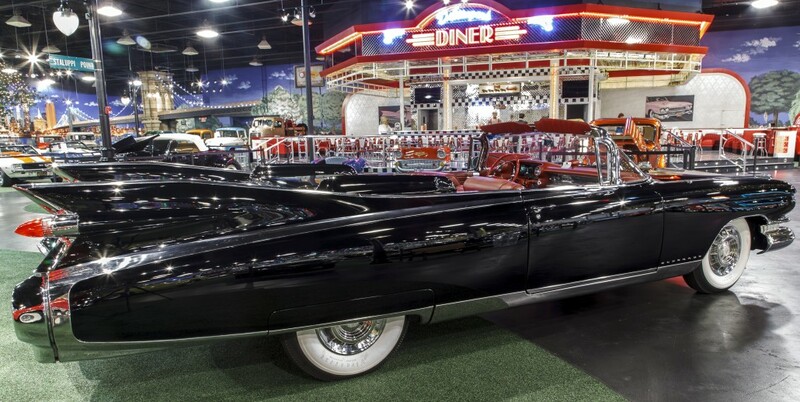 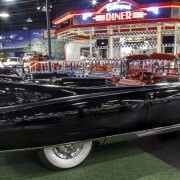 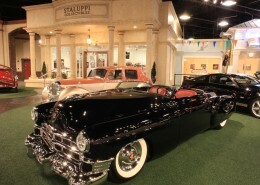 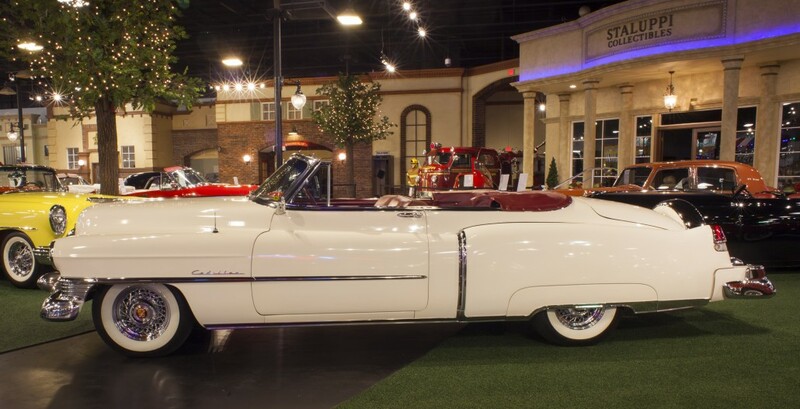 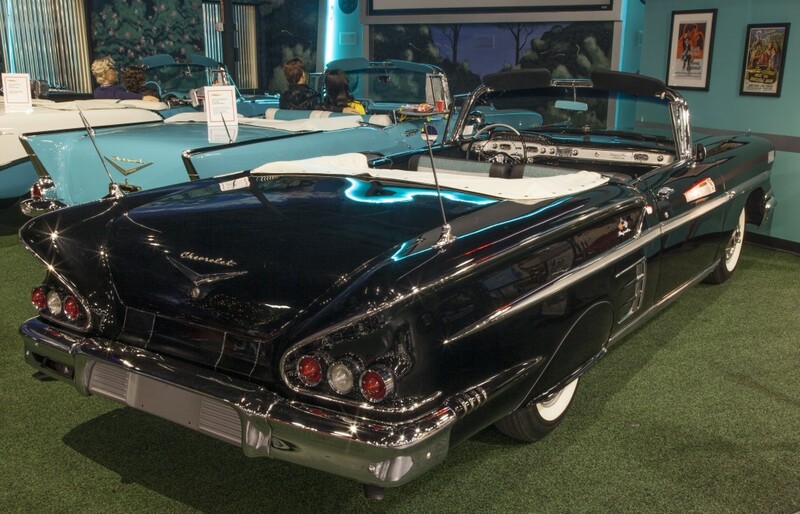 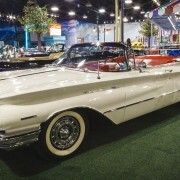 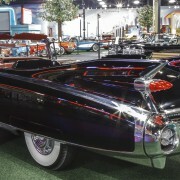 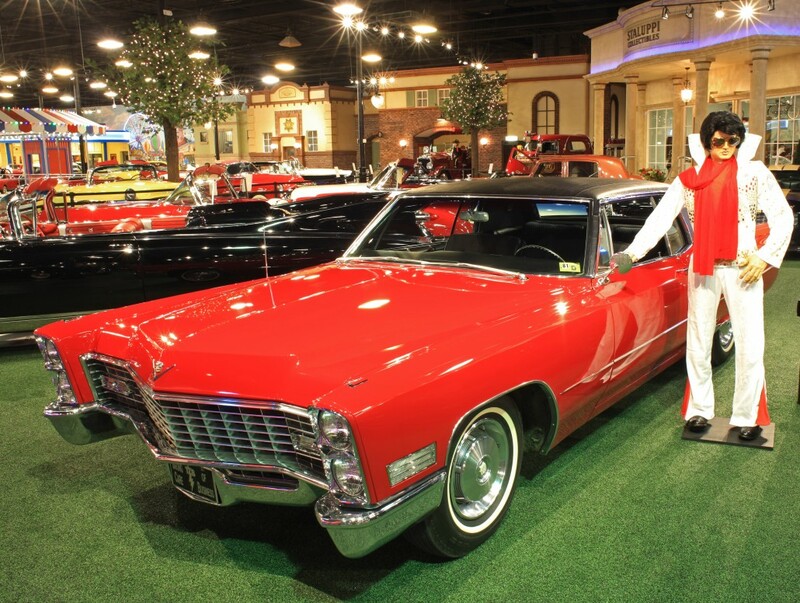 Elvis Presley’s 1967 Cadillac Coupe De Ville has been part of Mike L. Moon’s private collection since 1979 and has been on display at the Elvis Presley Museums in Pigeon Forge, TN and Niagara Falls, Canada ever since. 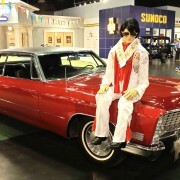 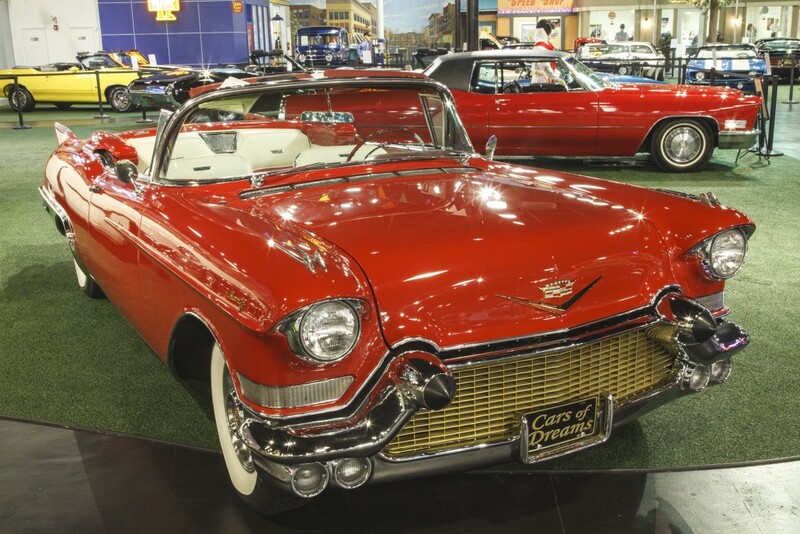 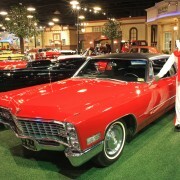 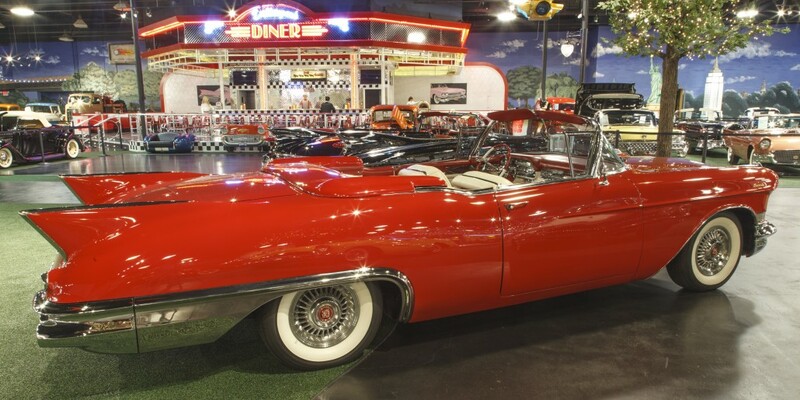 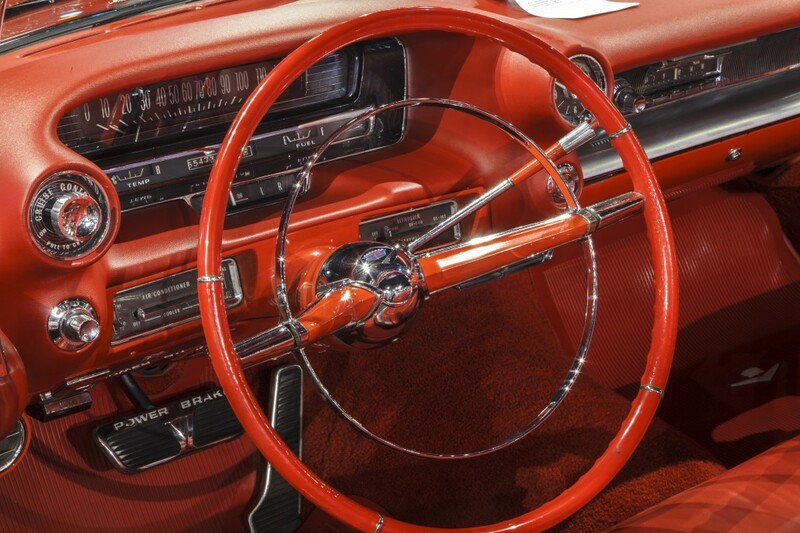 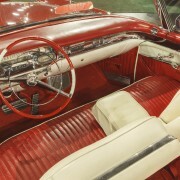 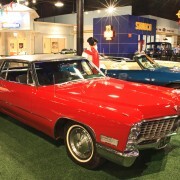 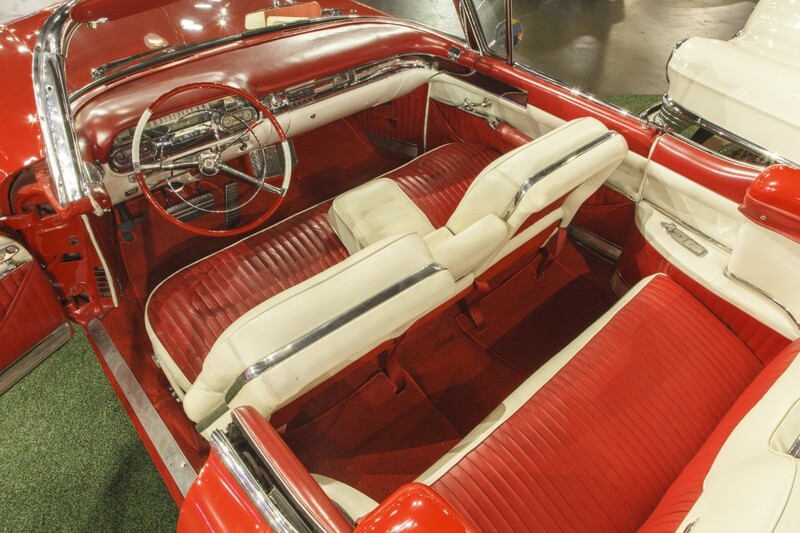 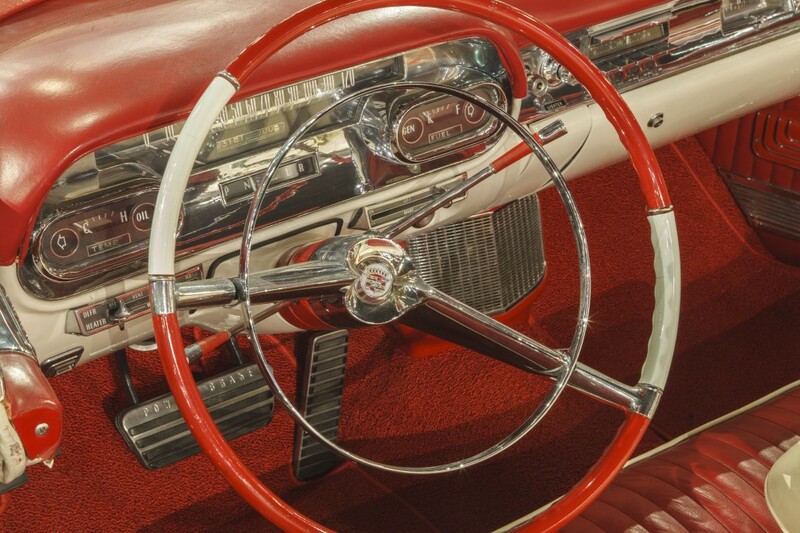 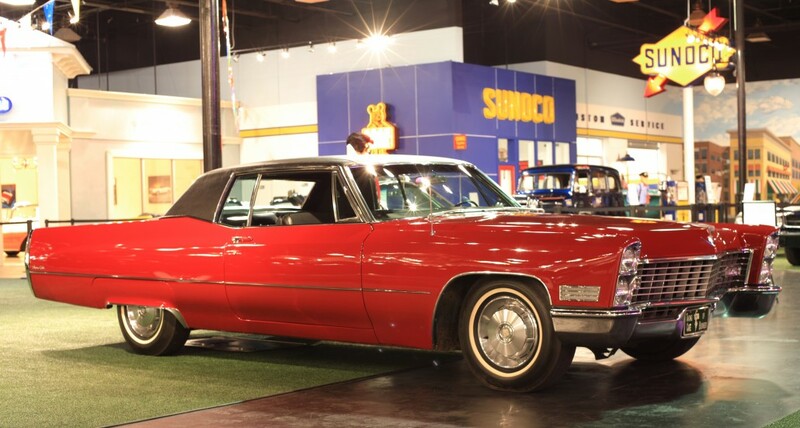 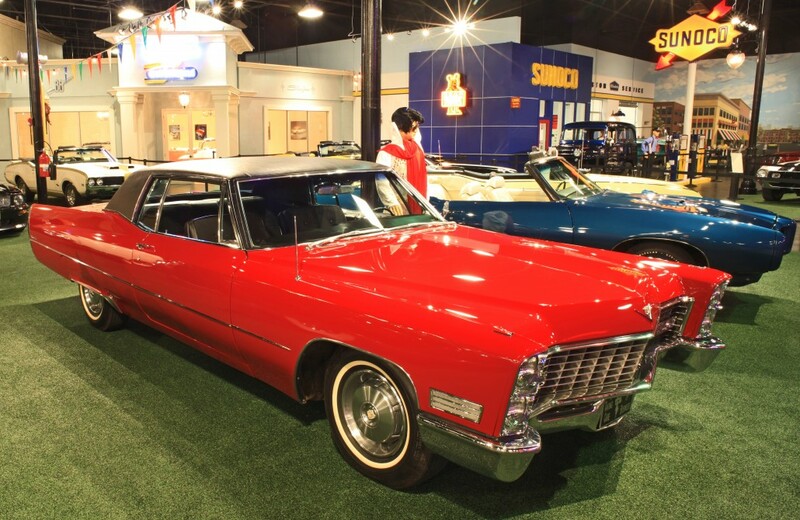 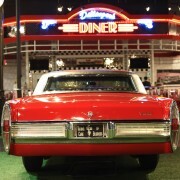 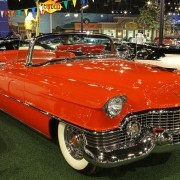 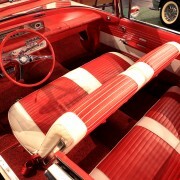 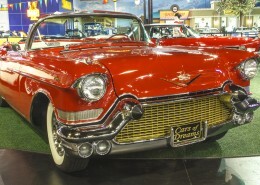 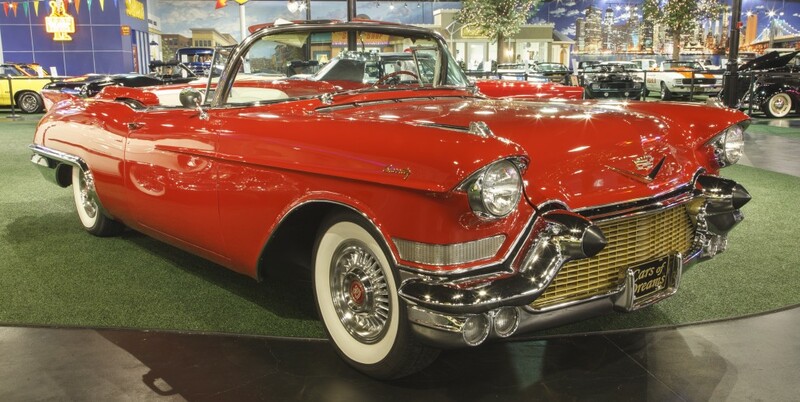 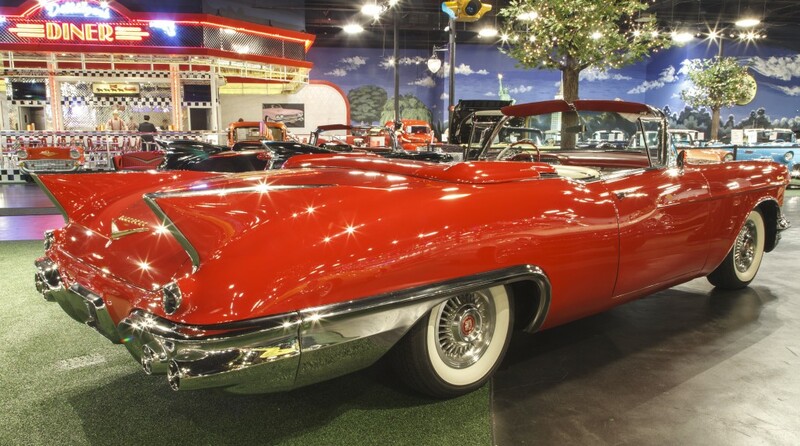 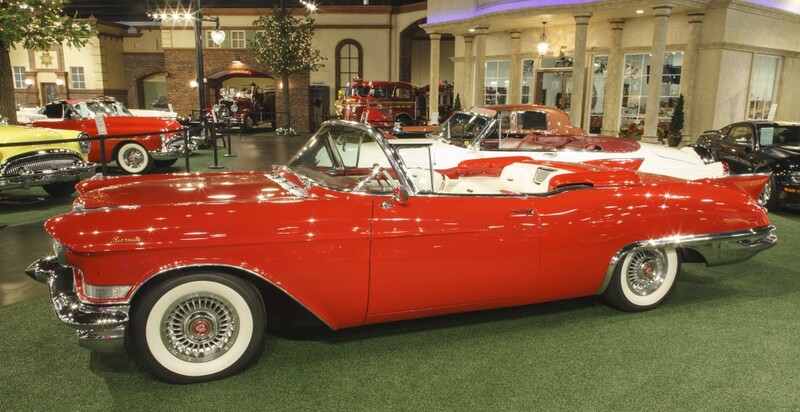 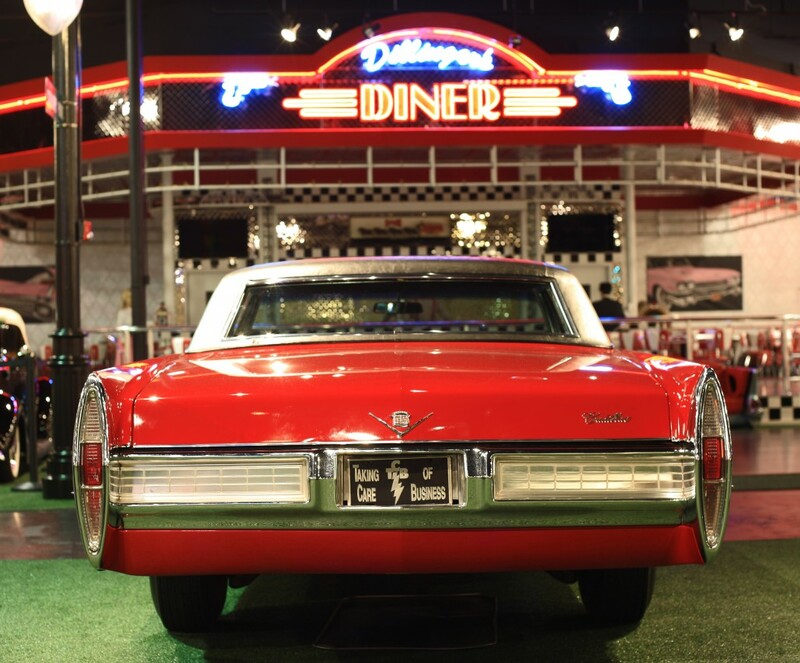 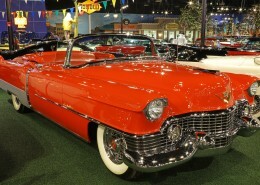 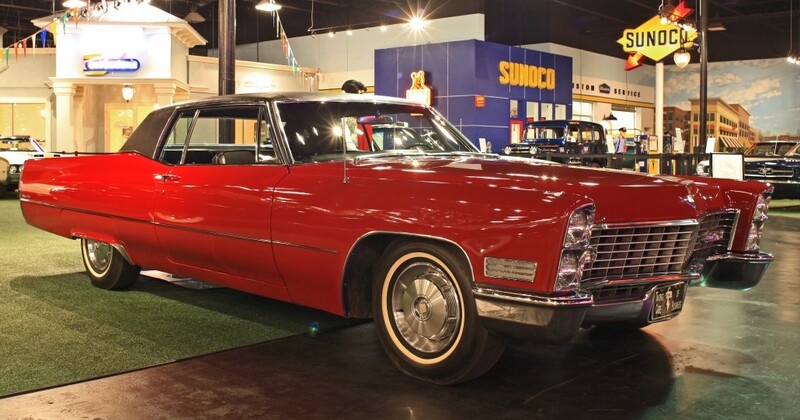 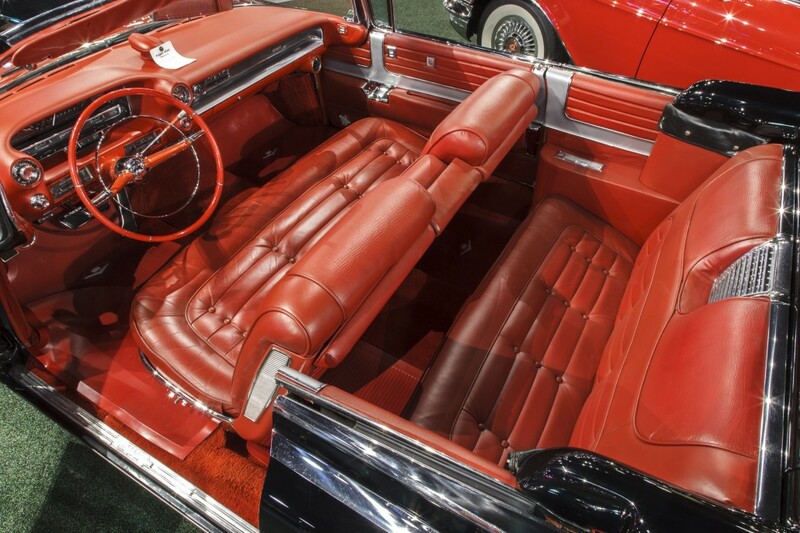 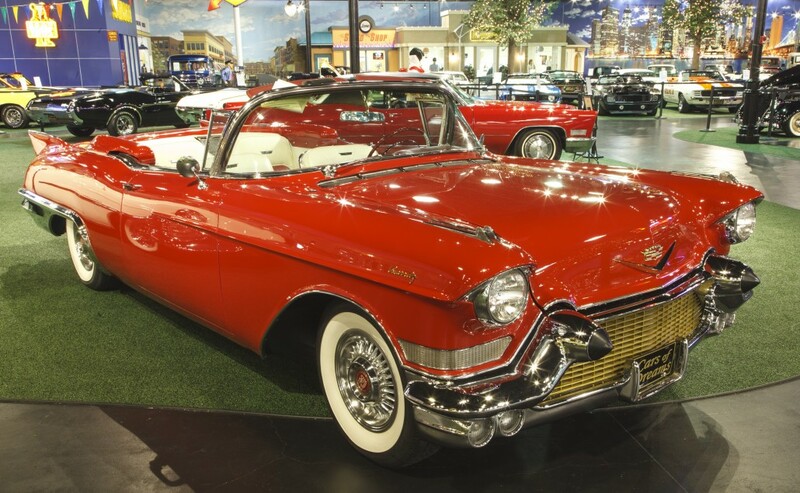 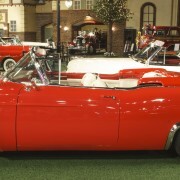 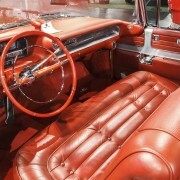 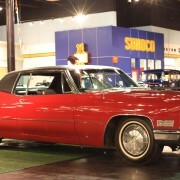 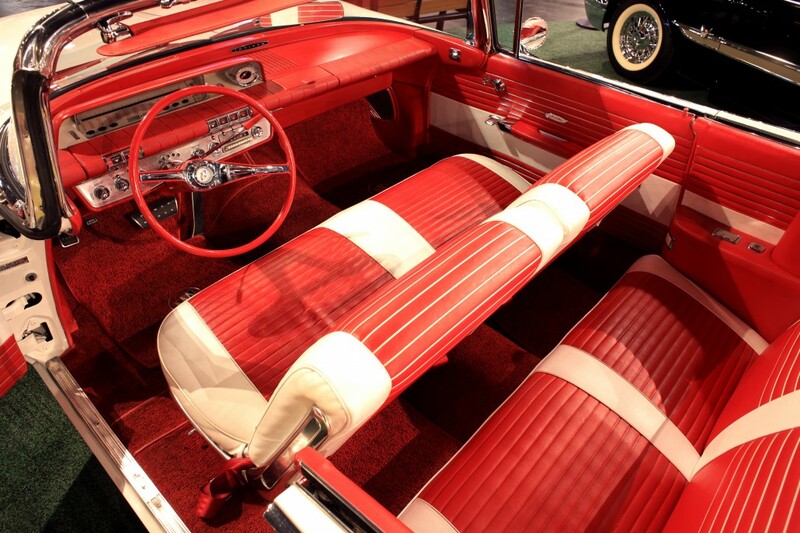 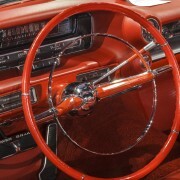 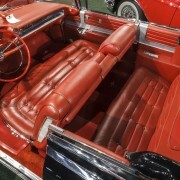 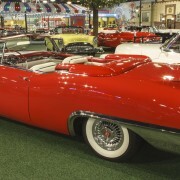 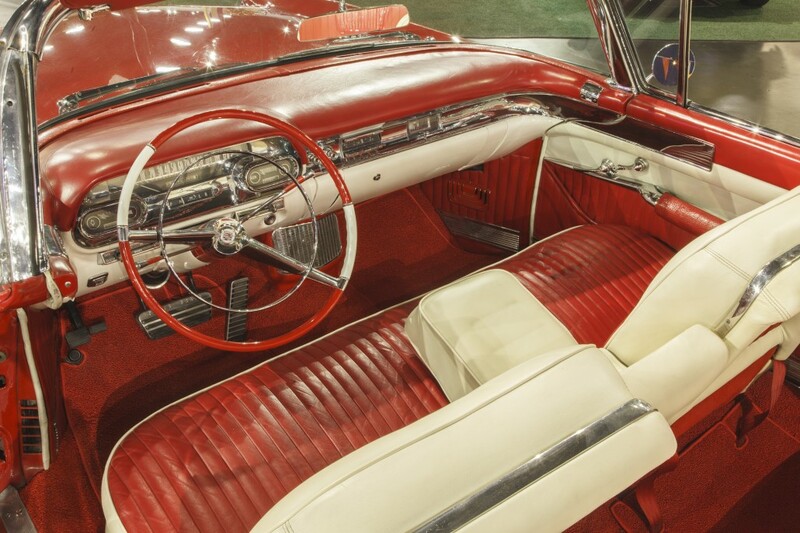 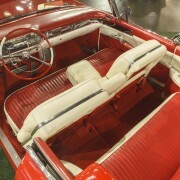 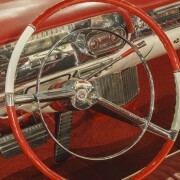 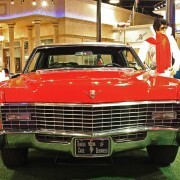 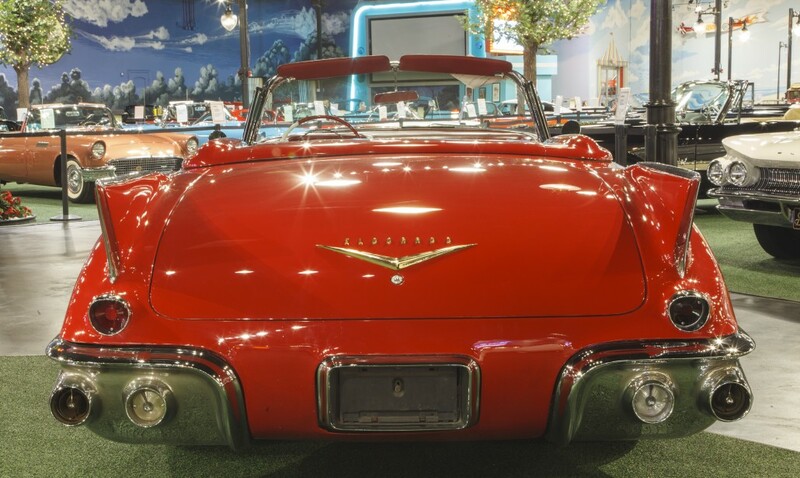 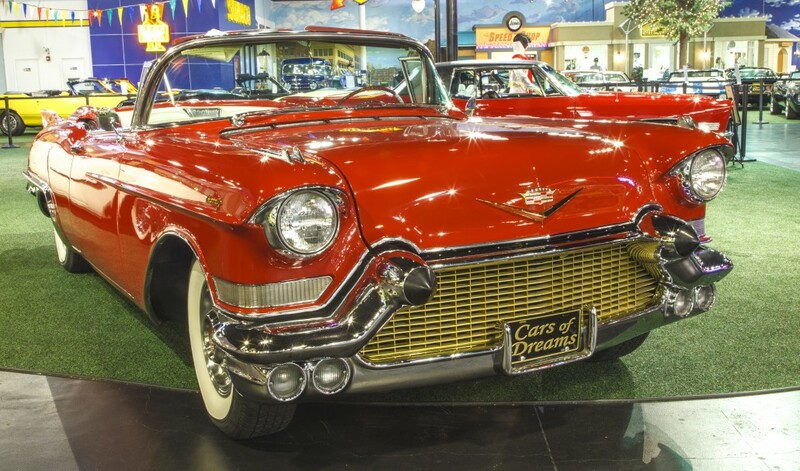 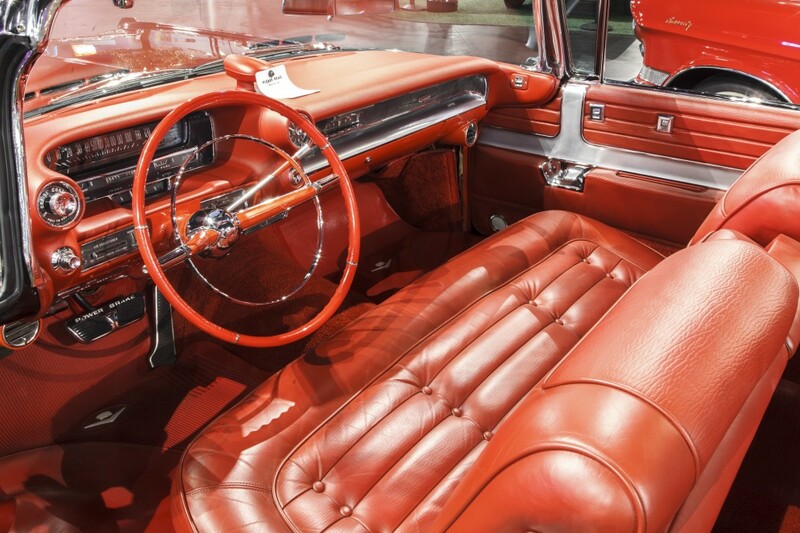 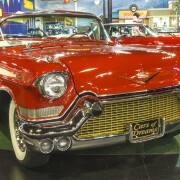 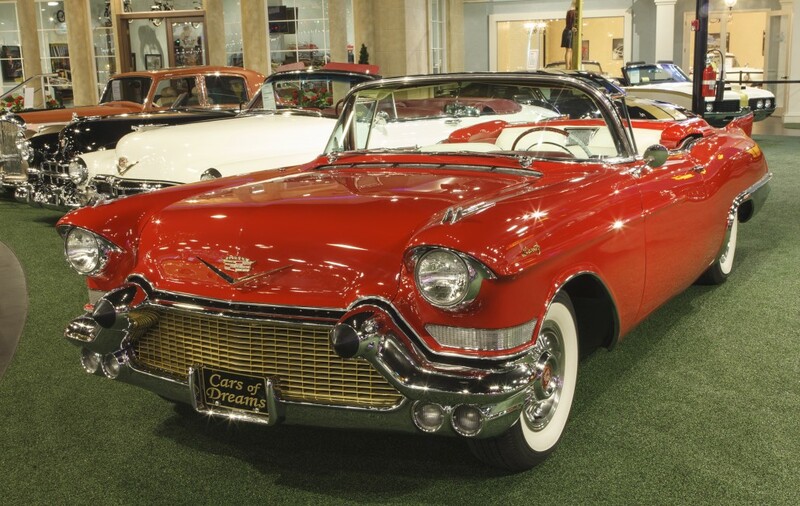 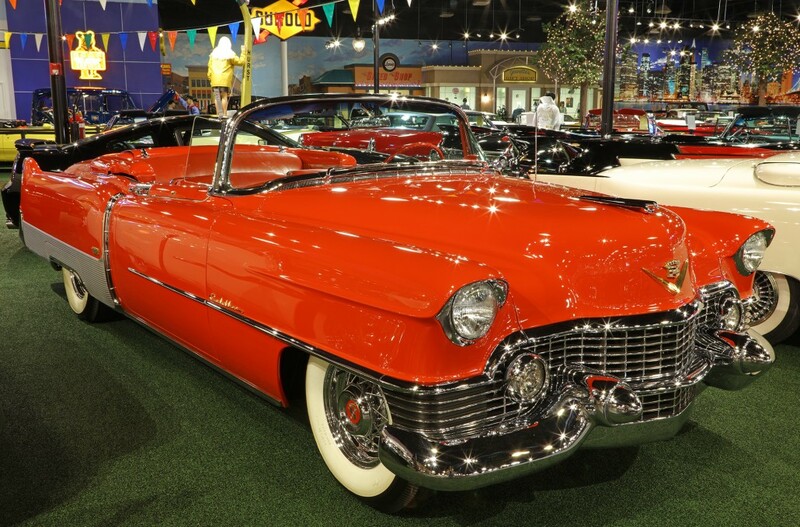 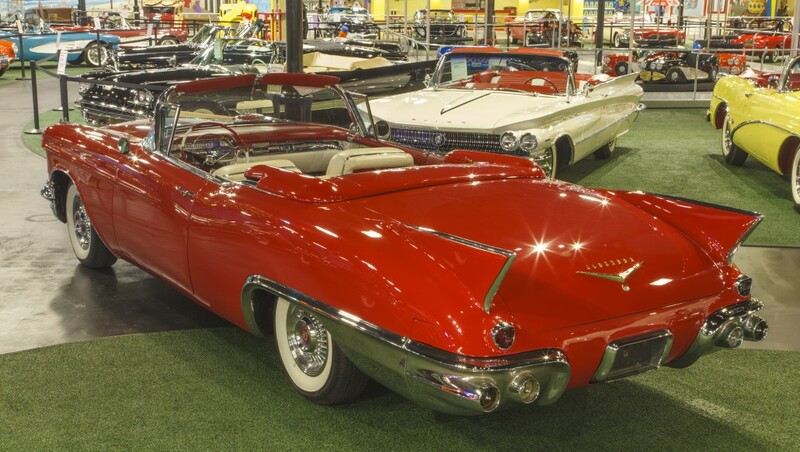 This red Caddy purchased by Elvis on September 15, 1967 has become widely known as “The Honeymoon Cadillac” as he and Priscilla were often seen driving it around Memphis and to his Circle G ranch shortly after they were married. 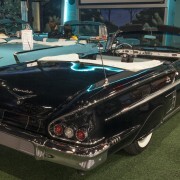 Documentation includes copies of the original Bill of Sale and title as well as the original Protect-O-Plate showing the name Elvis Presley and listing the address of Graceland. 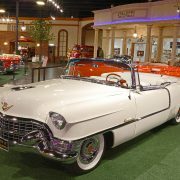 Also included are newspaper clippings and a copy of the book “Hurry Home Elvis” in which the Cadillac is mentioned on page 118. 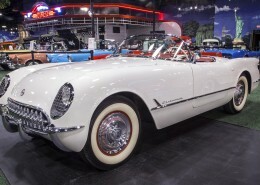 Total Frame-off restoration, all numbers matching, each body panel was restored and painted. 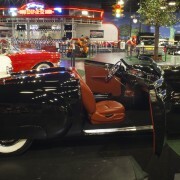 Original danbury mint model. 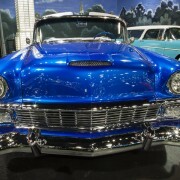 Export blue with black fenders, new correct interior. 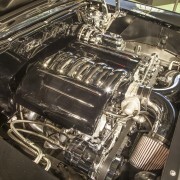 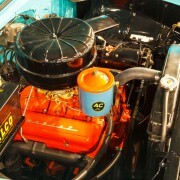 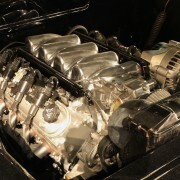 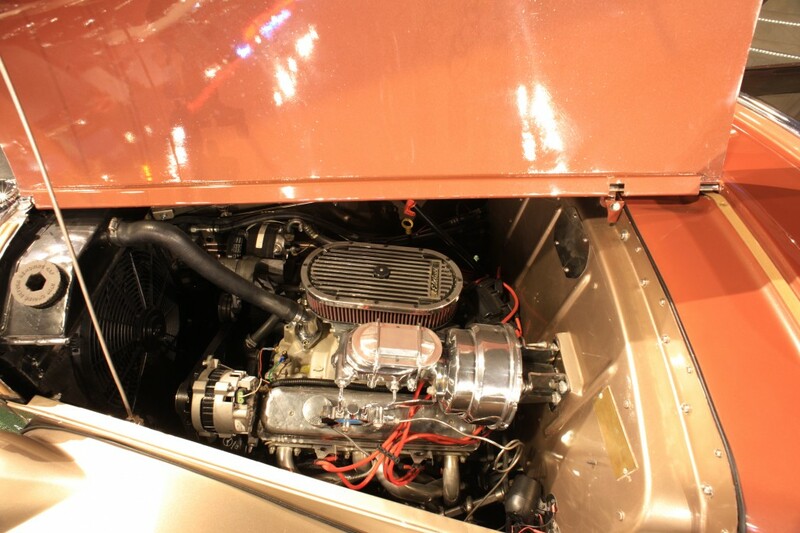 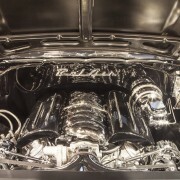 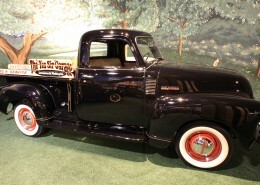 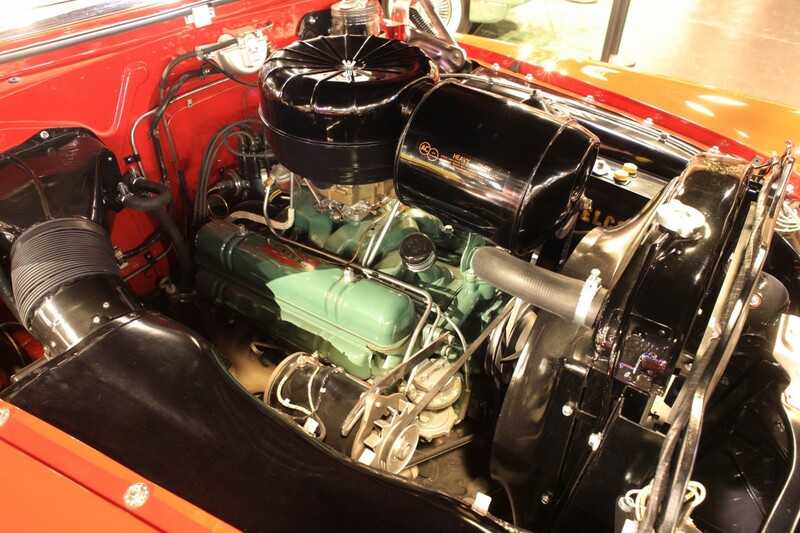 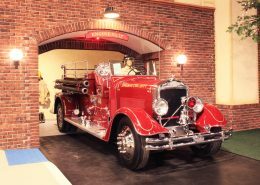 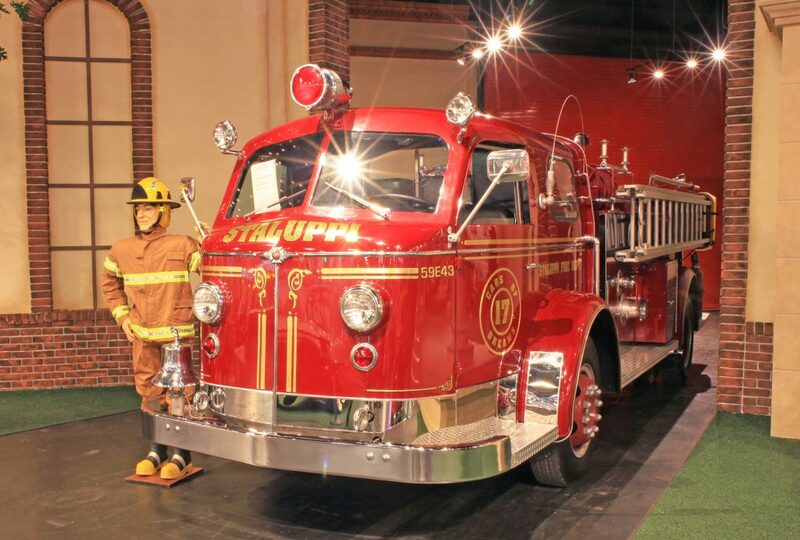 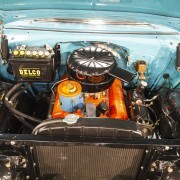 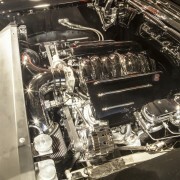 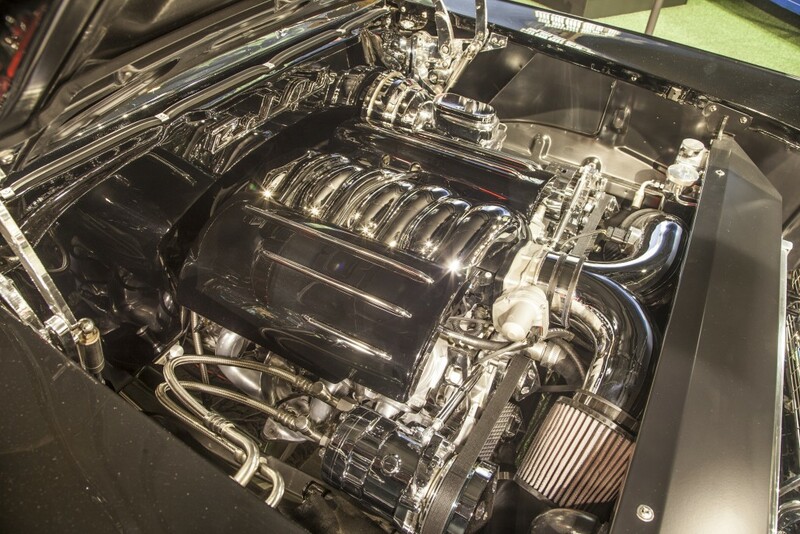 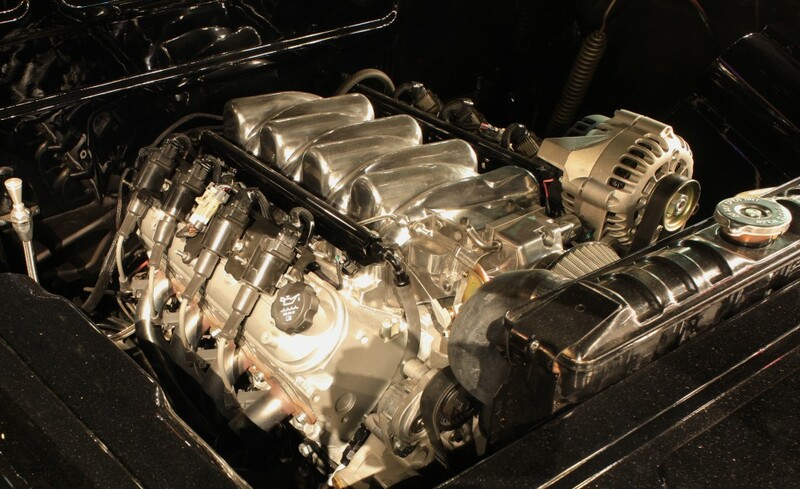 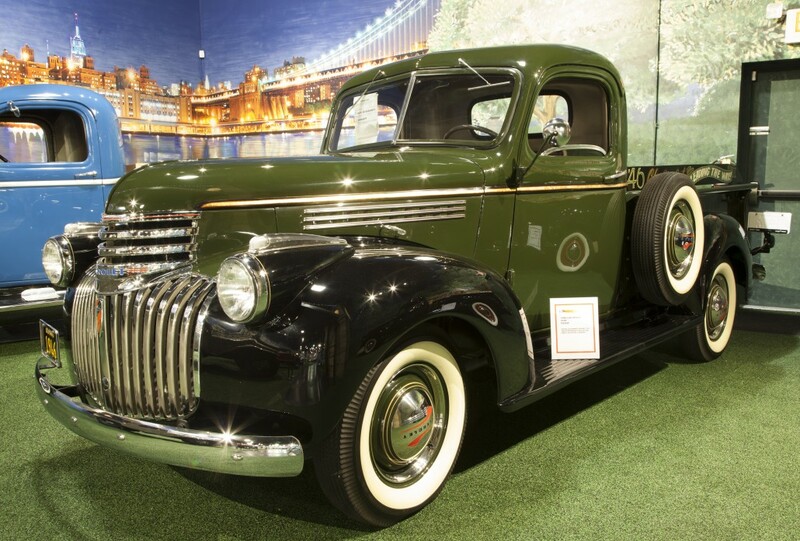 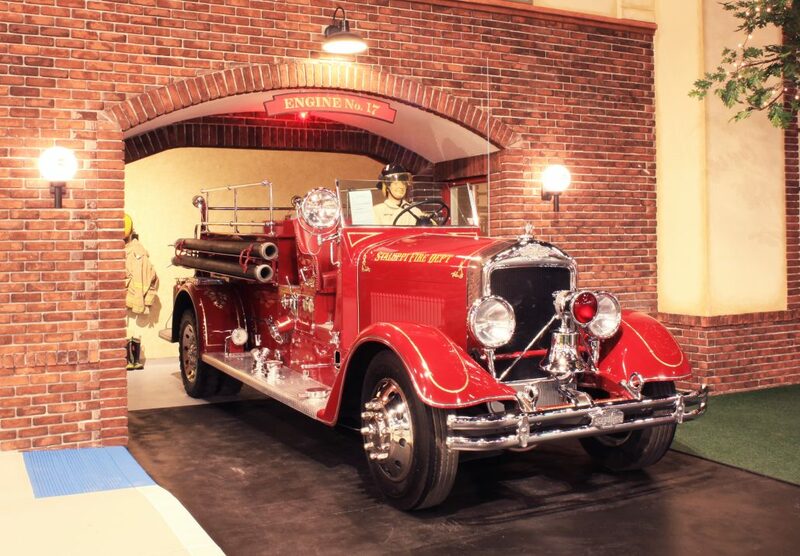 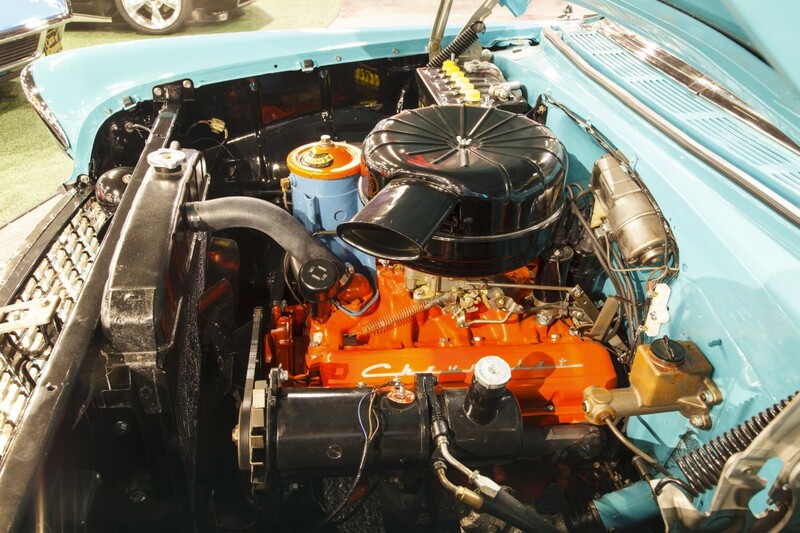 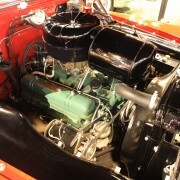 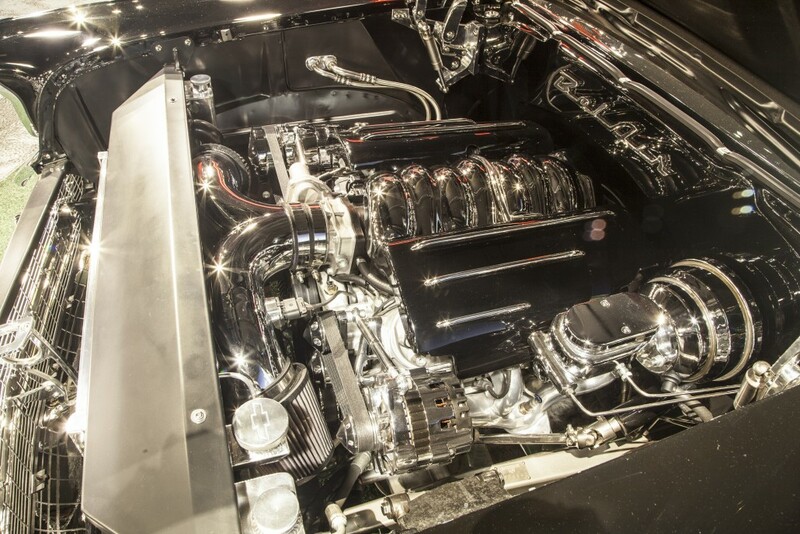 235CID six cylinder engine, this truck represents one of the finest 46’s in the country. 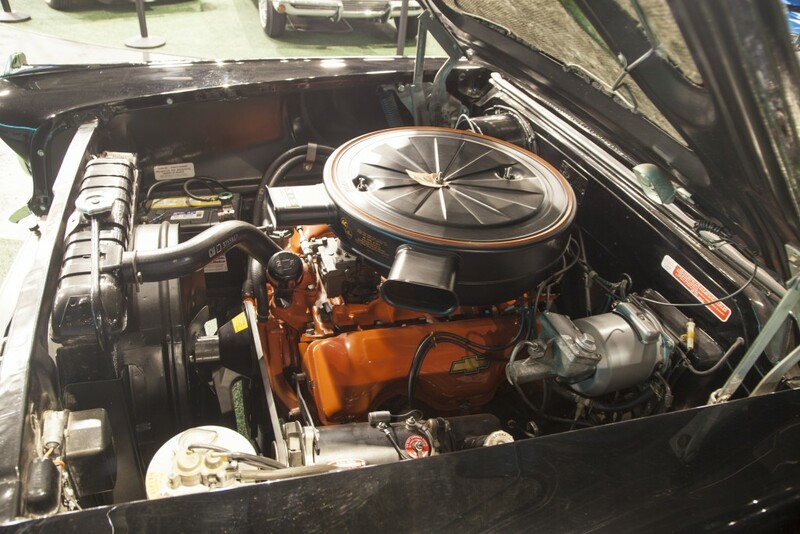 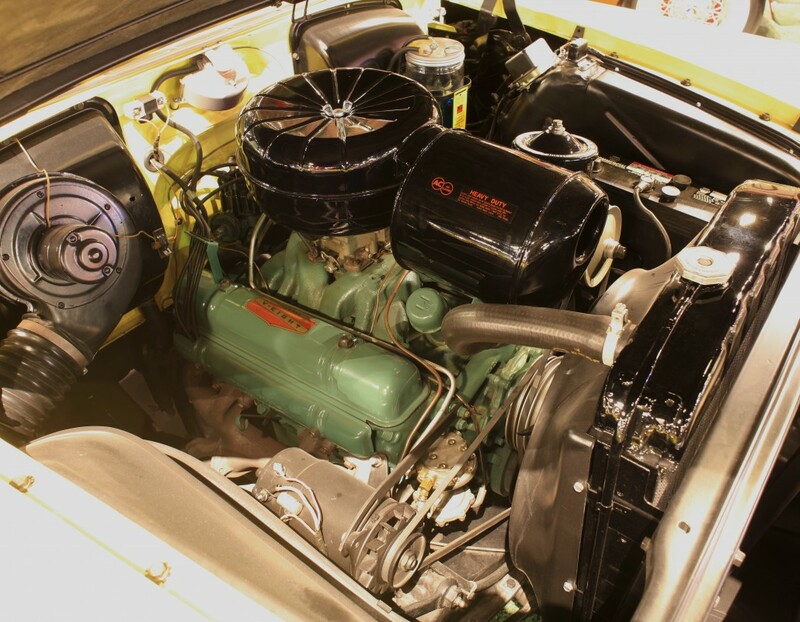 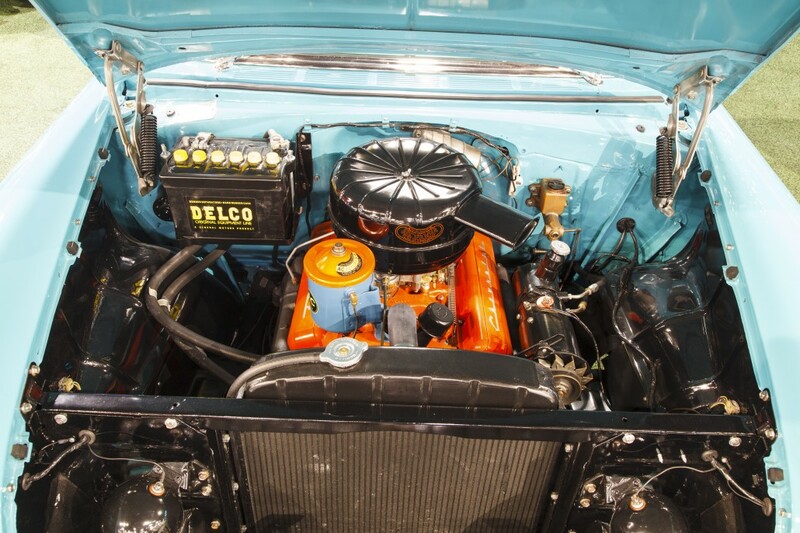 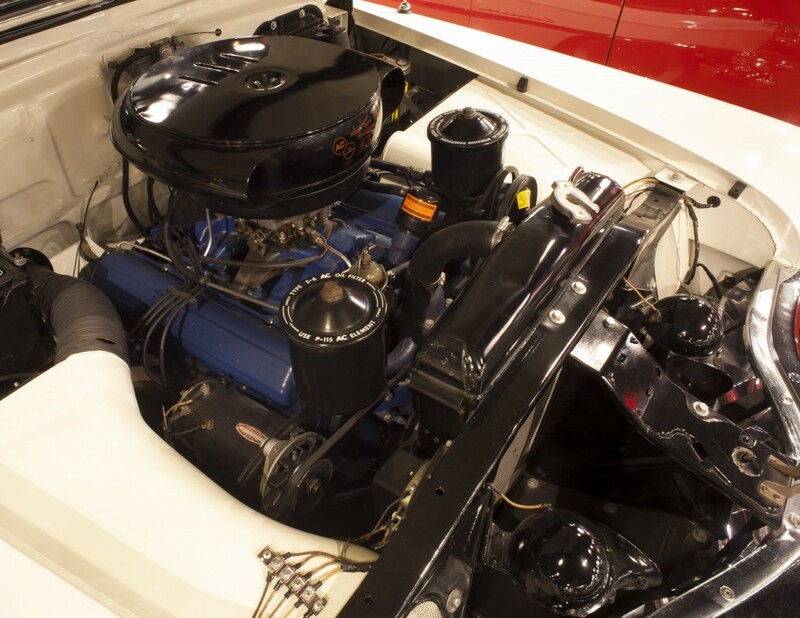 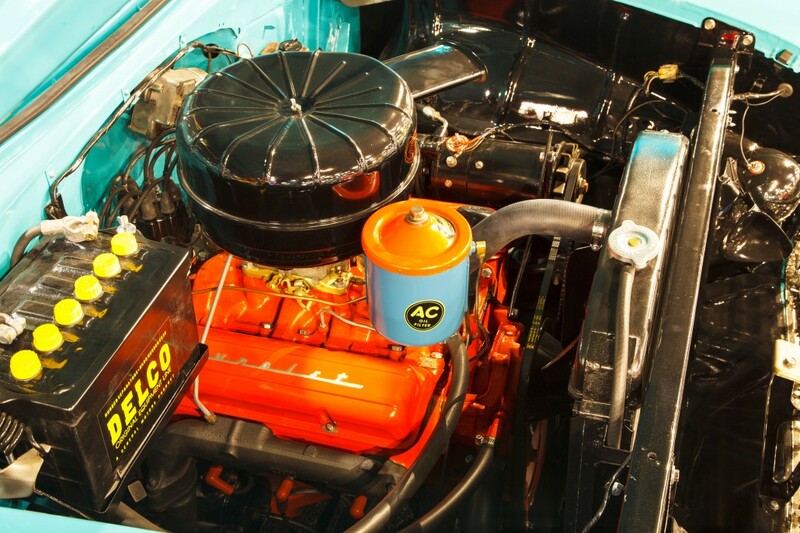 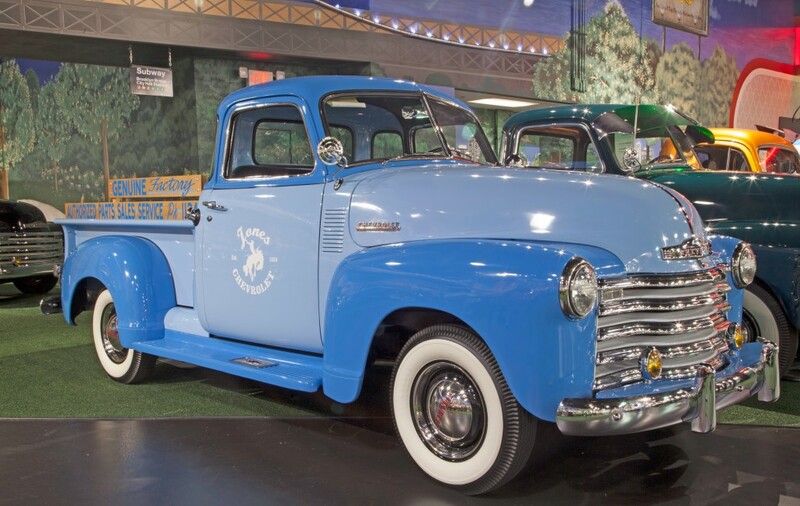 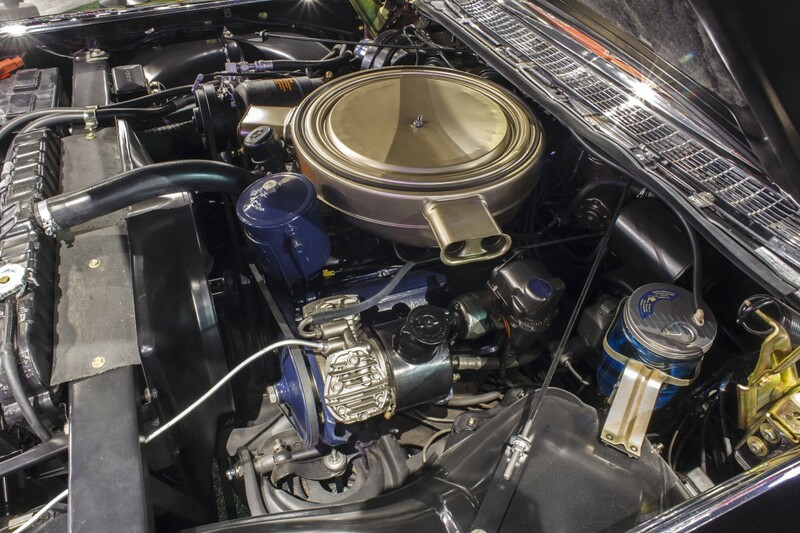 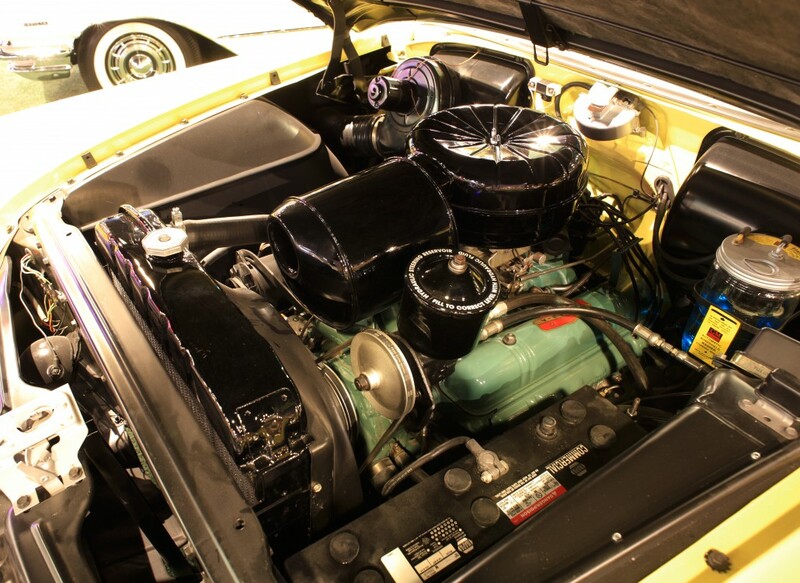 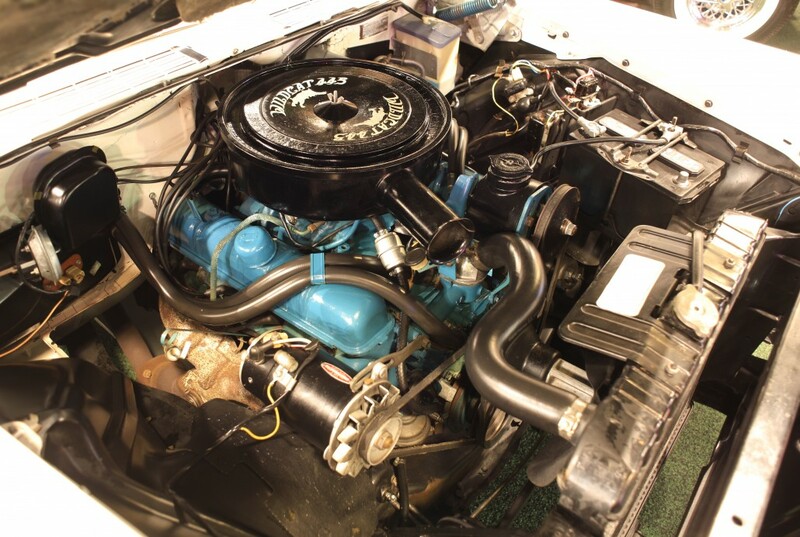 This 5-window 3100 pickup has undergone an extensive total frame-off restoration. 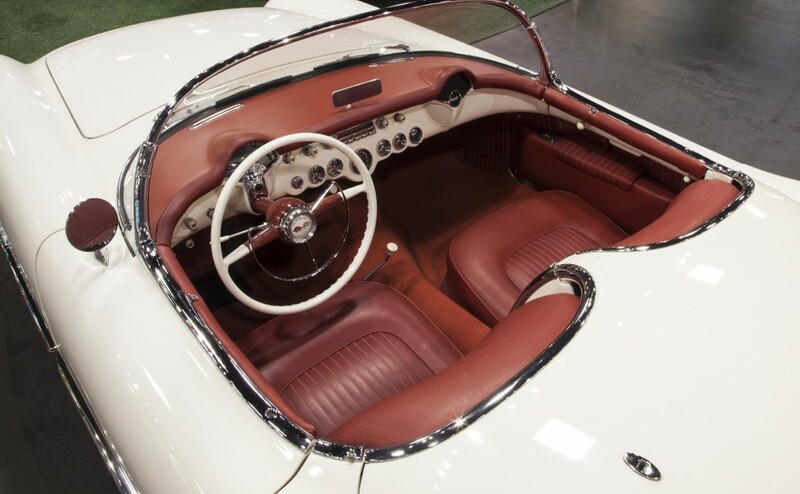 The undercarriage is as nice as the rest. 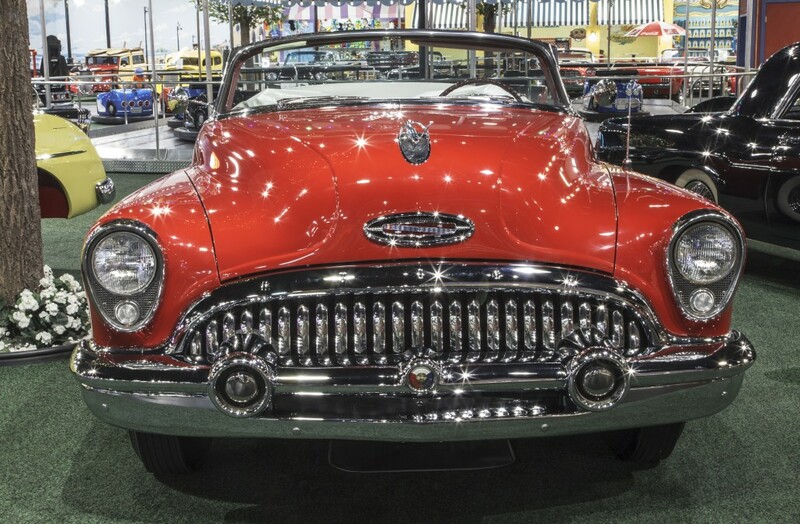 The outstanding laser0straight features beautiful red base coat/clear coat paint that’s been wet-sanded and buffed to an amazing shine. 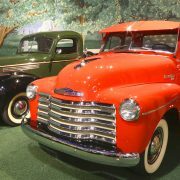 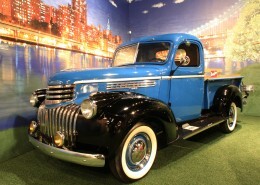 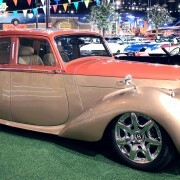 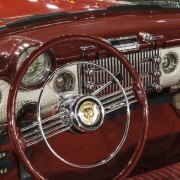 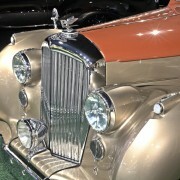 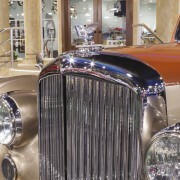 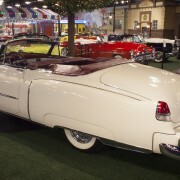 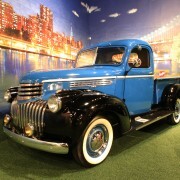 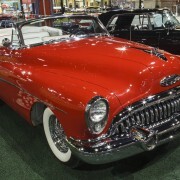 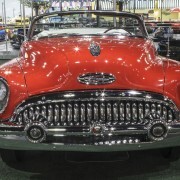 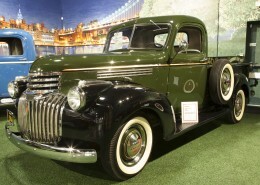 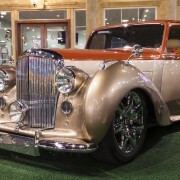 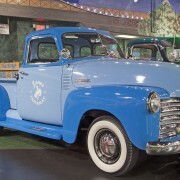 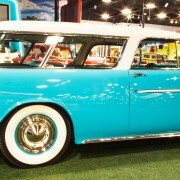 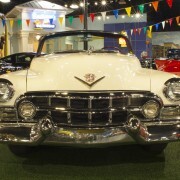 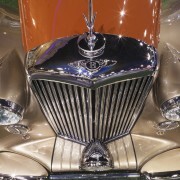 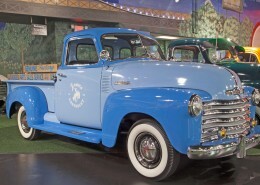 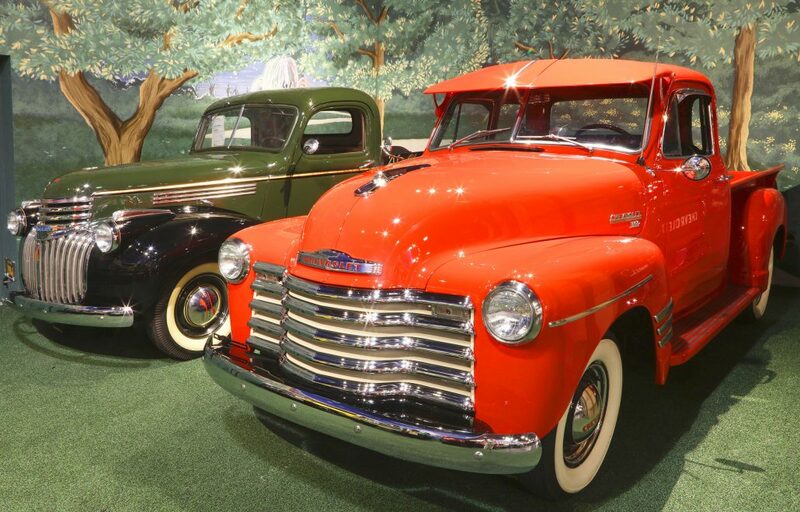 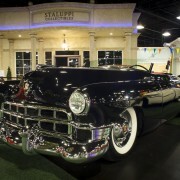 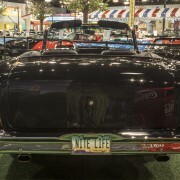 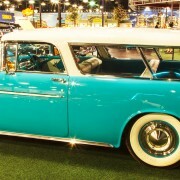 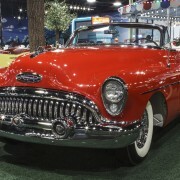 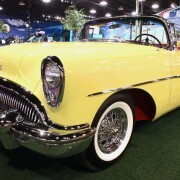 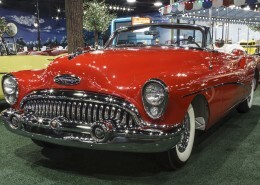 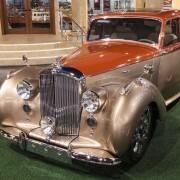 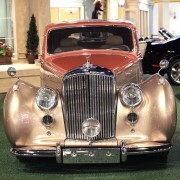 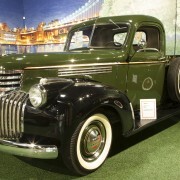 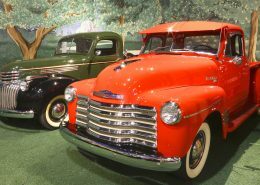 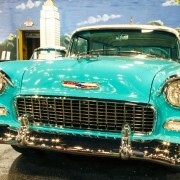 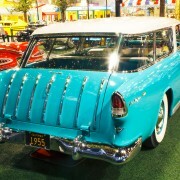 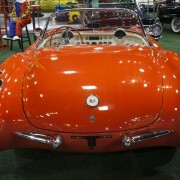 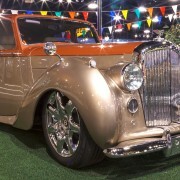 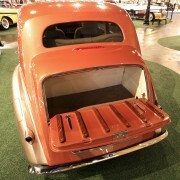 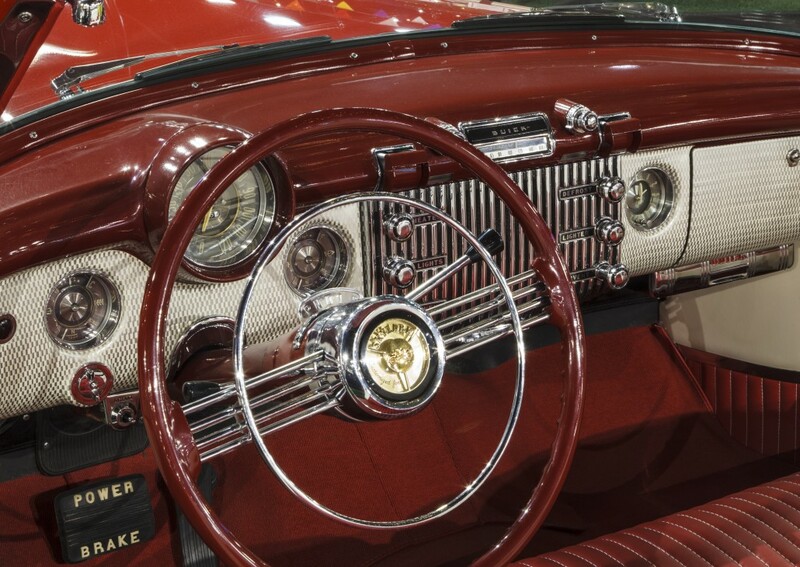 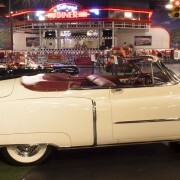 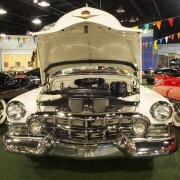 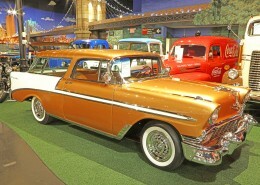 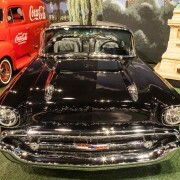 a real classic-looking 1949, int has a Fulton sun visor and chrome grille, and the trim is set off with chrome bumpers. 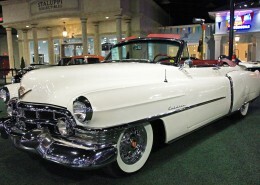 Riding on wide whitewall tires, it also wears a set of fog lamps. 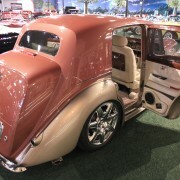 It features a stunning walnut bed. 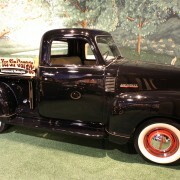 This truck runs, rides and drives amazingly. 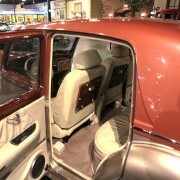 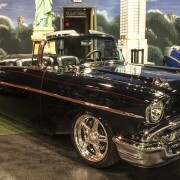 Very unique and restored 5 window deluxe cab, 235CID, inline 6- cylinder. 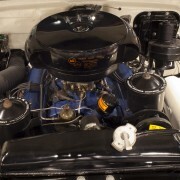 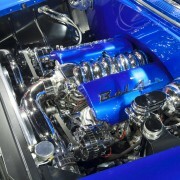 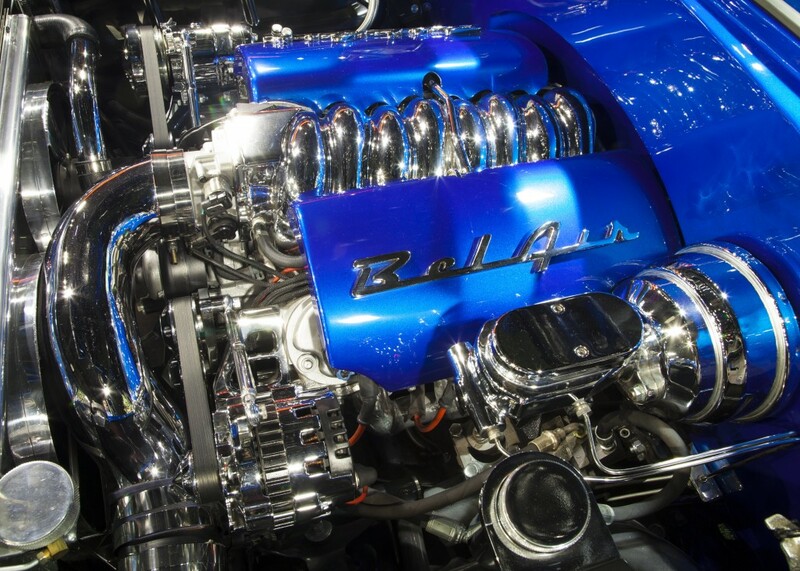 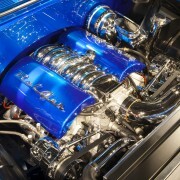 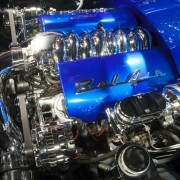 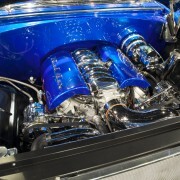 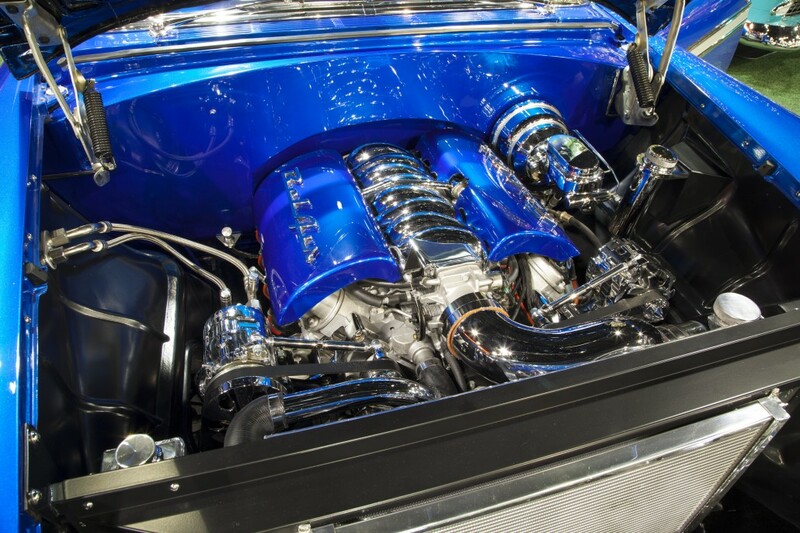 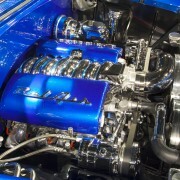 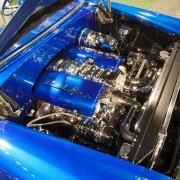 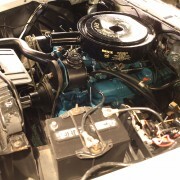 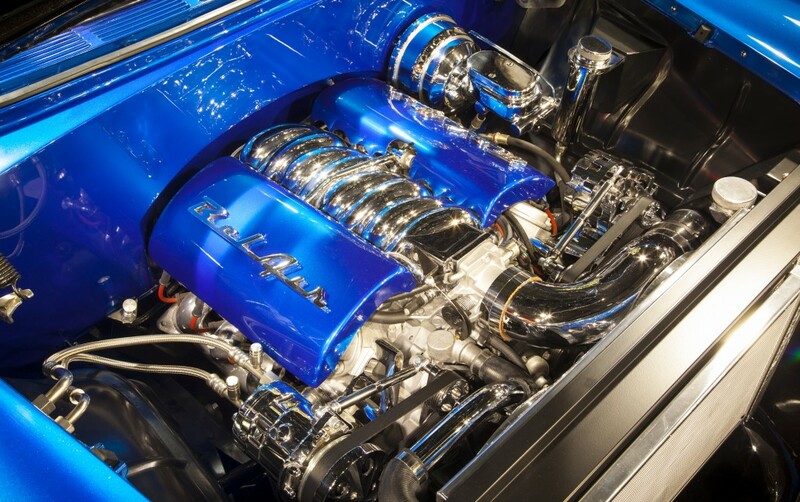 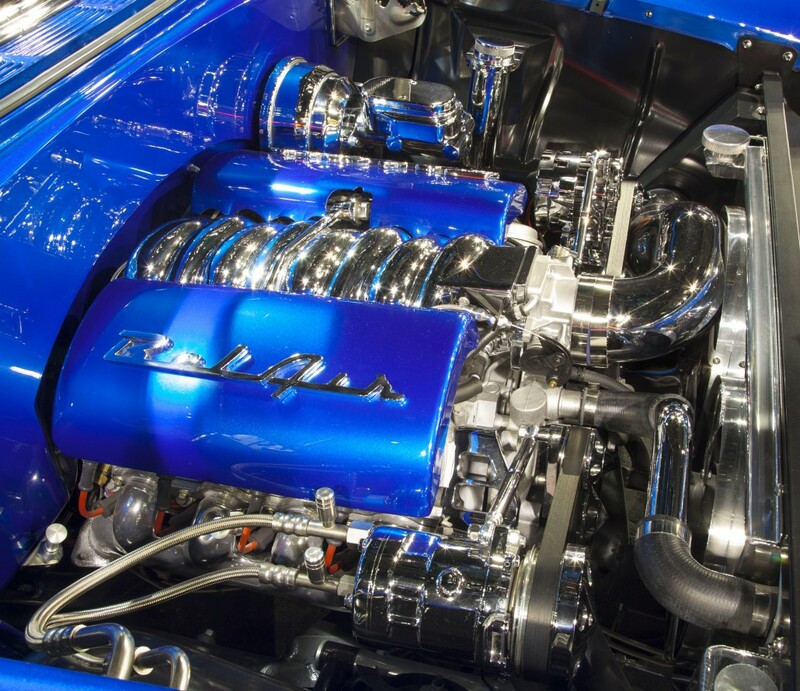 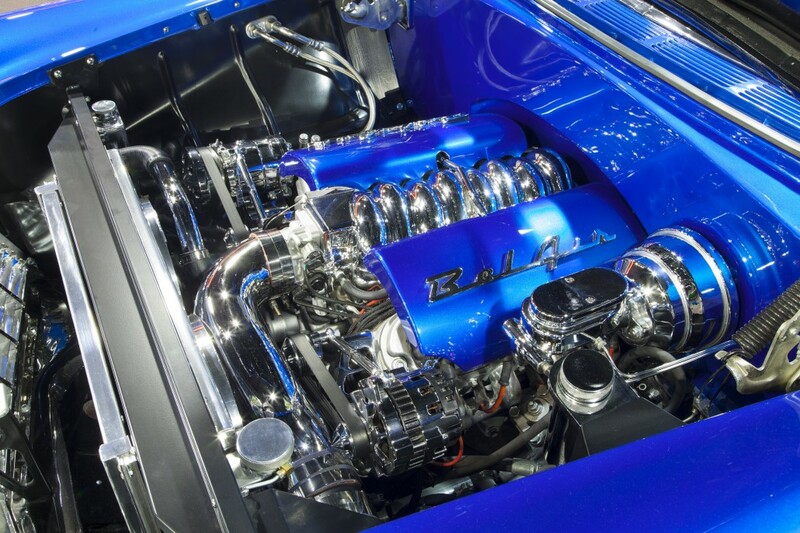 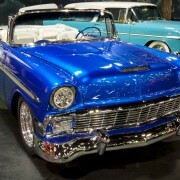 235CID inline 6 cylinder 150HP blue flame engine, 2 speed powerglide automatic transmission. 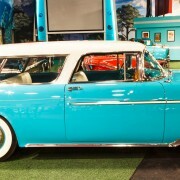 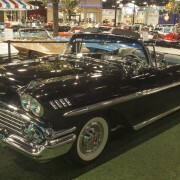 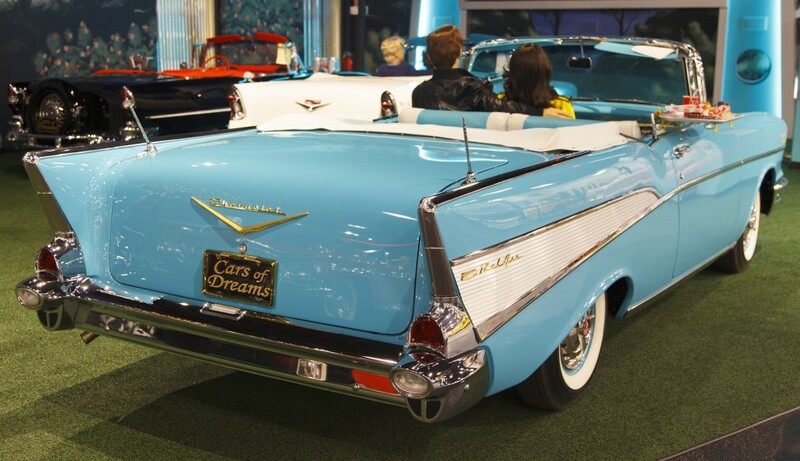 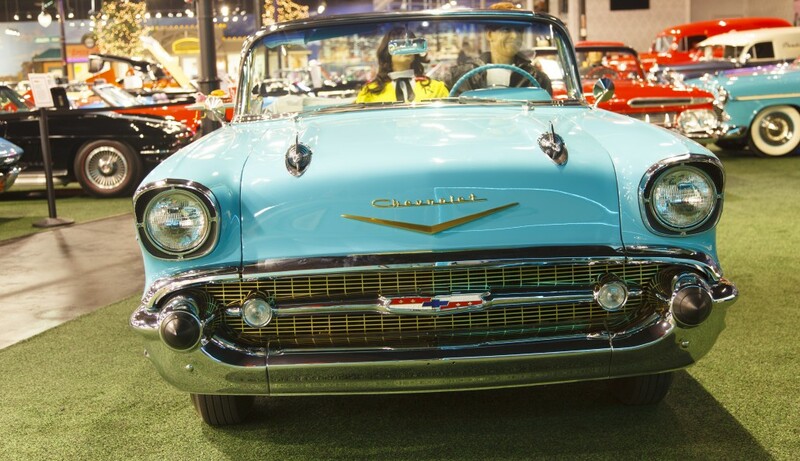 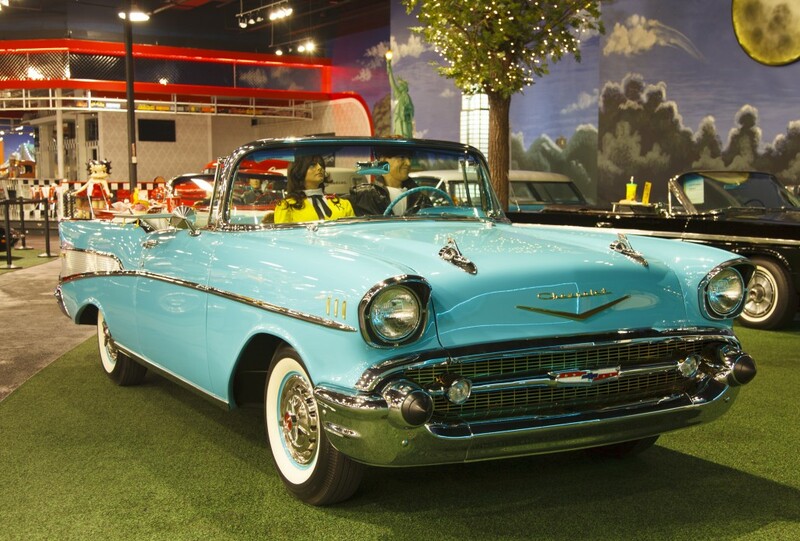 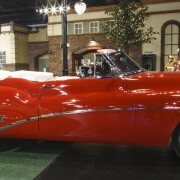 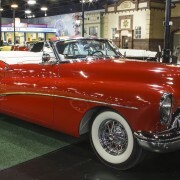 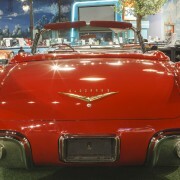 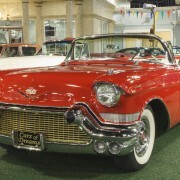 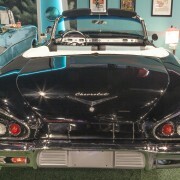 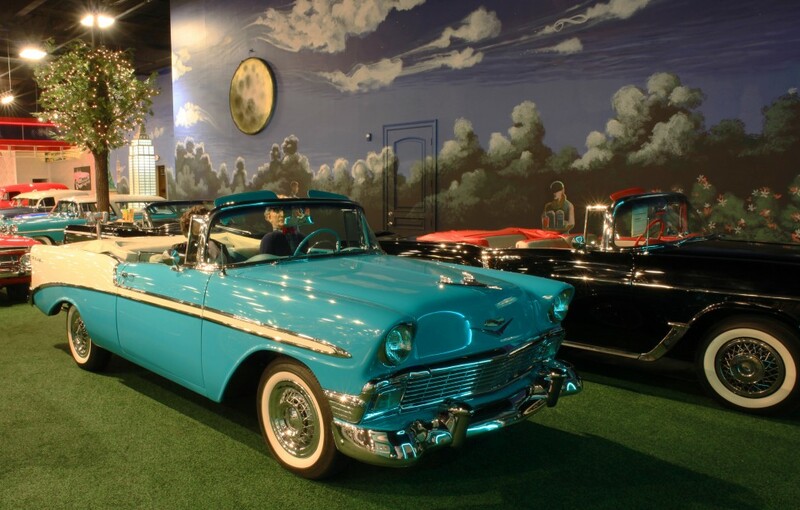 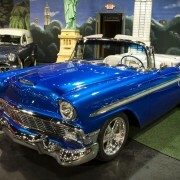 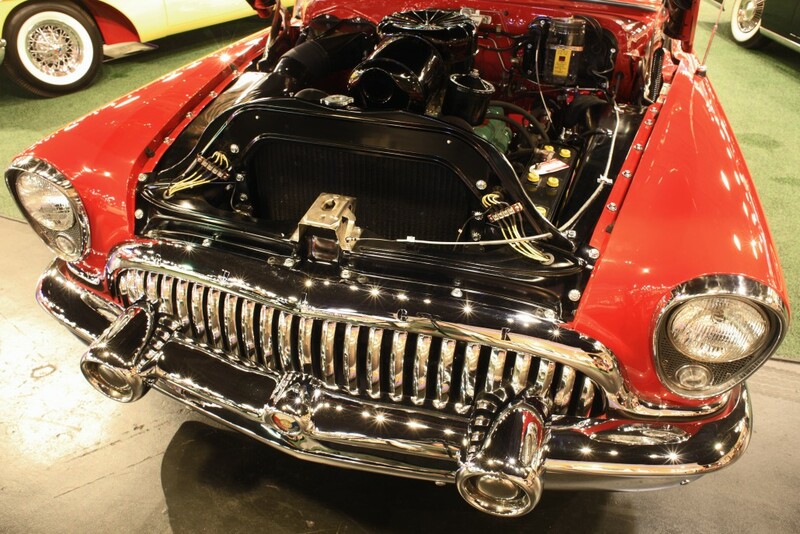 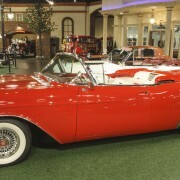 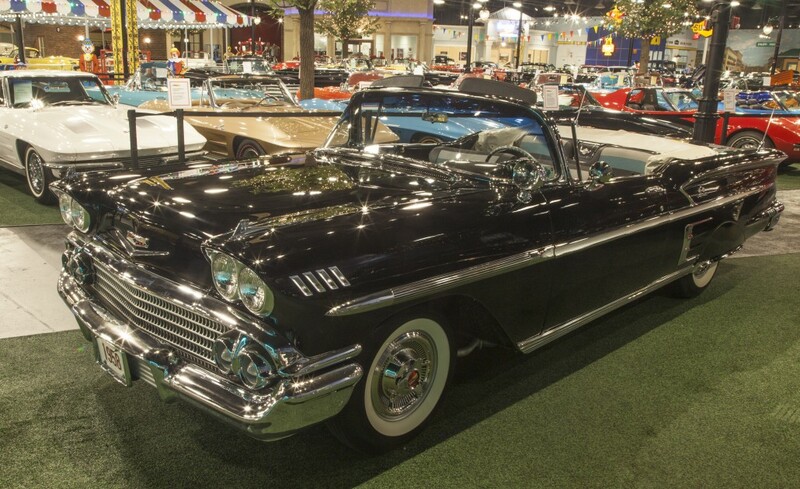 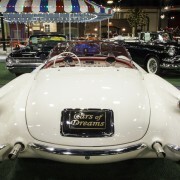 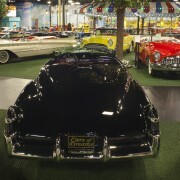 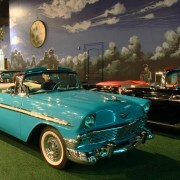 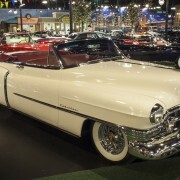 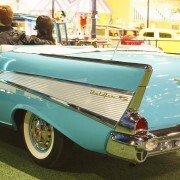 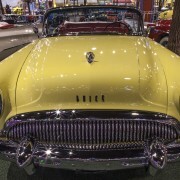 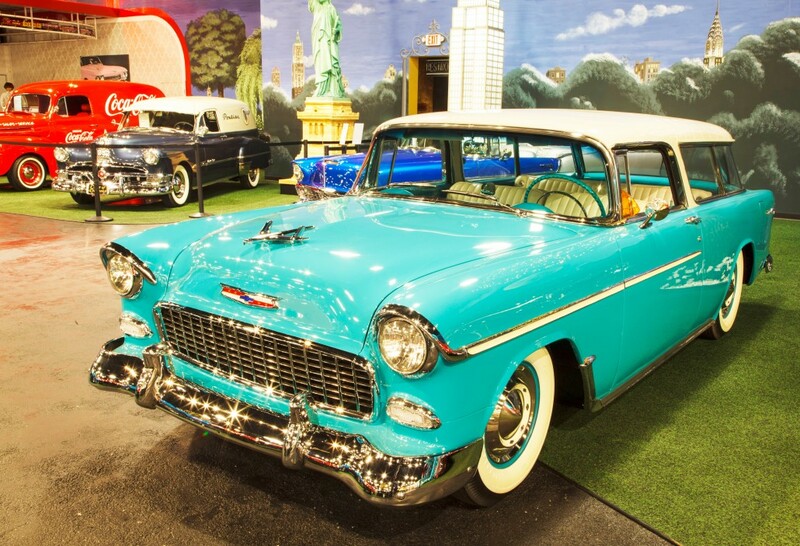 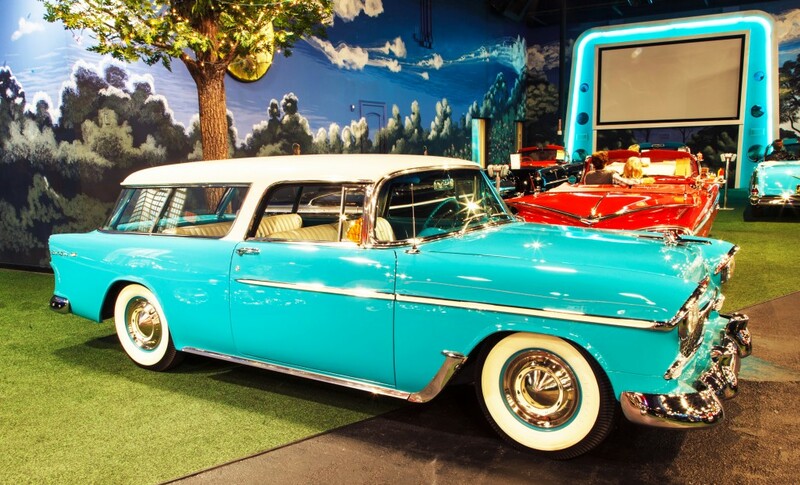 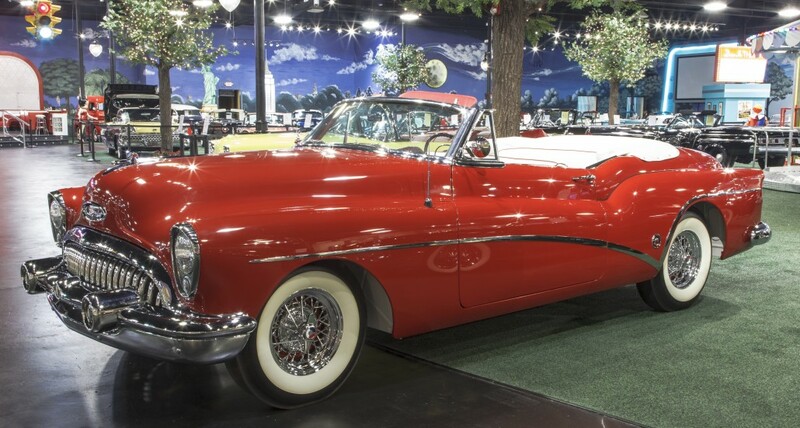 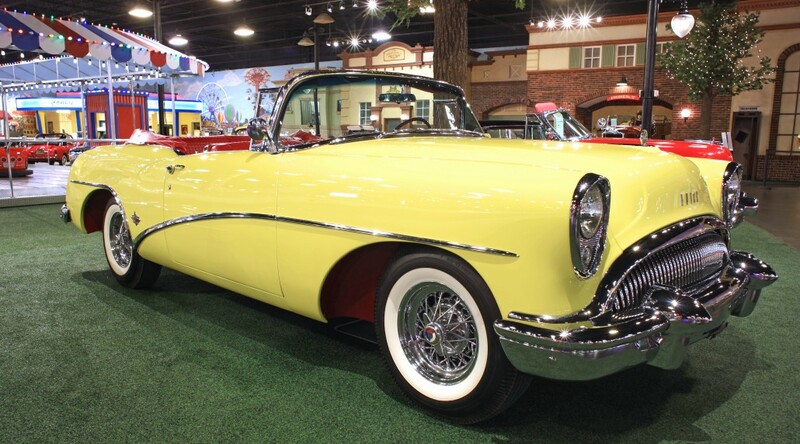 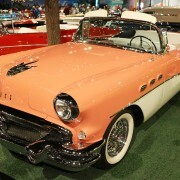 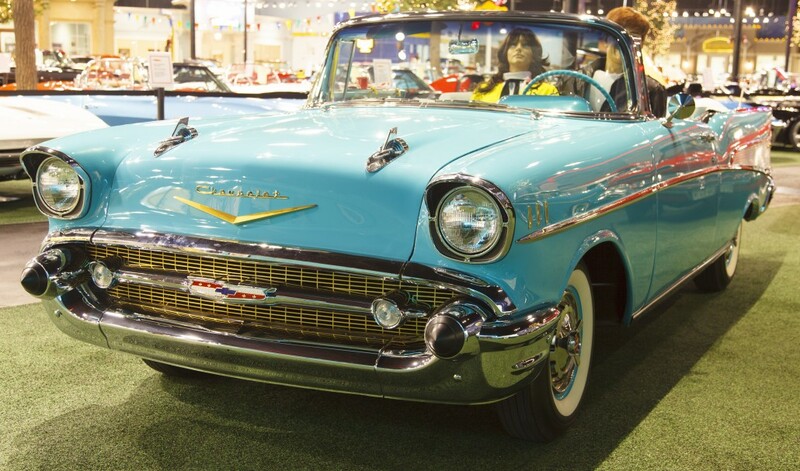 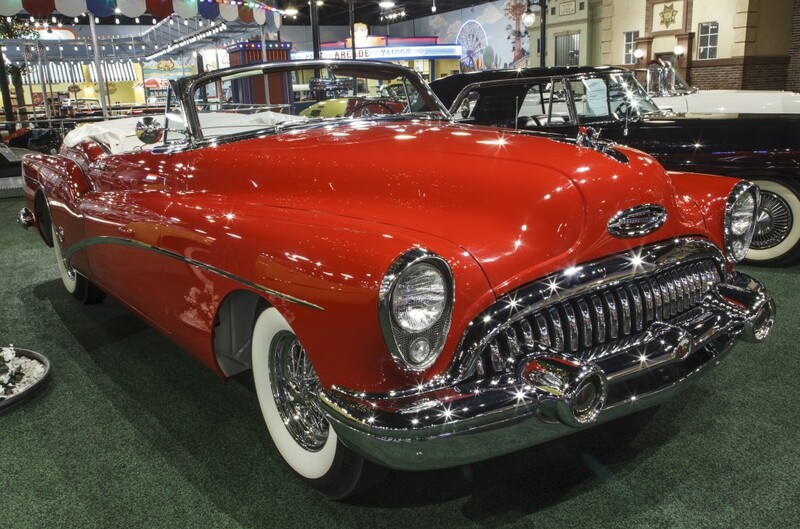 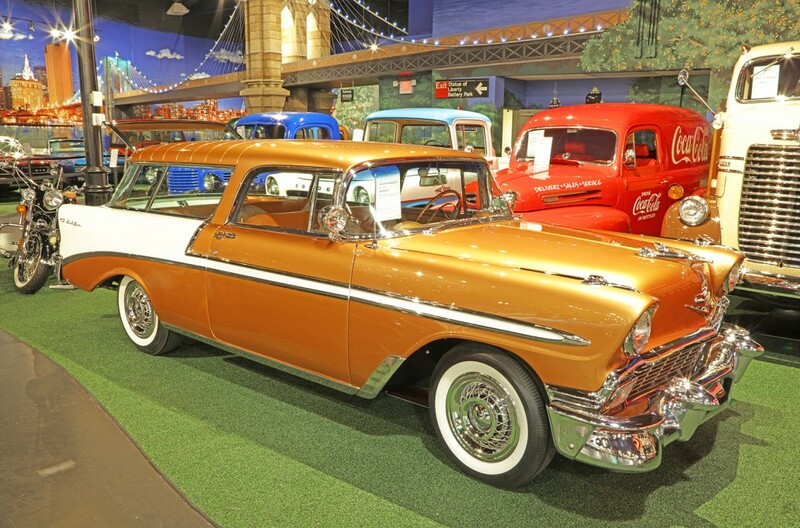 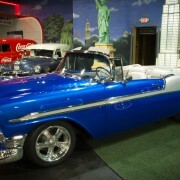 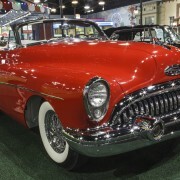 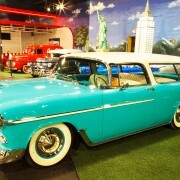 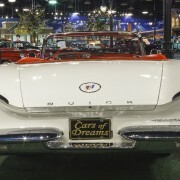 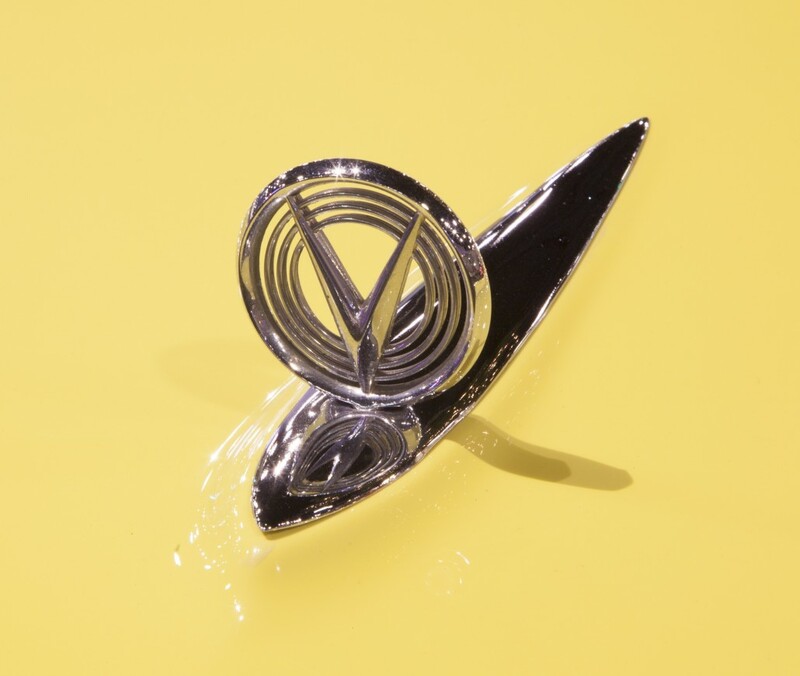 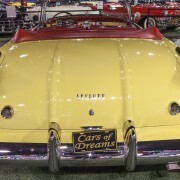 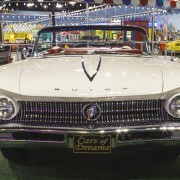 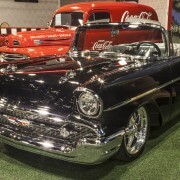 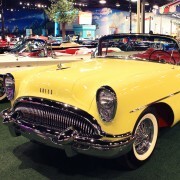 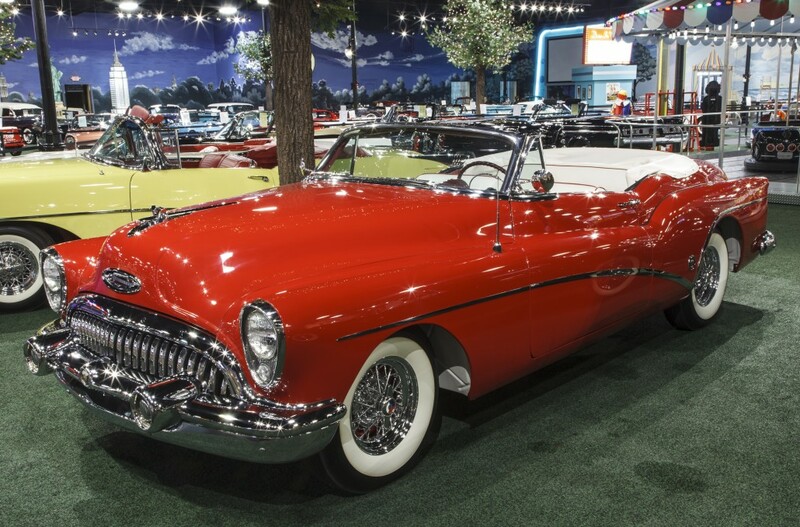 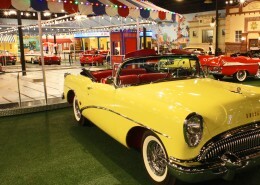 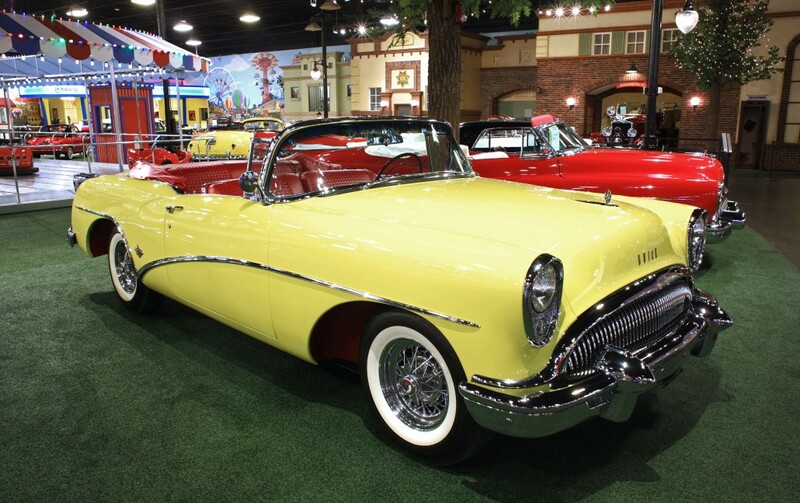 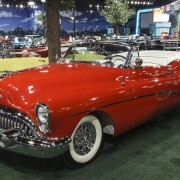 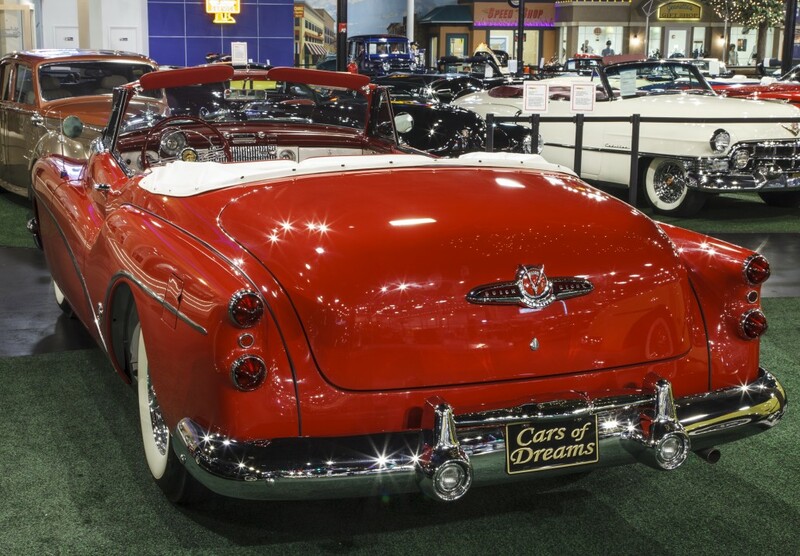 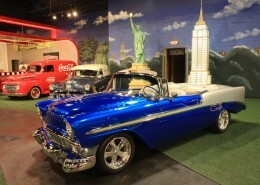 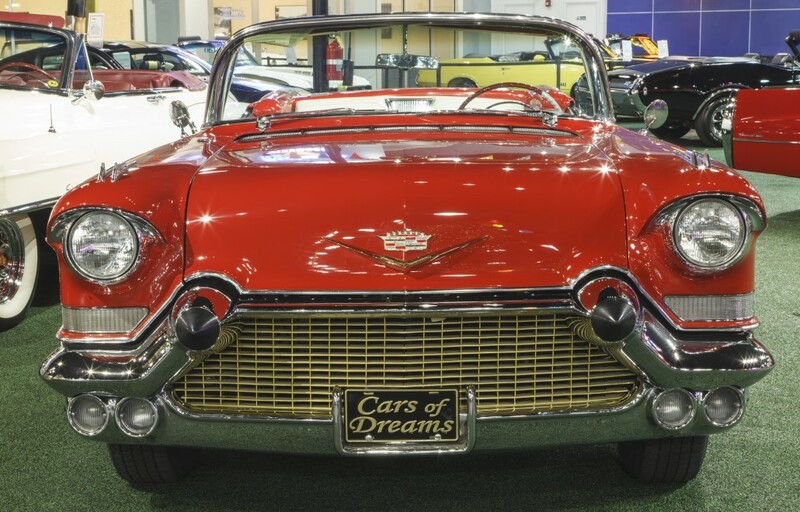 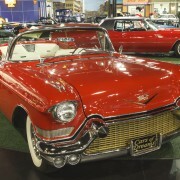 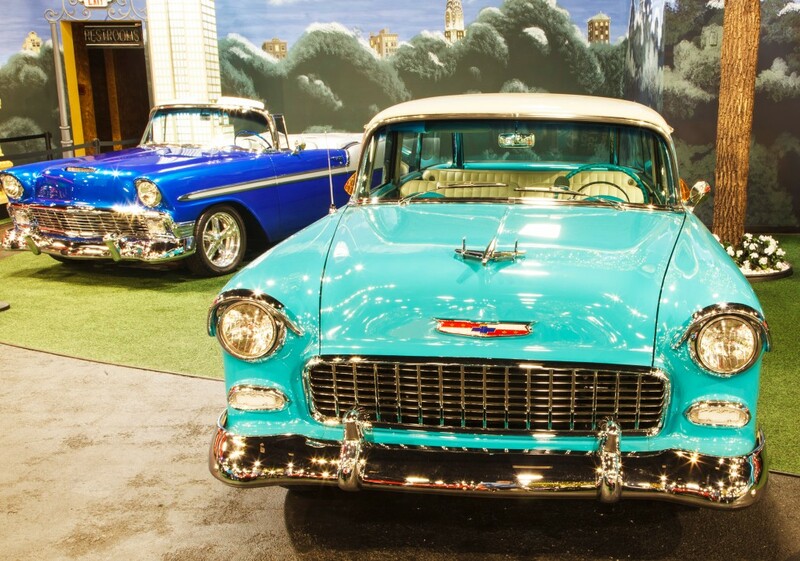 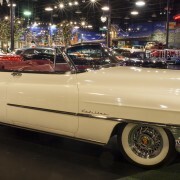 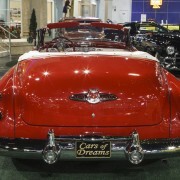 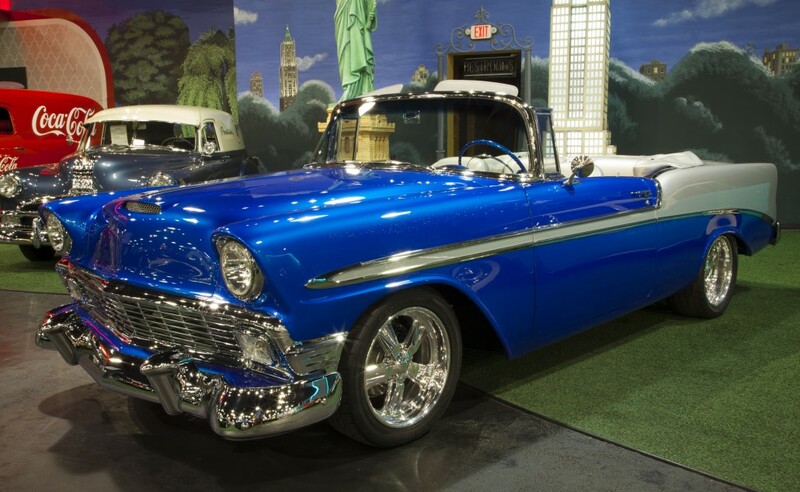 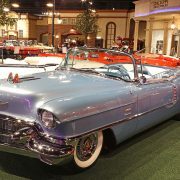 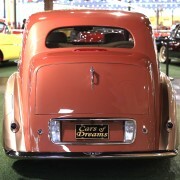 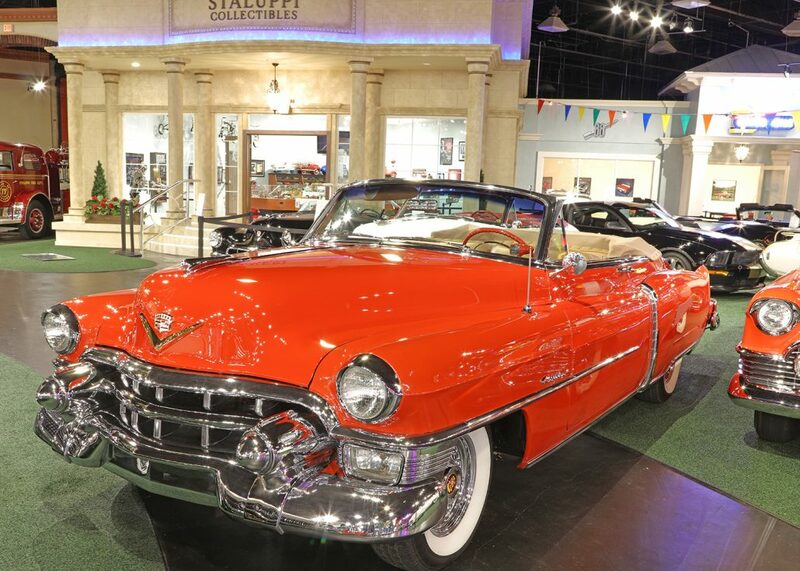 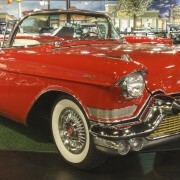 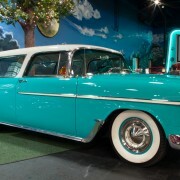 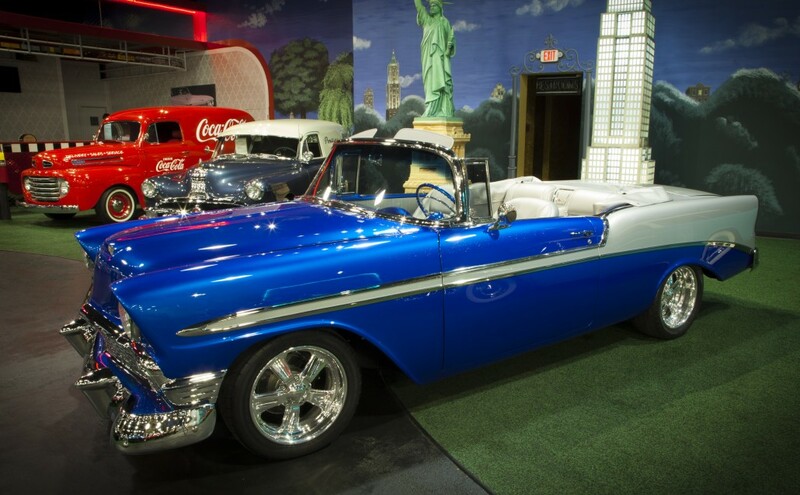 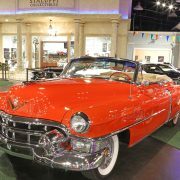 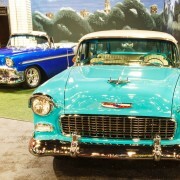 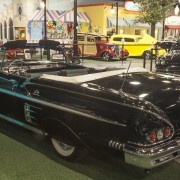 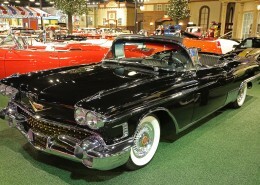 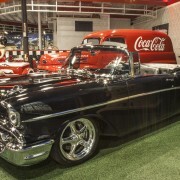 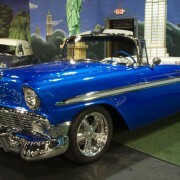 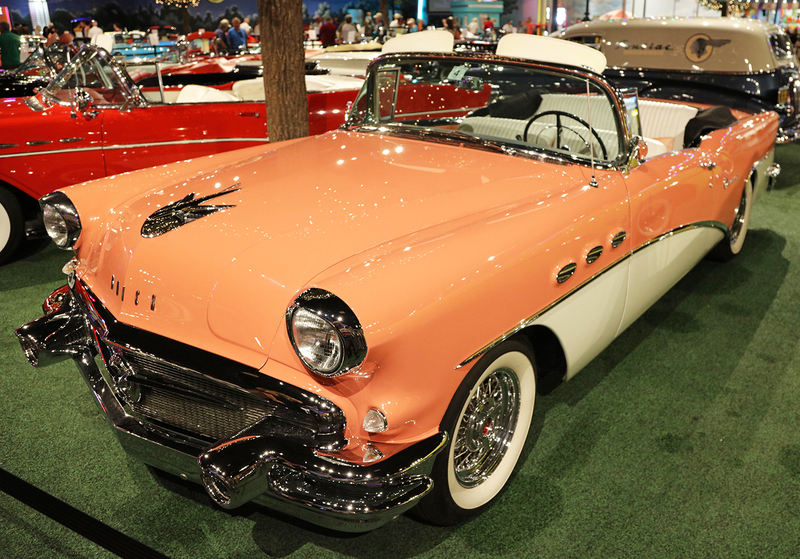 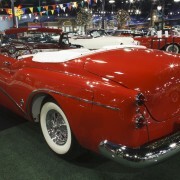 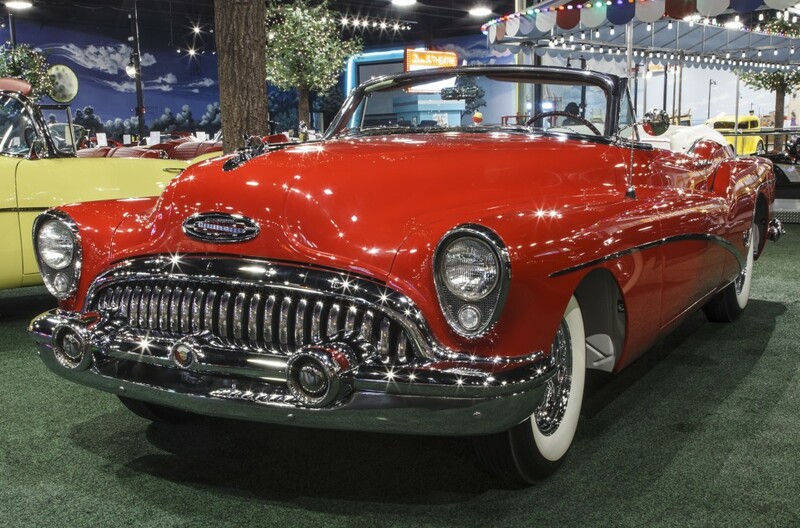 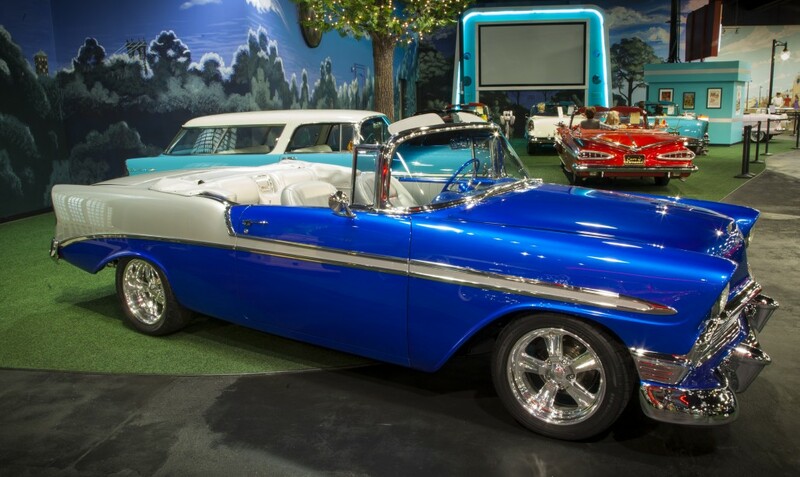 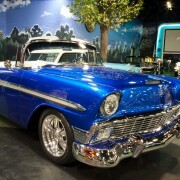 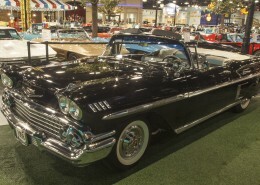 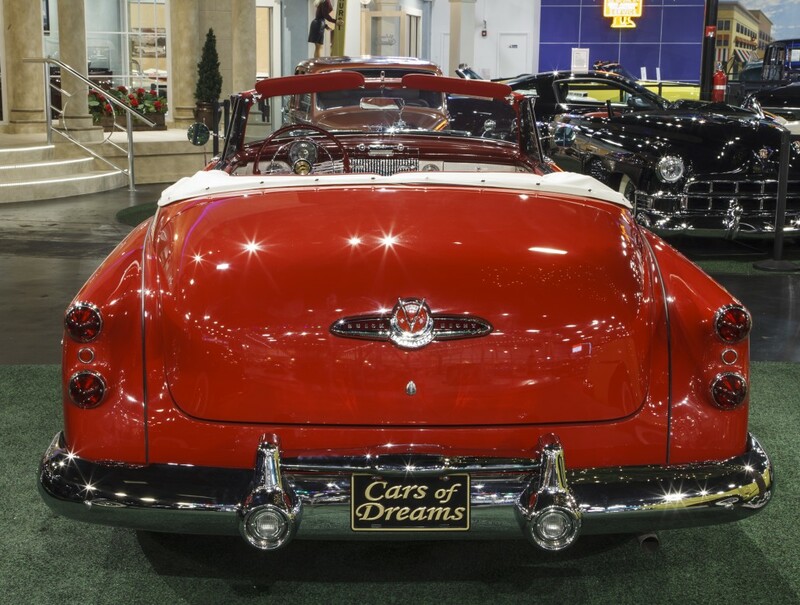 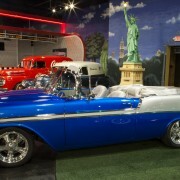 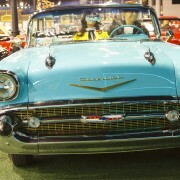 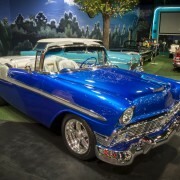 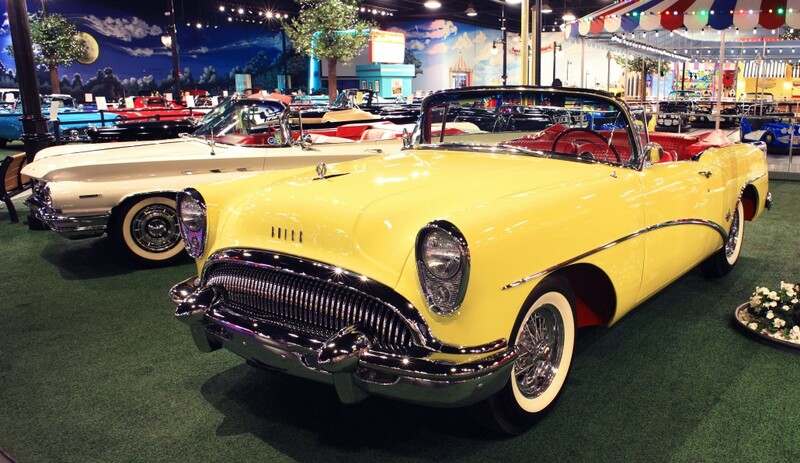 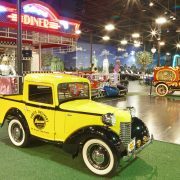 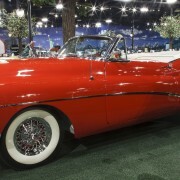 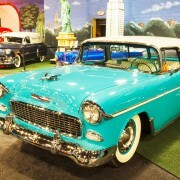 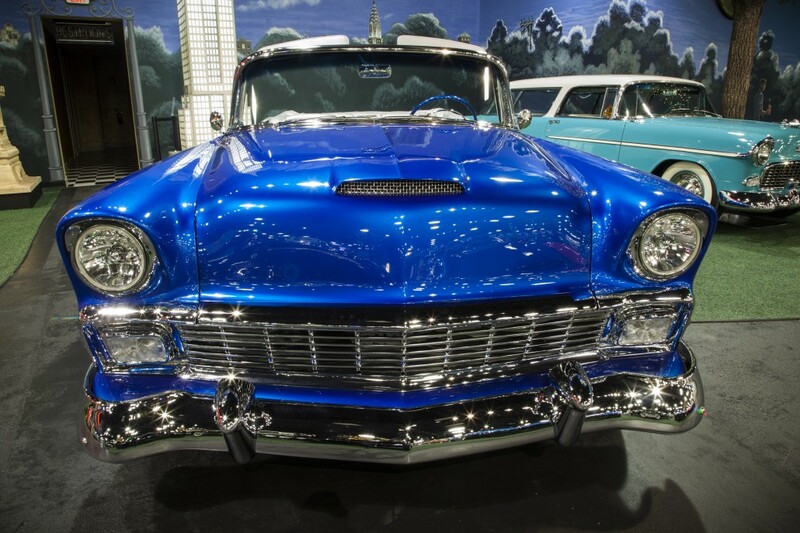 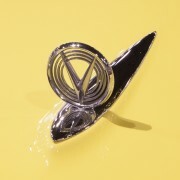 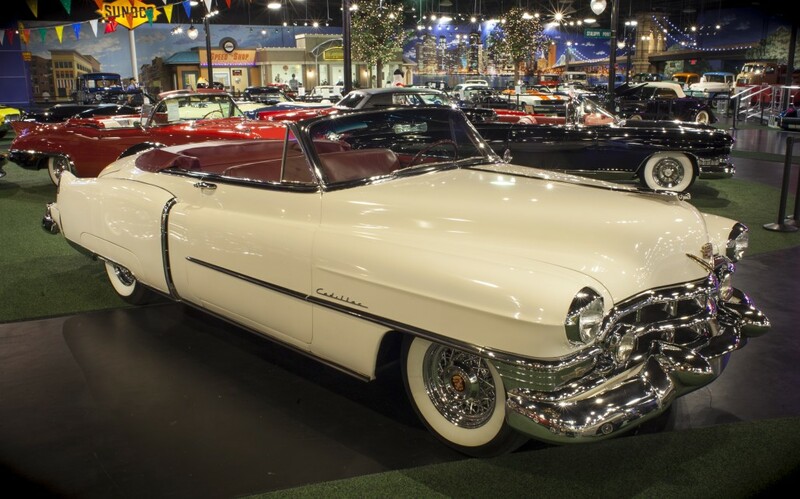 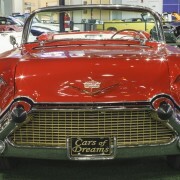 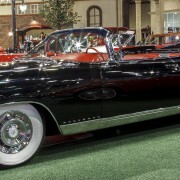 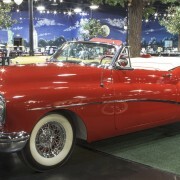 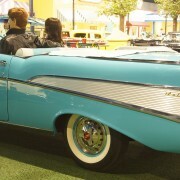 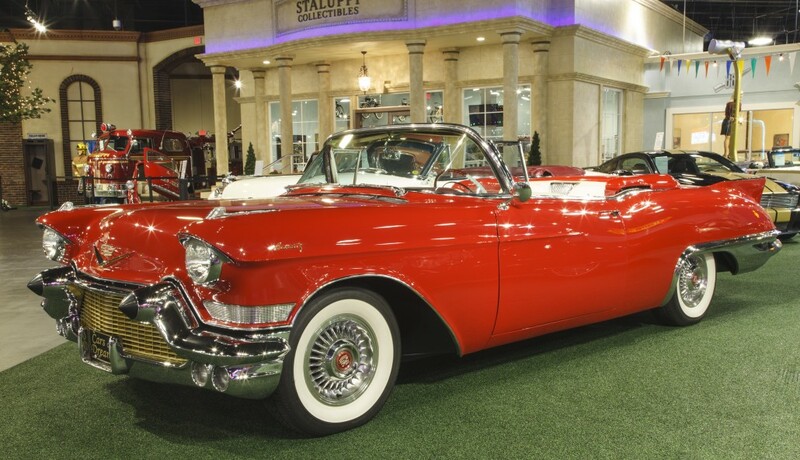 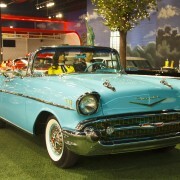 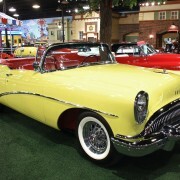 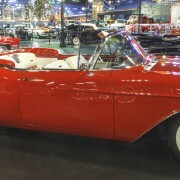 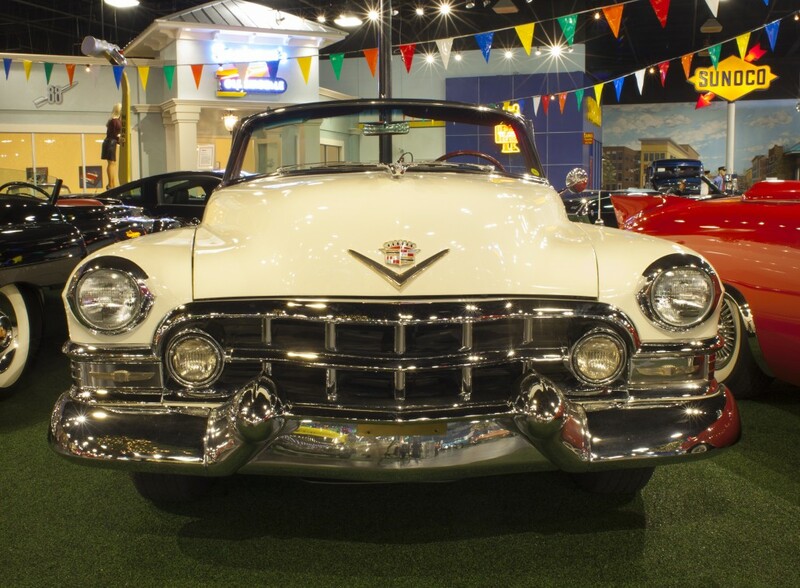 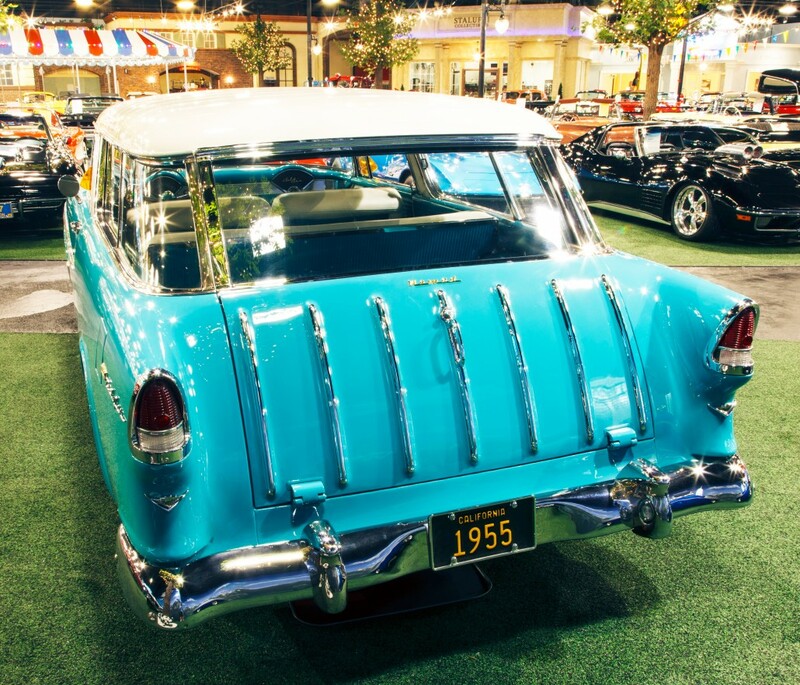 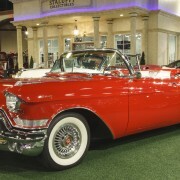 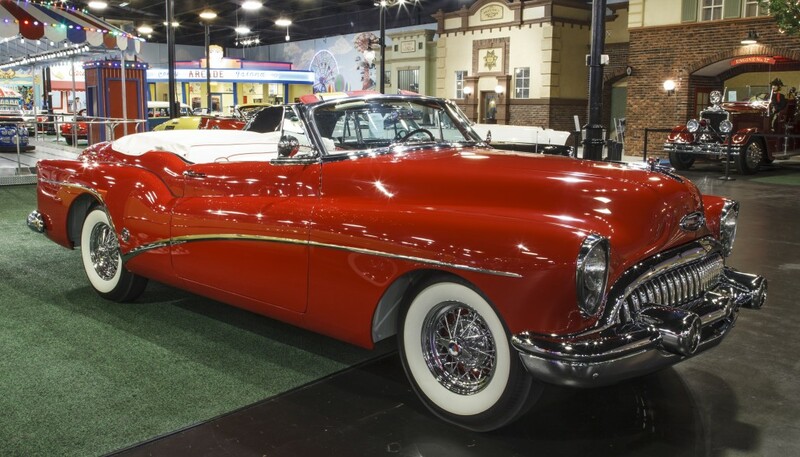 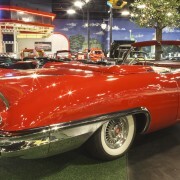 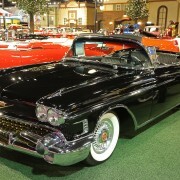 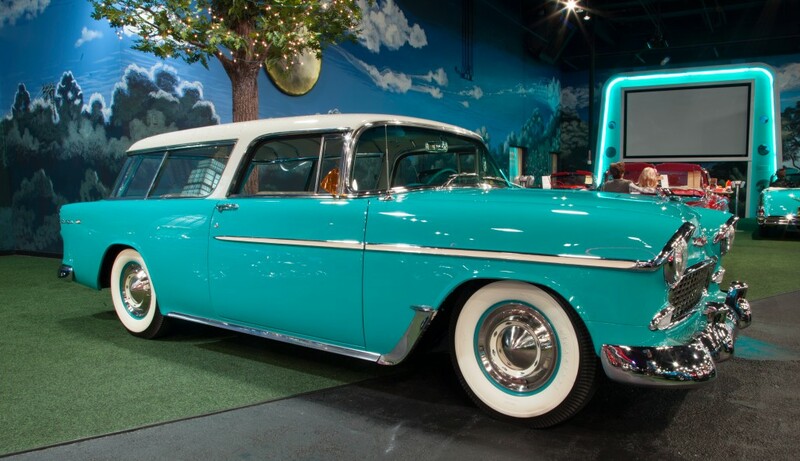 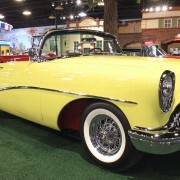 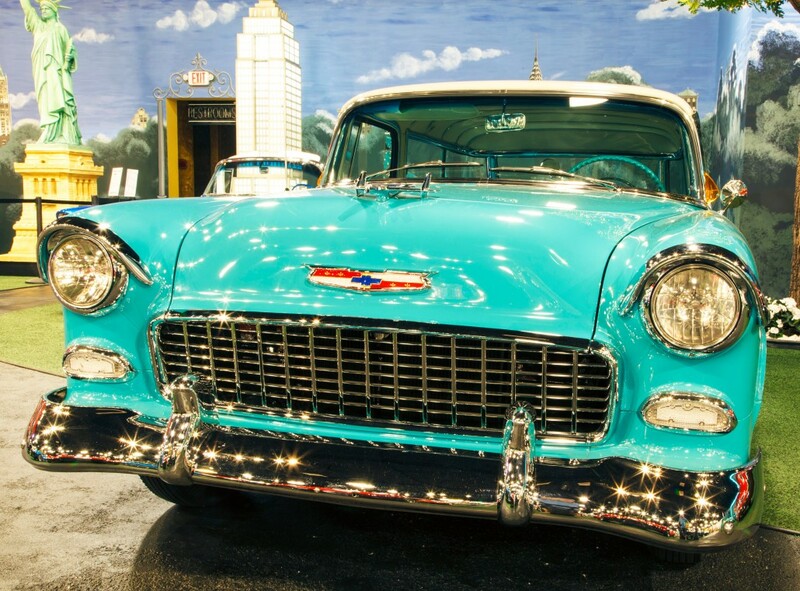 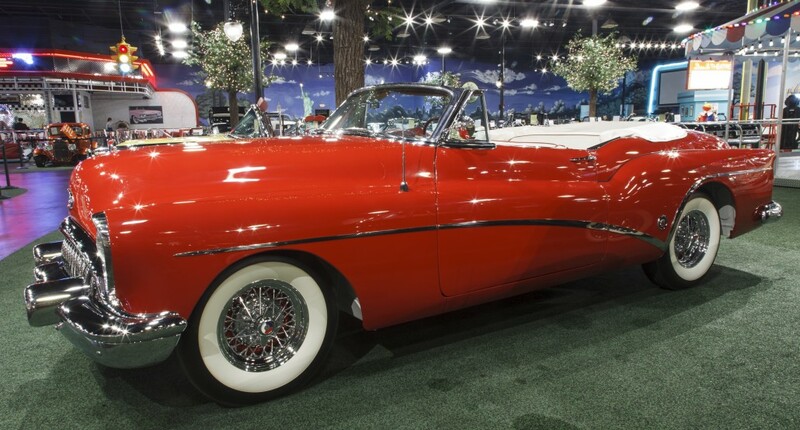 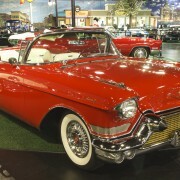 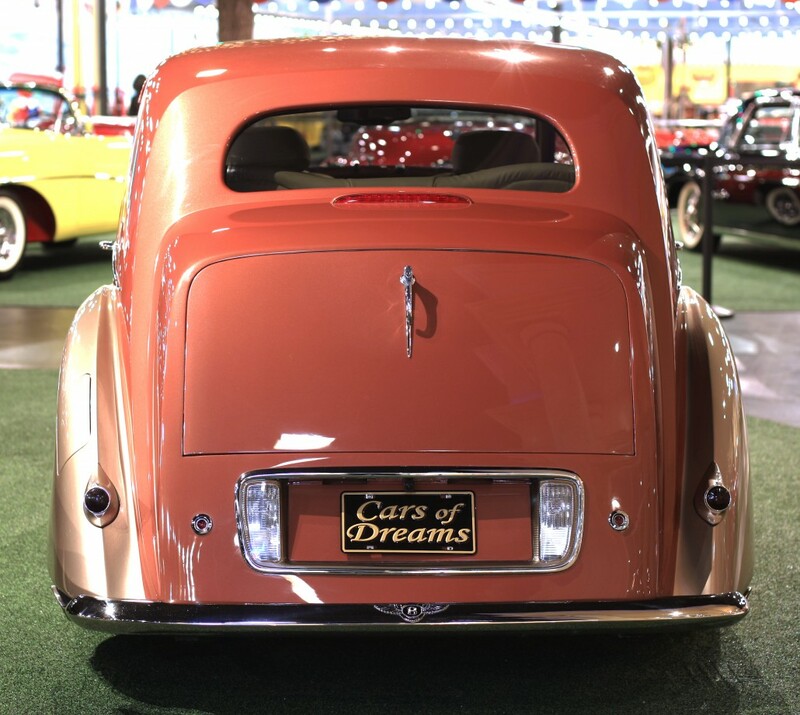 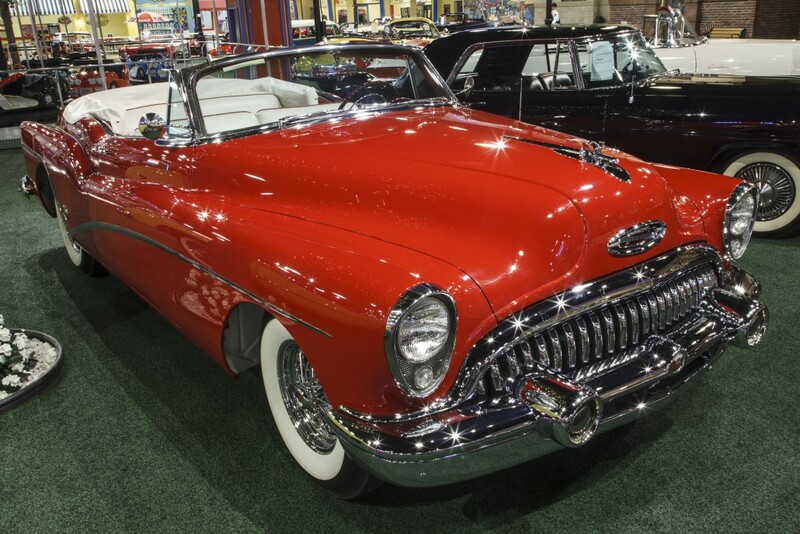 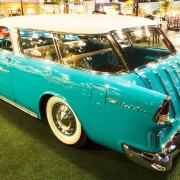 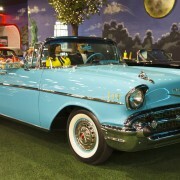 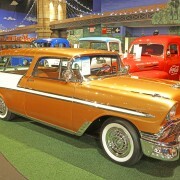 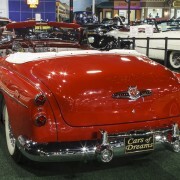 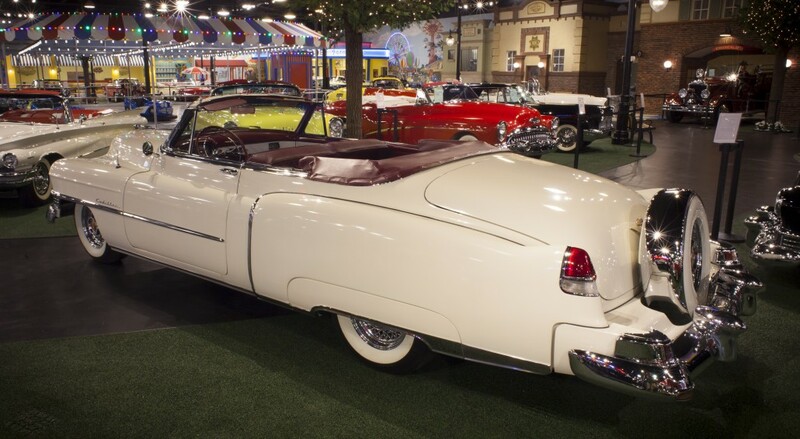 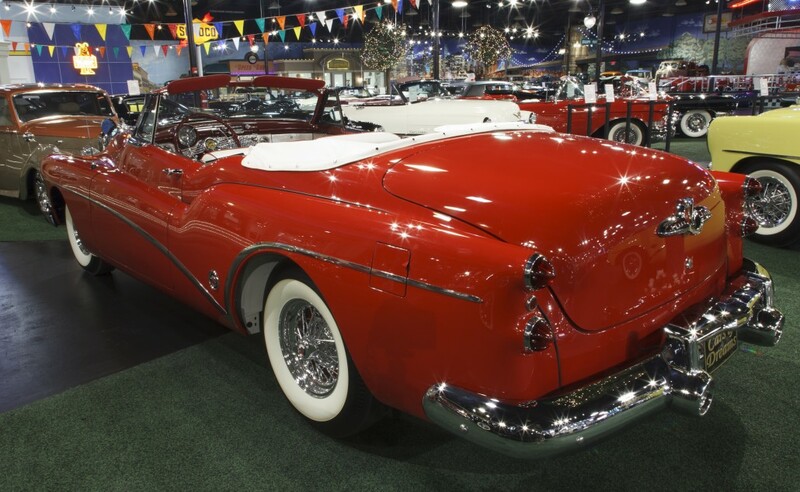 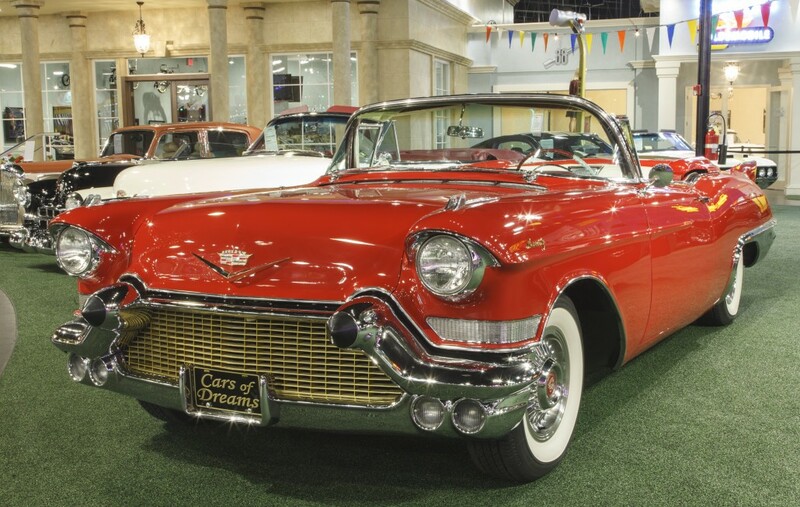 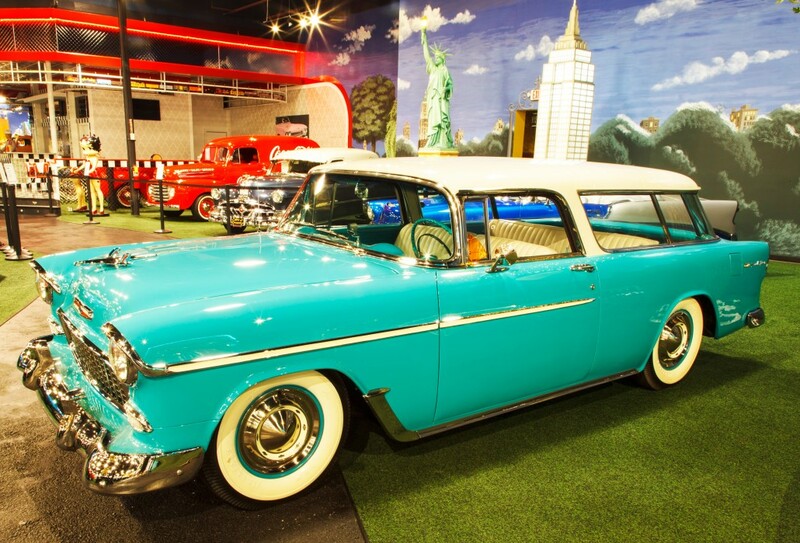 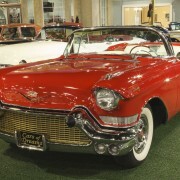 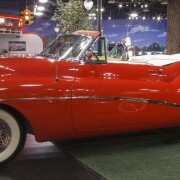 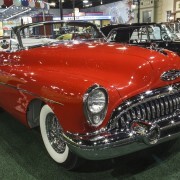 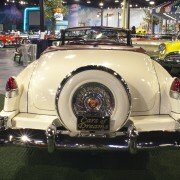 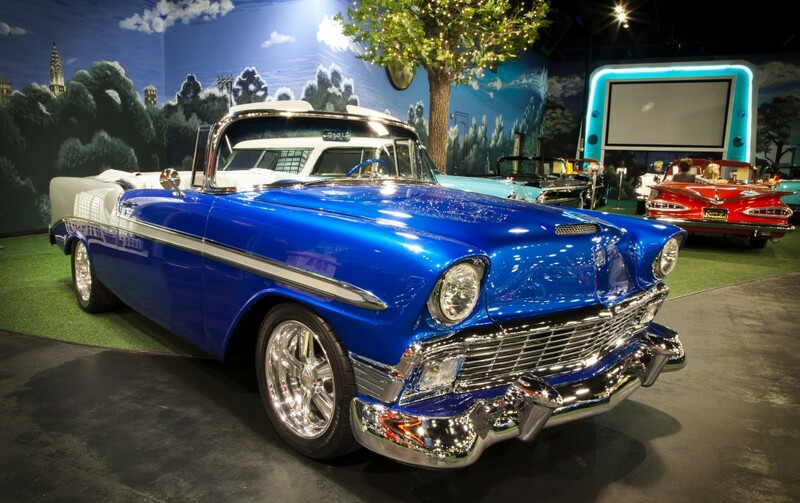 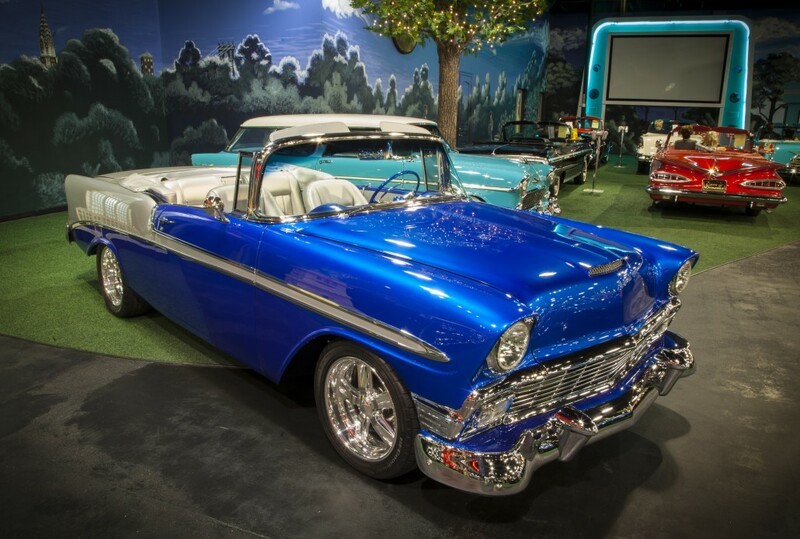 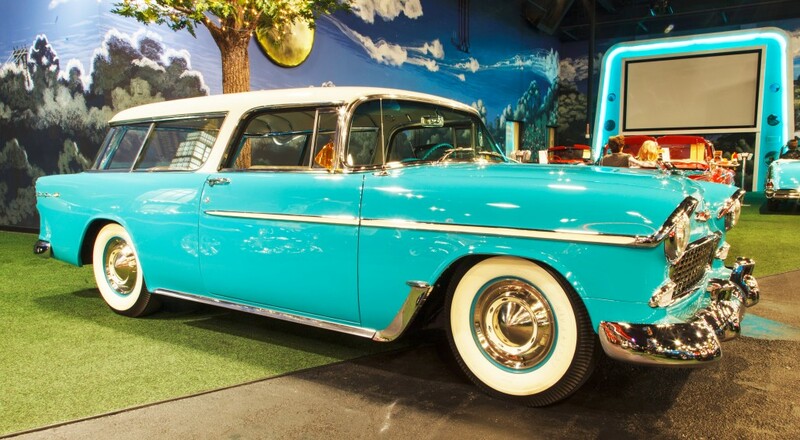 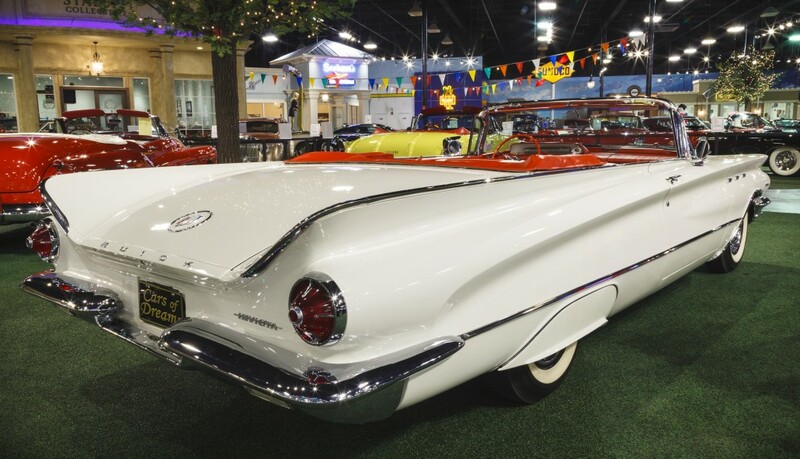 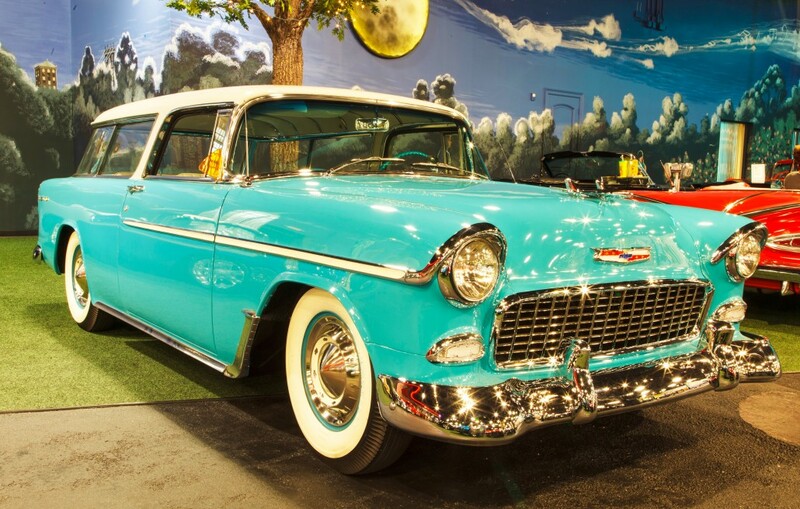 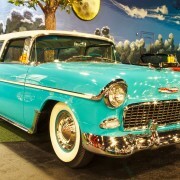 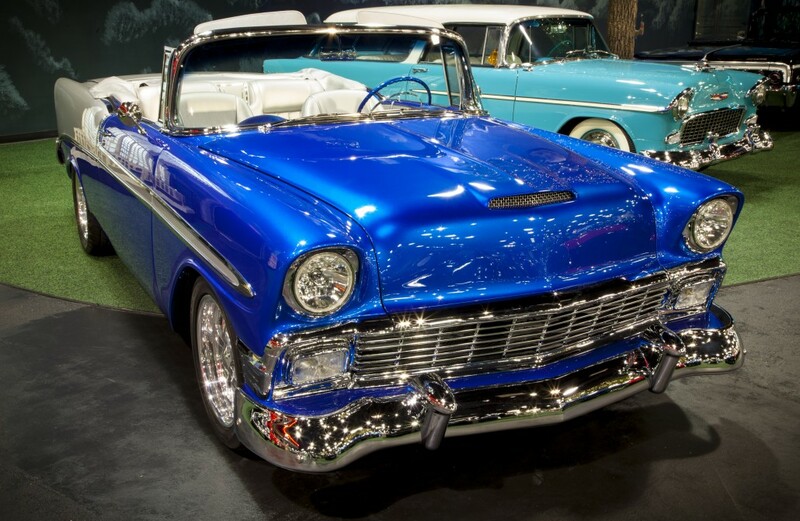 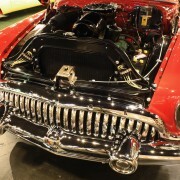 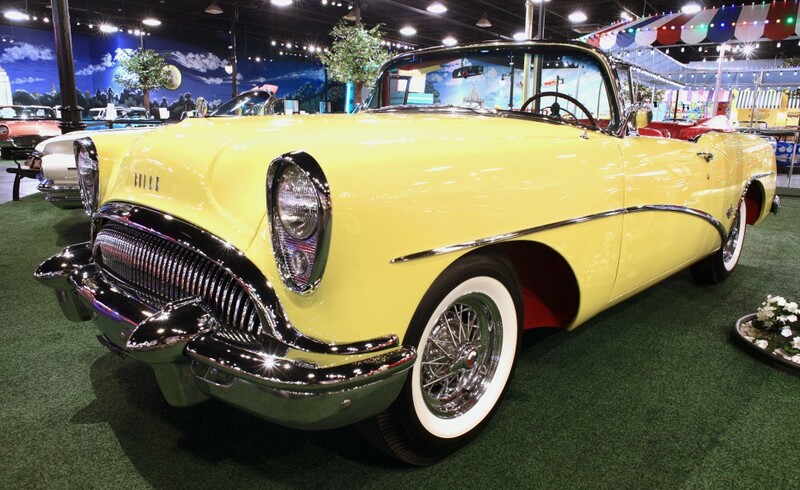 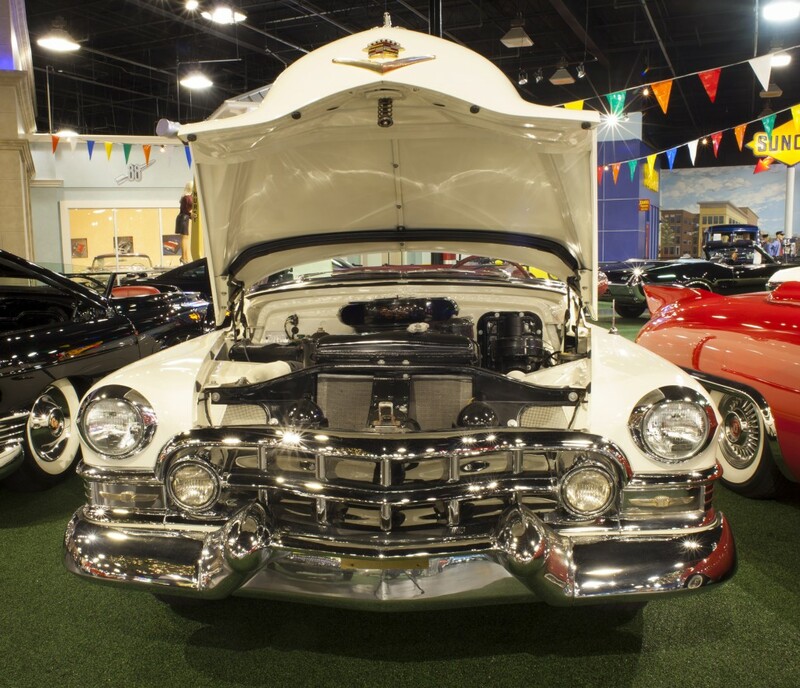 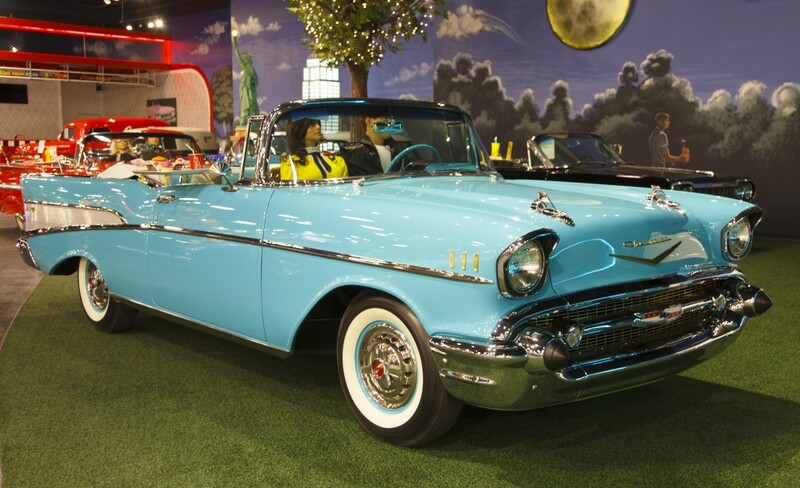 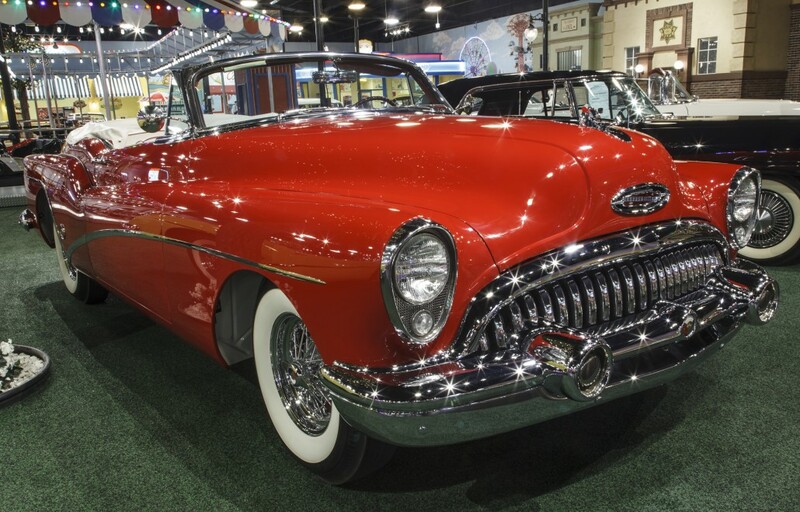 Equipped with the famous Power Pack V8 and power steering, a true 1955 V code special head 265CID, 4-barrel, dual exhaust. 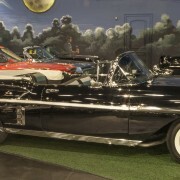 Extensive body-off restoration. 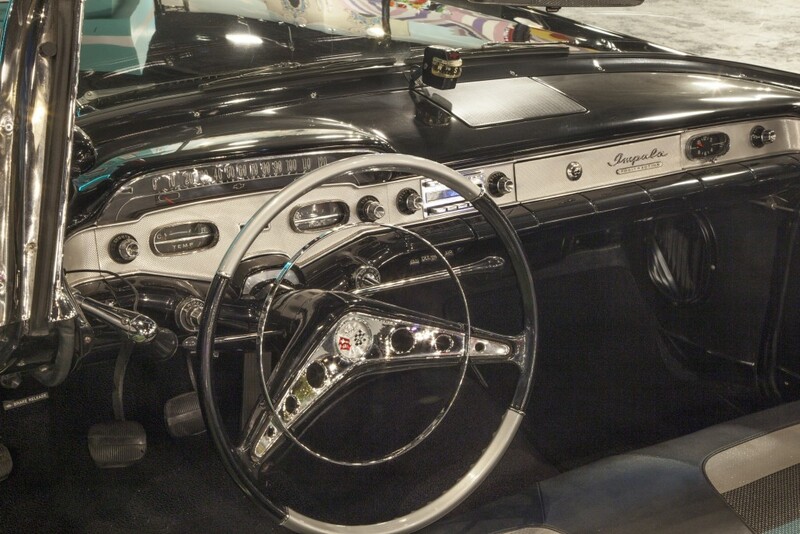 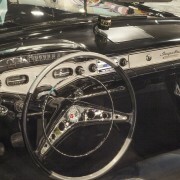 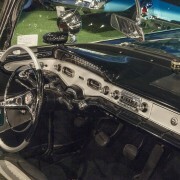 Wonder Bar radio, spotlights, power seats, power windows, power steering, automatic transmission. 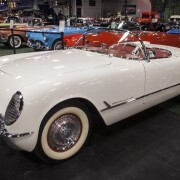 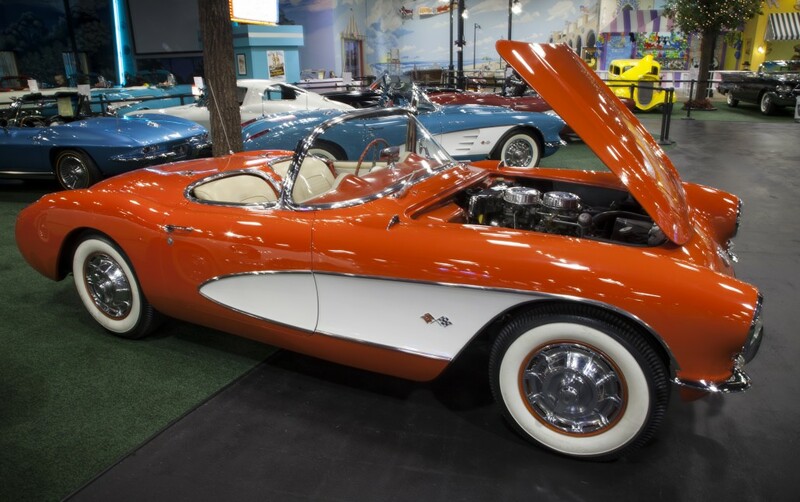 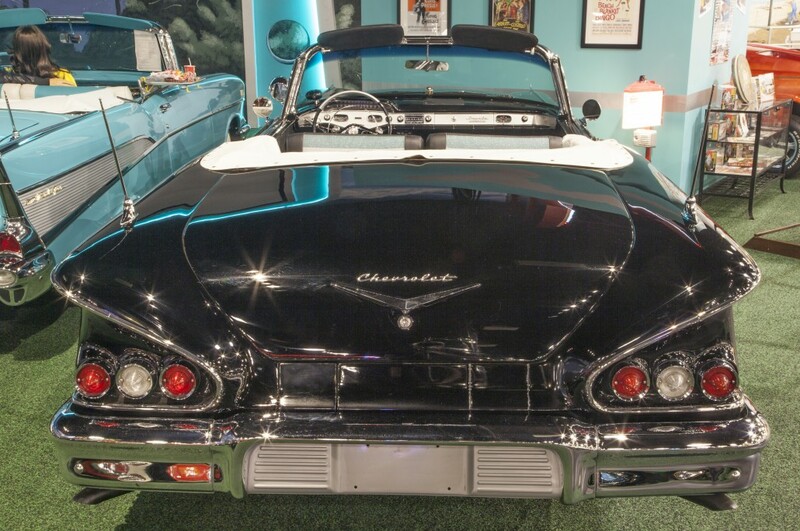 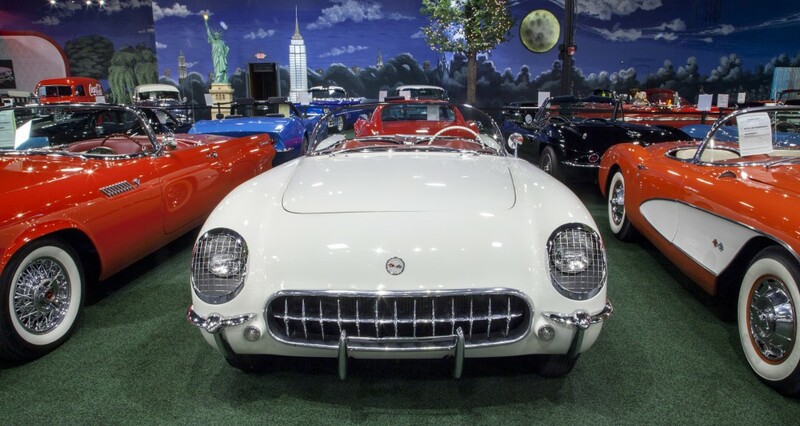 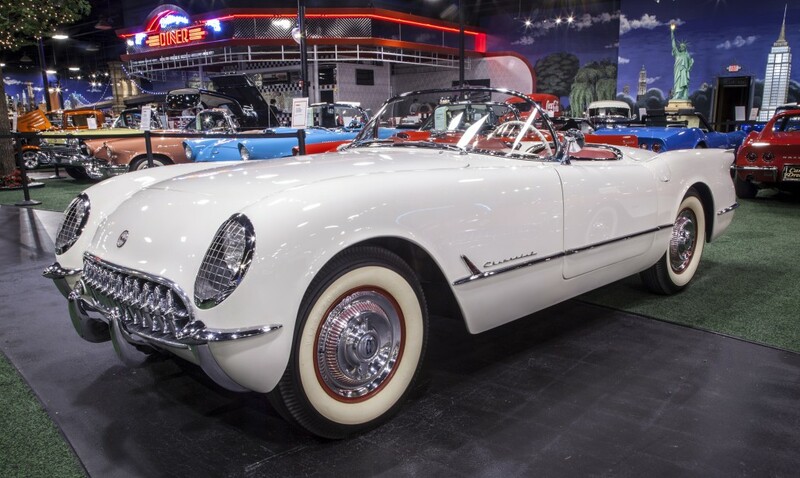 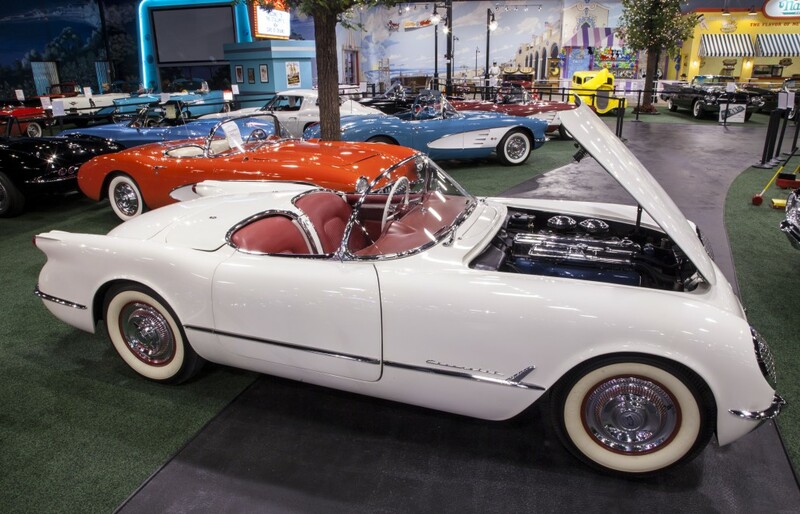 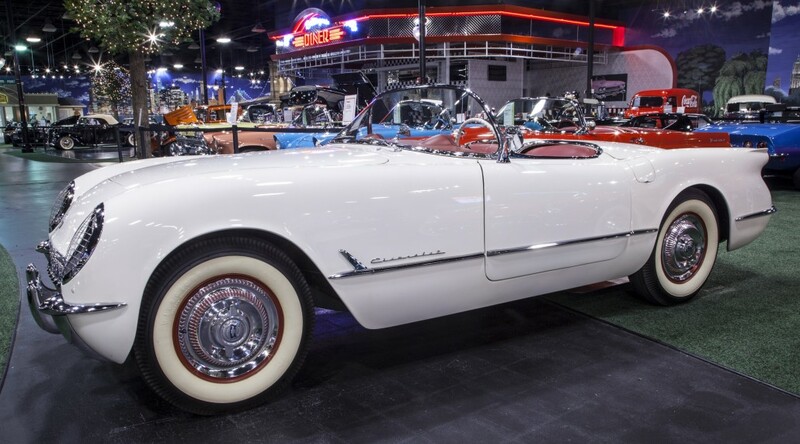 Very rare 1956 265/225 HP Corvette with powerglide automatic transmission, dual carburetors and a very rare power folding top. 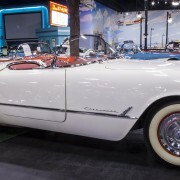 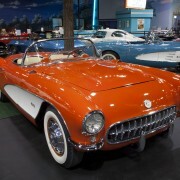 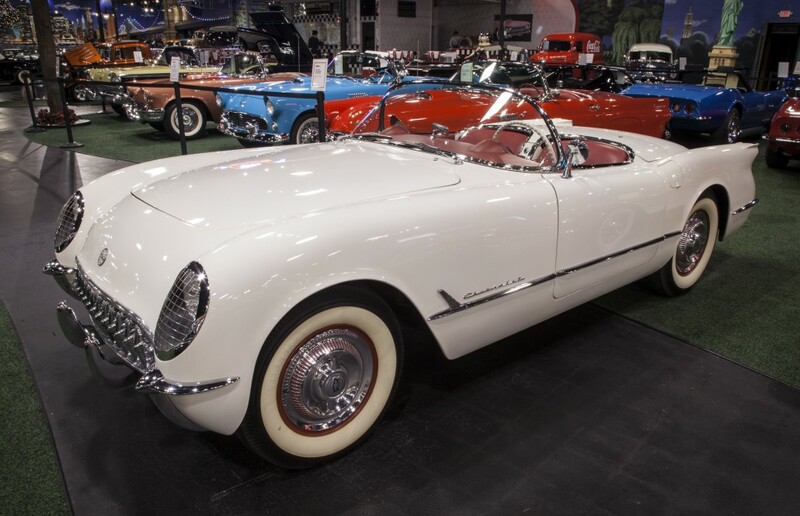 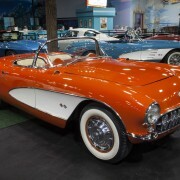 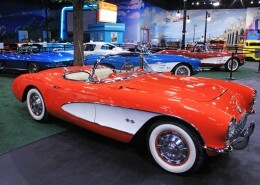 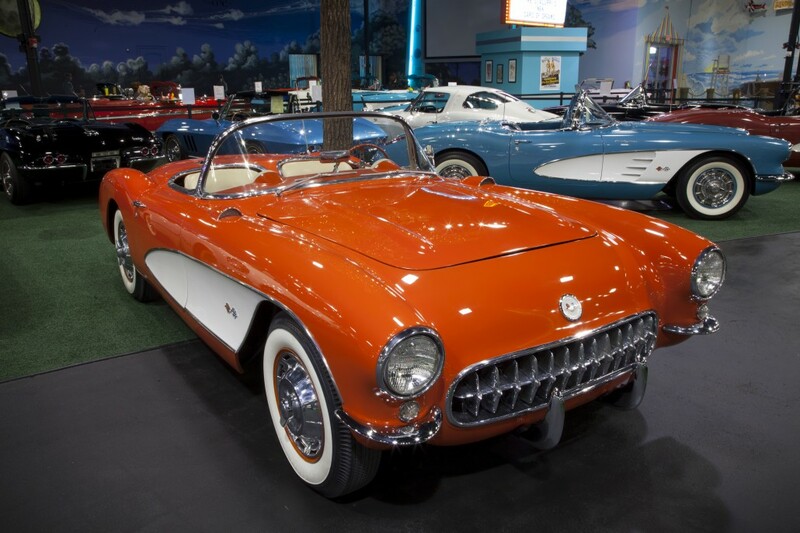 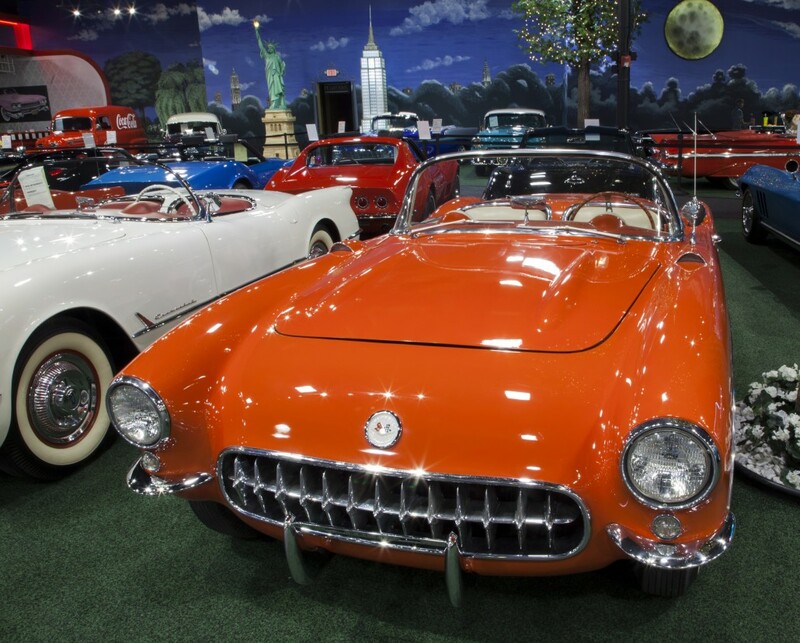 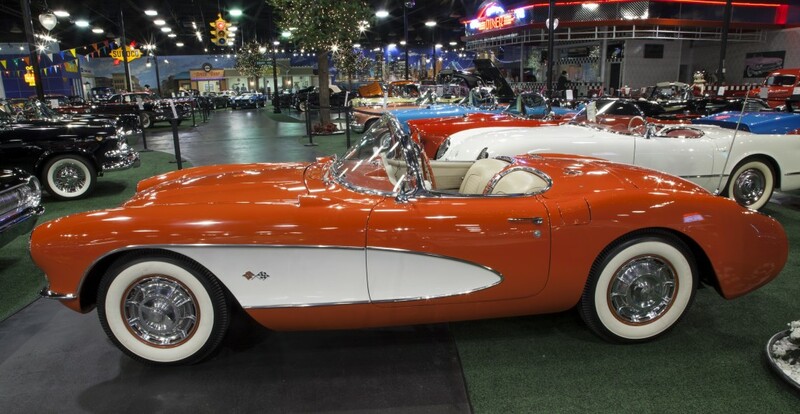 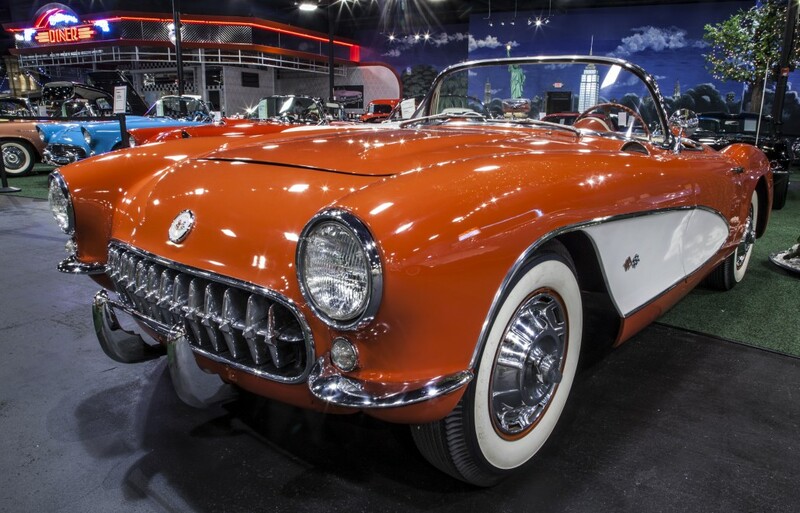 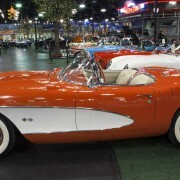 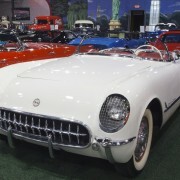 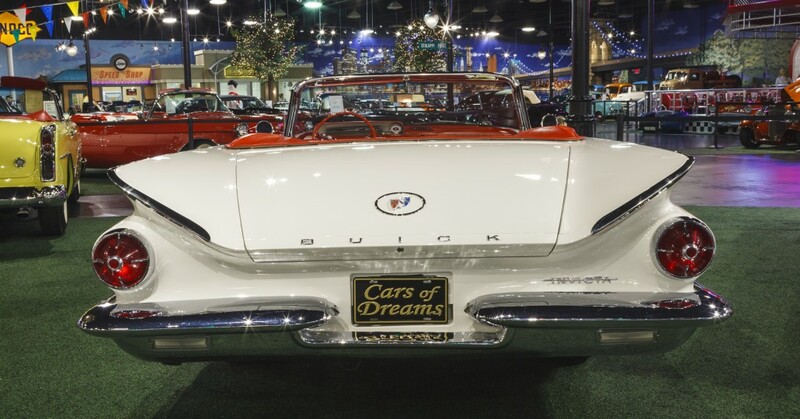 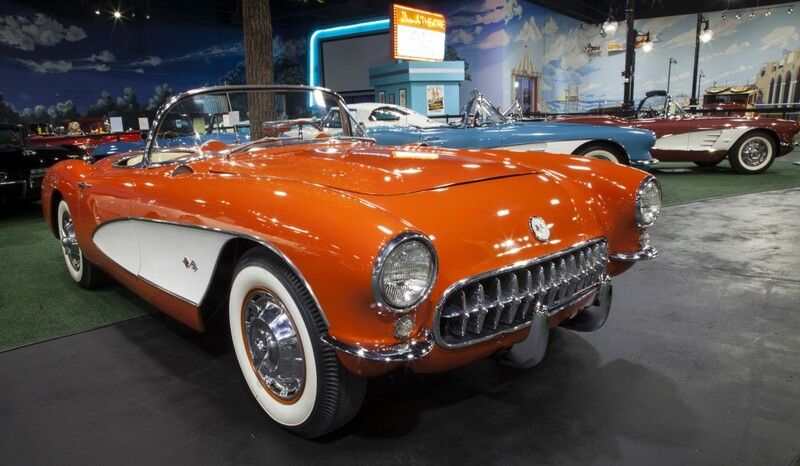 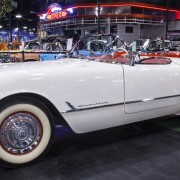 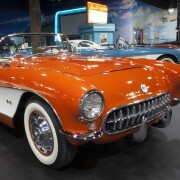 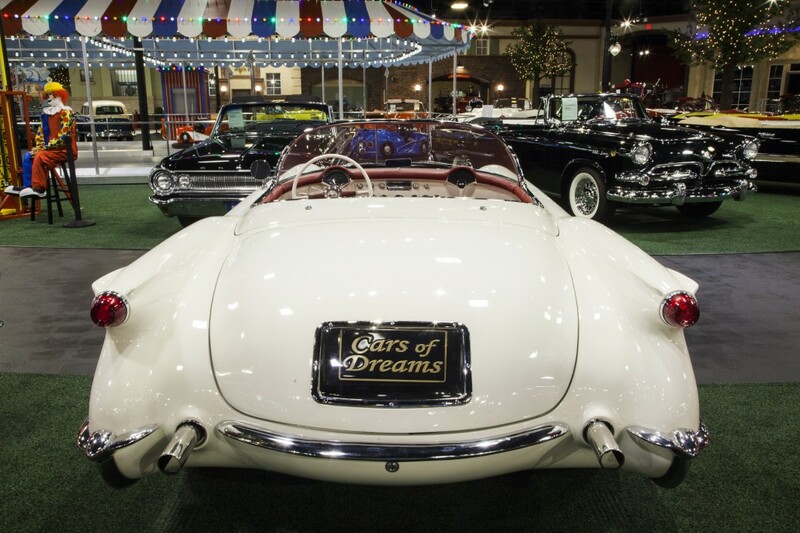 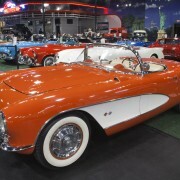 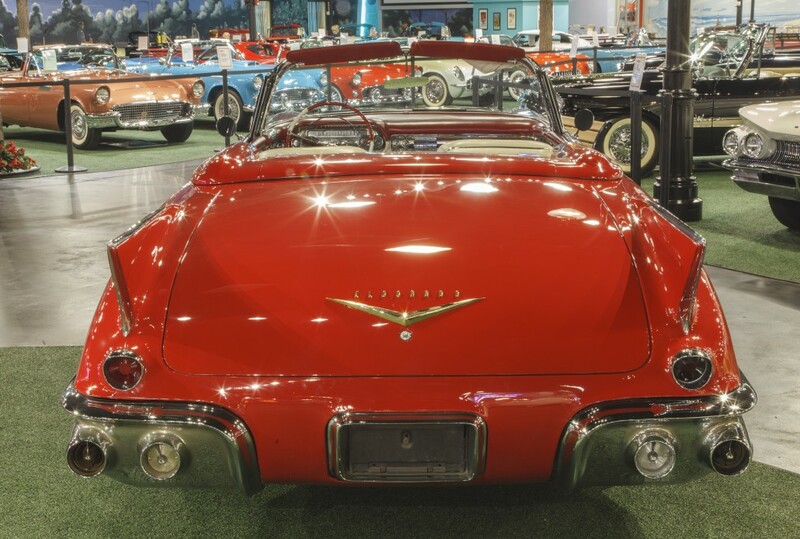 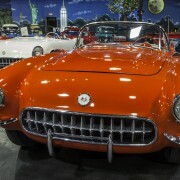 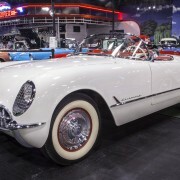 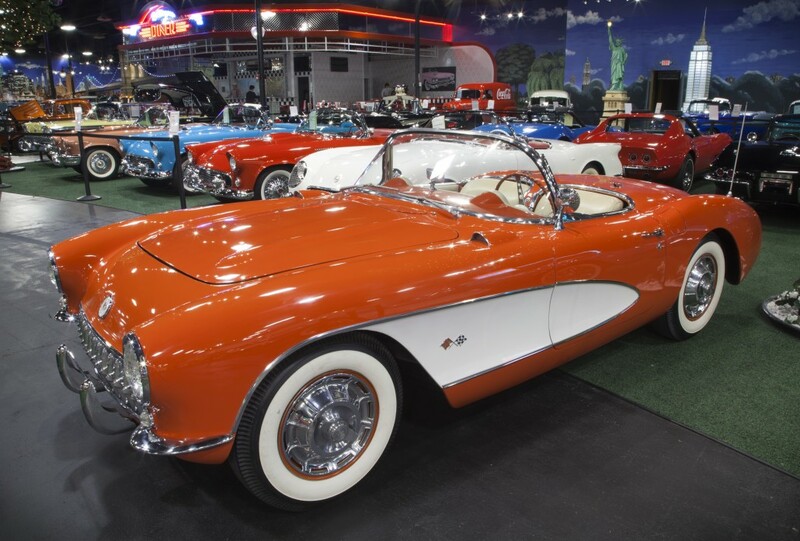 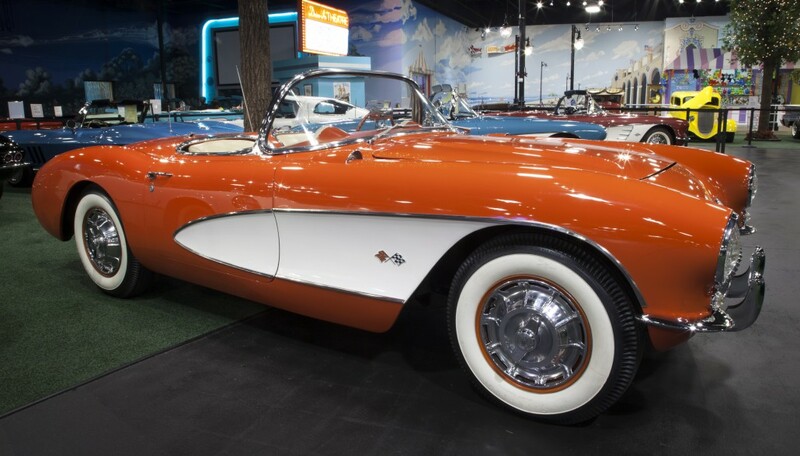 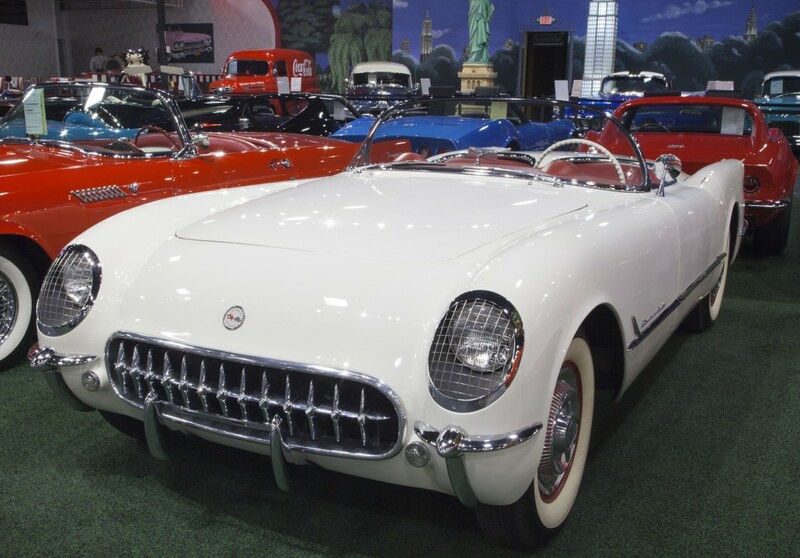 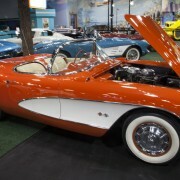 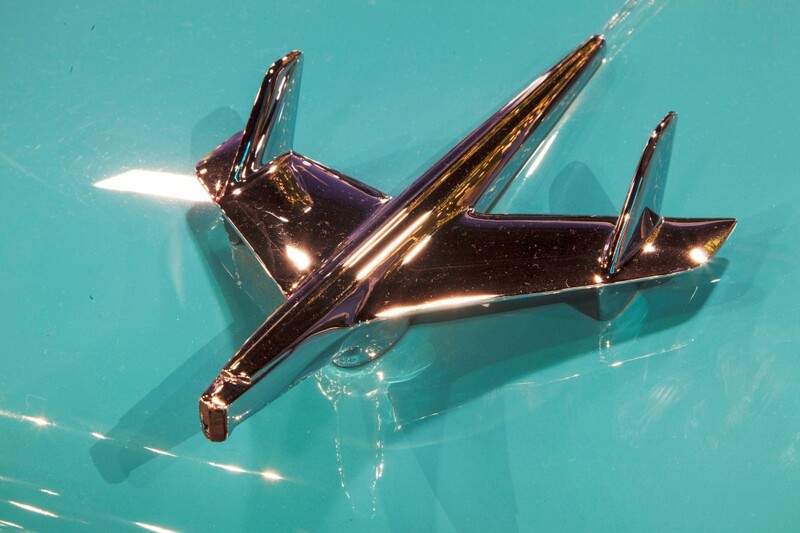 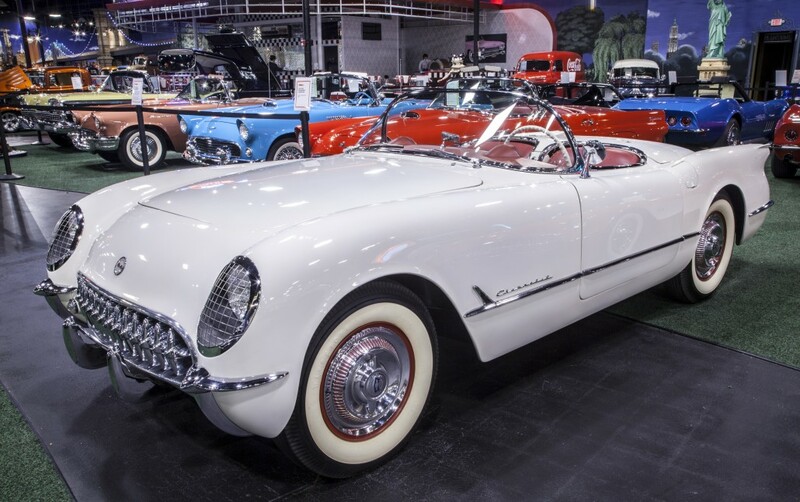 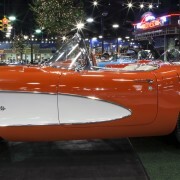 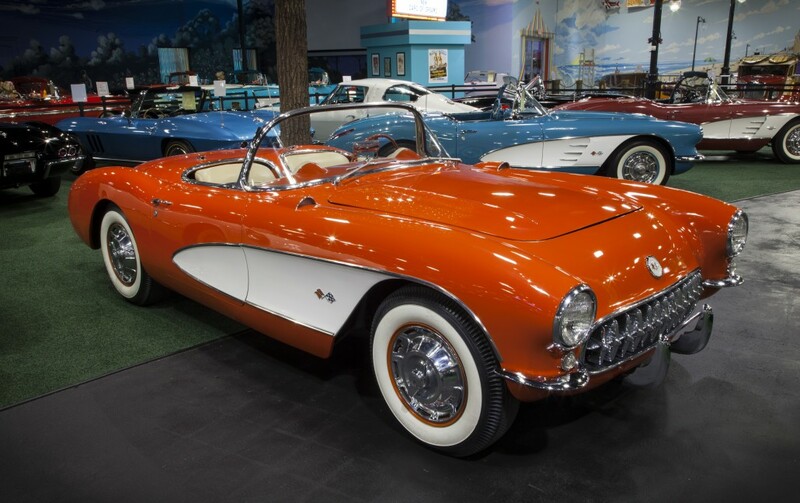 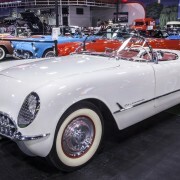 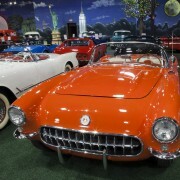 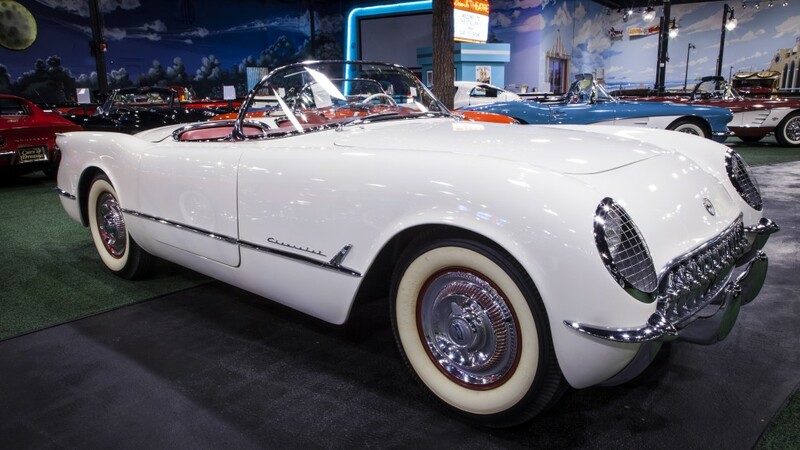 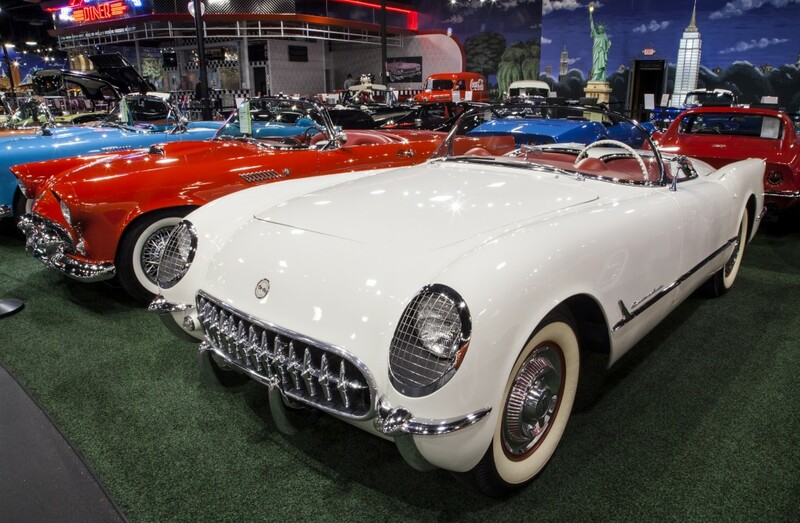 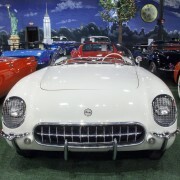 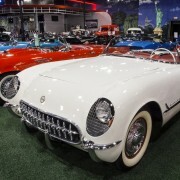 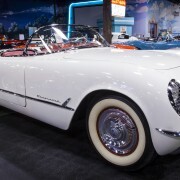 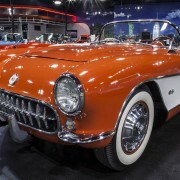 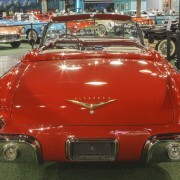 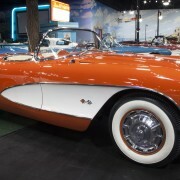 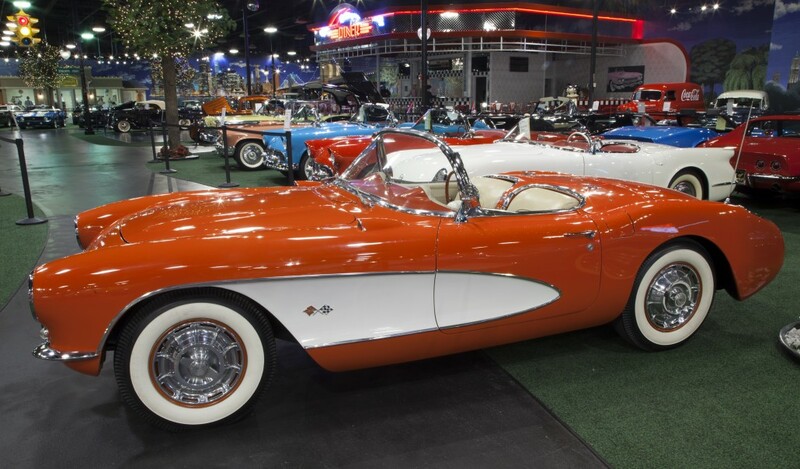 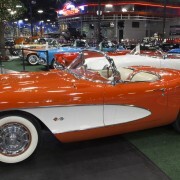 Very low production with 3,467 cars produced in the 1956 Corvette year. 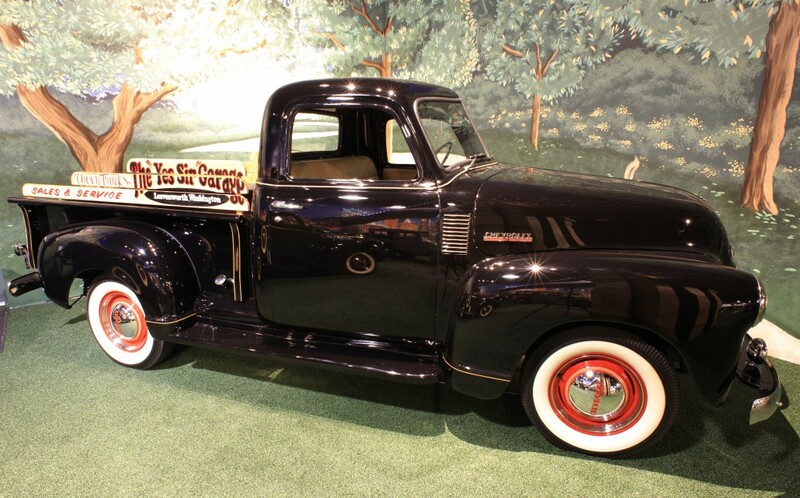 This loaded Task Force series half-ton step-side short-bed pickup is exceptionally clean. 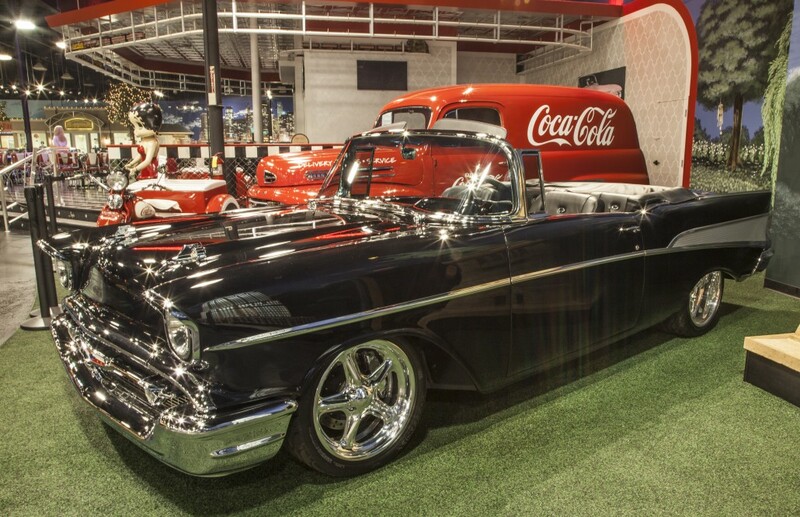 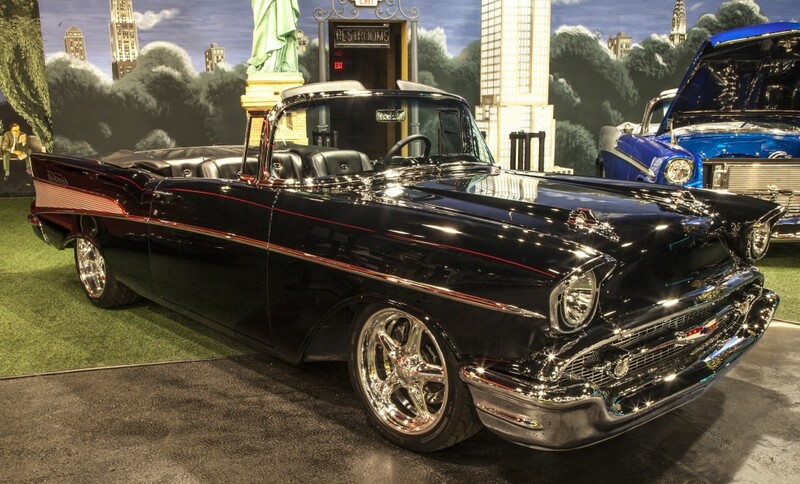 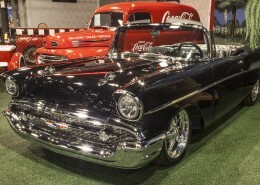 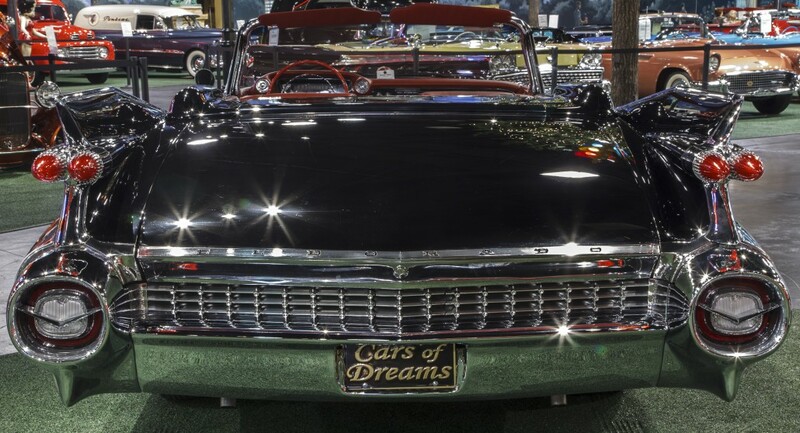 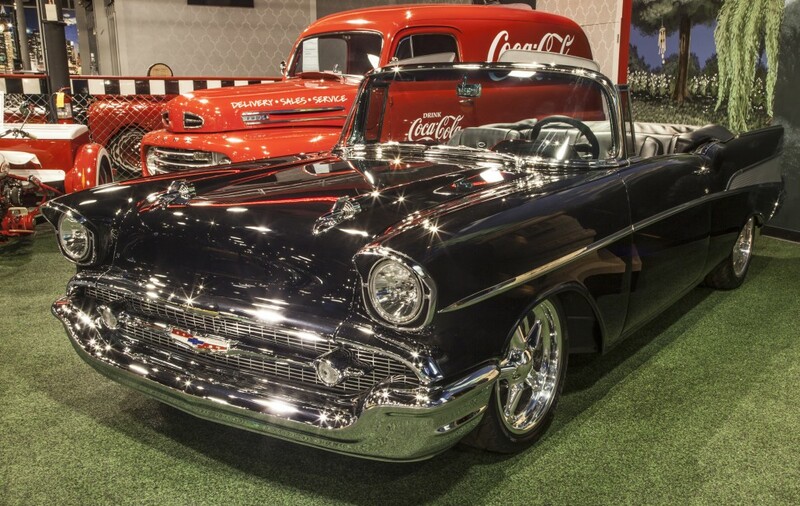 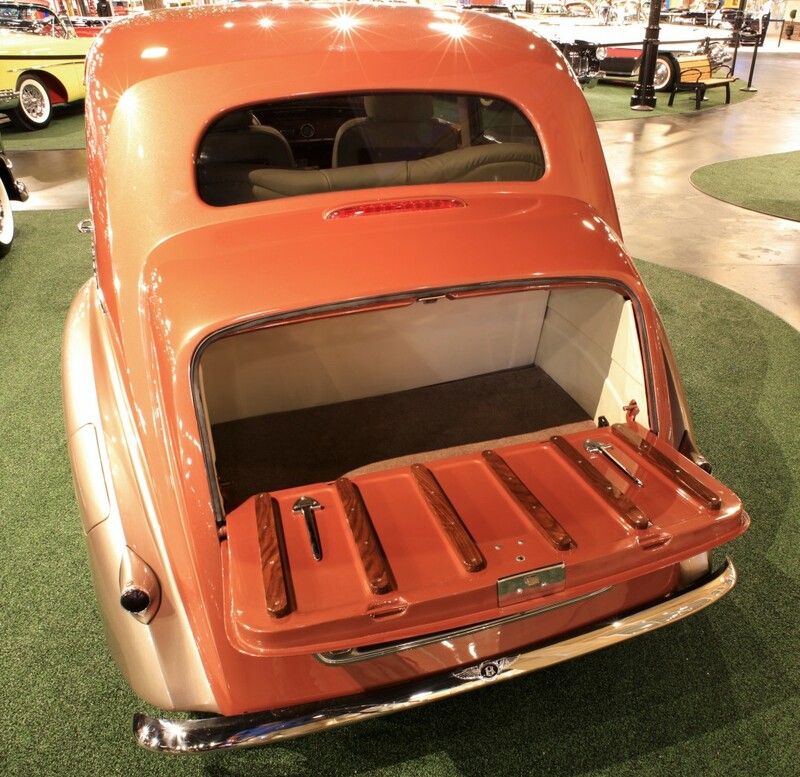 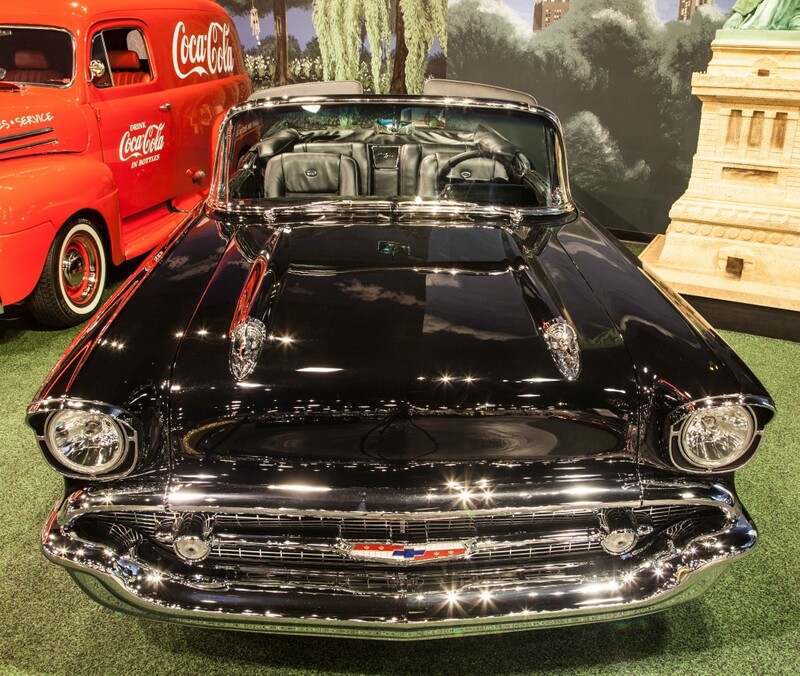 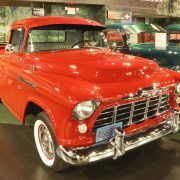 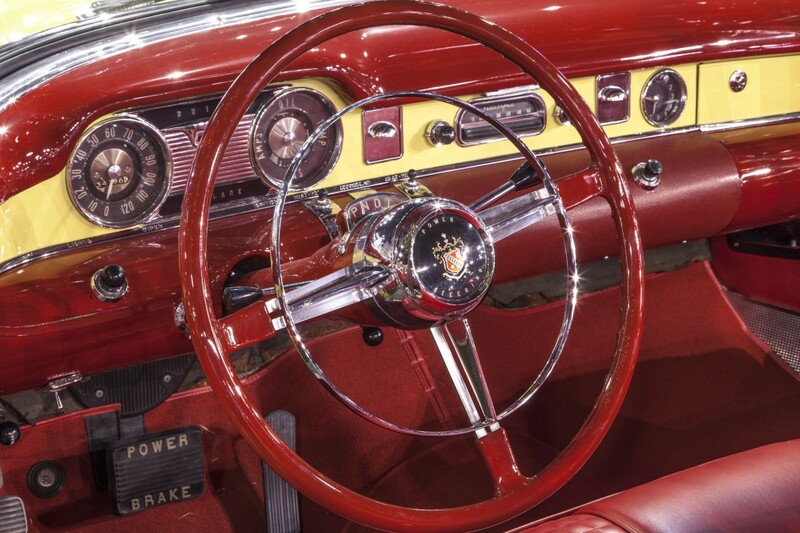 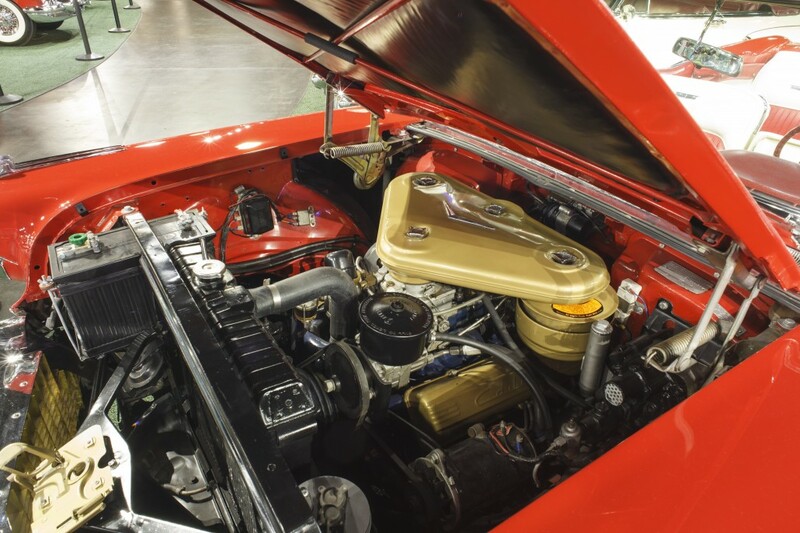 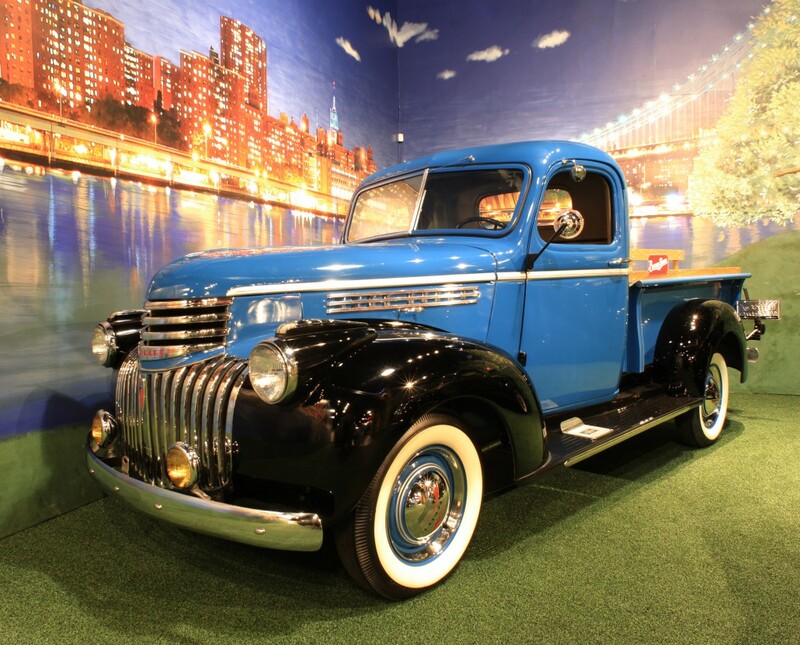 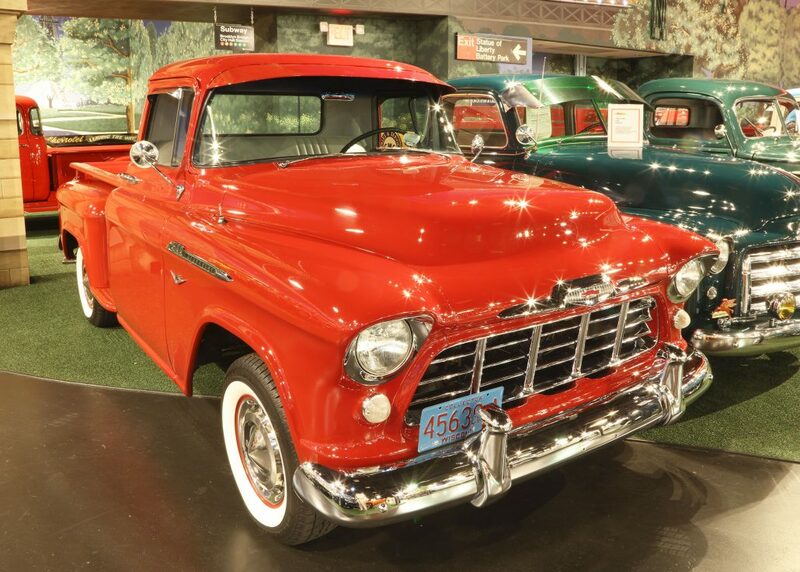 It’s undergone and excellent frame-off restoration, This true Los Angeles, California-produced pickup is finished in tow-stage Cardinal Red base/clear paint color sanded to a mirror-like finish with beautifully finished oak bed and excellent chrome and stainless trim. 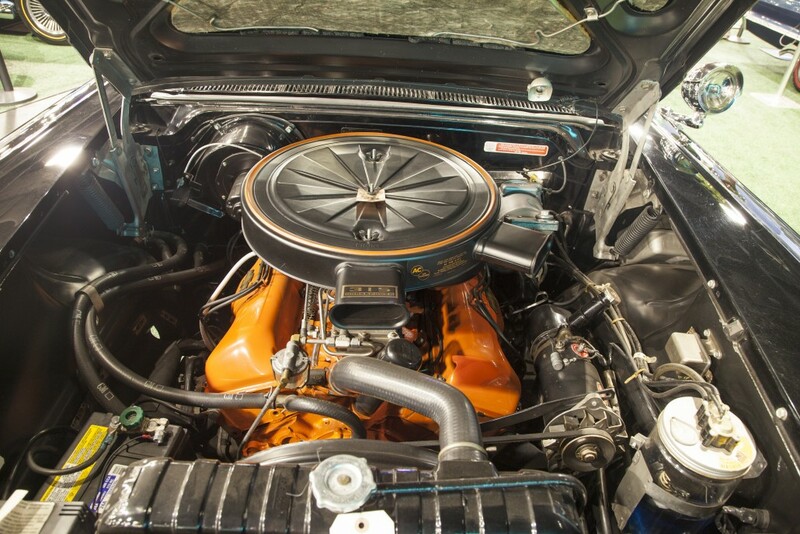 It’s powered by the factory-optional 265ci V8 engine backed to a 3-speed manual transmission with rare optional overdrive. 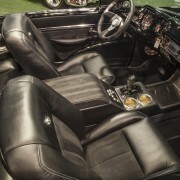 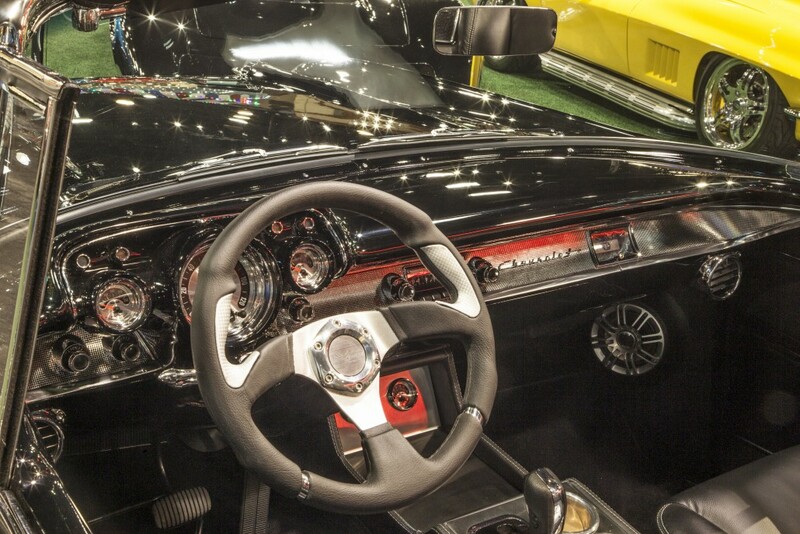 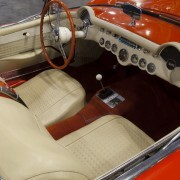 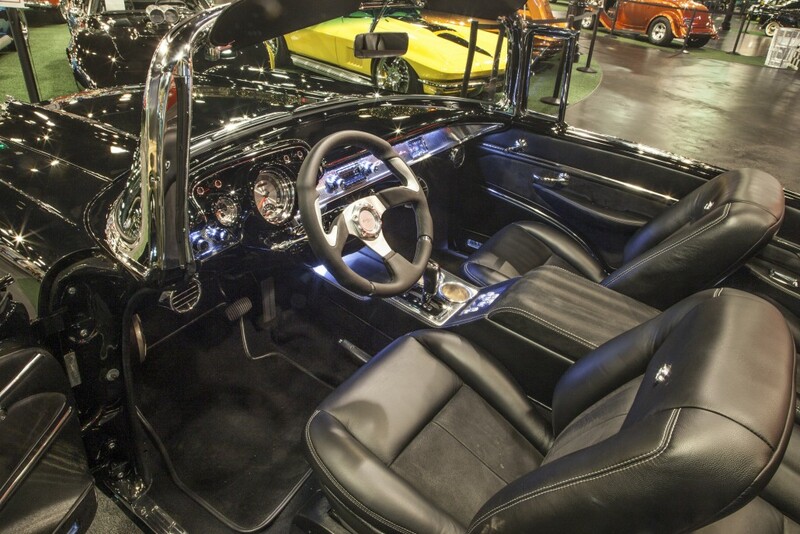 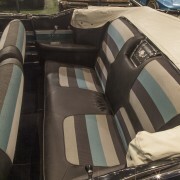 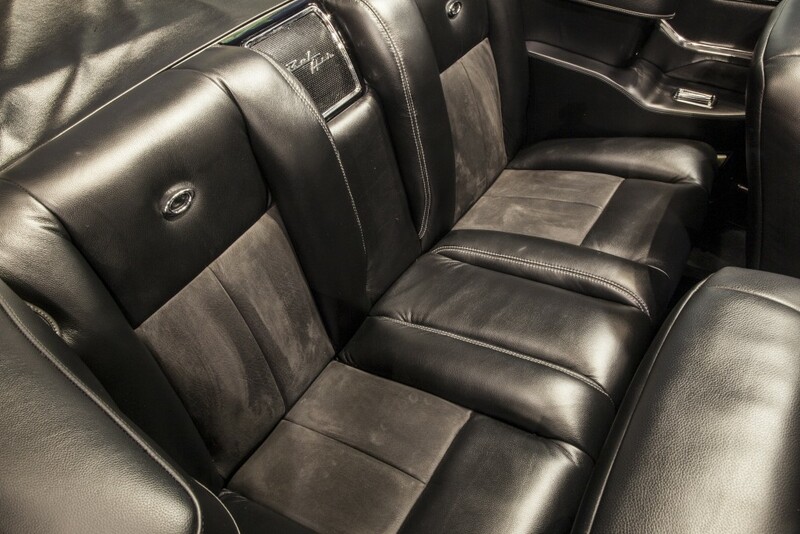 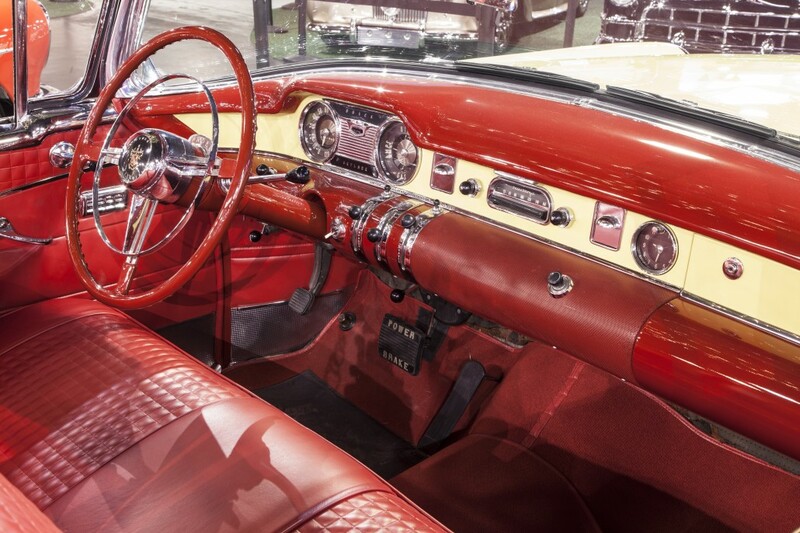 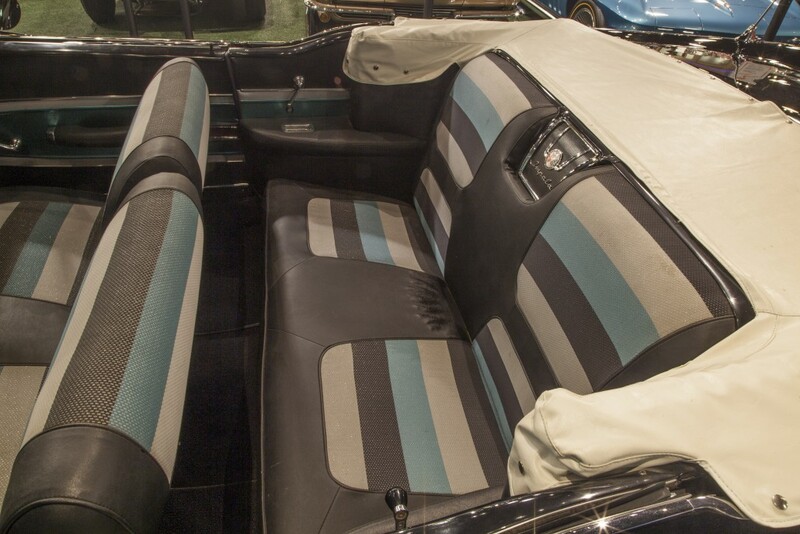 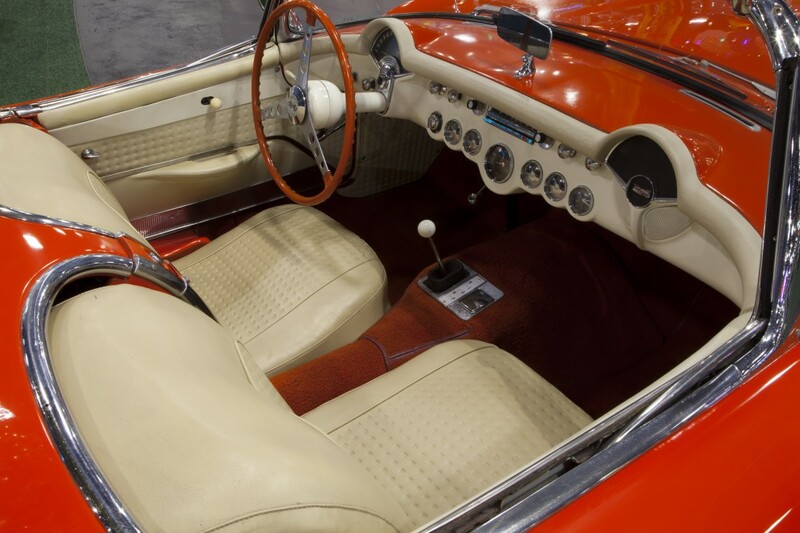 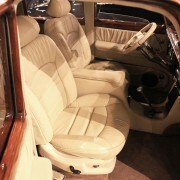 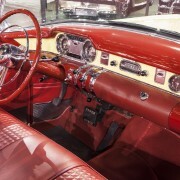 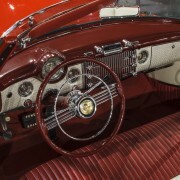 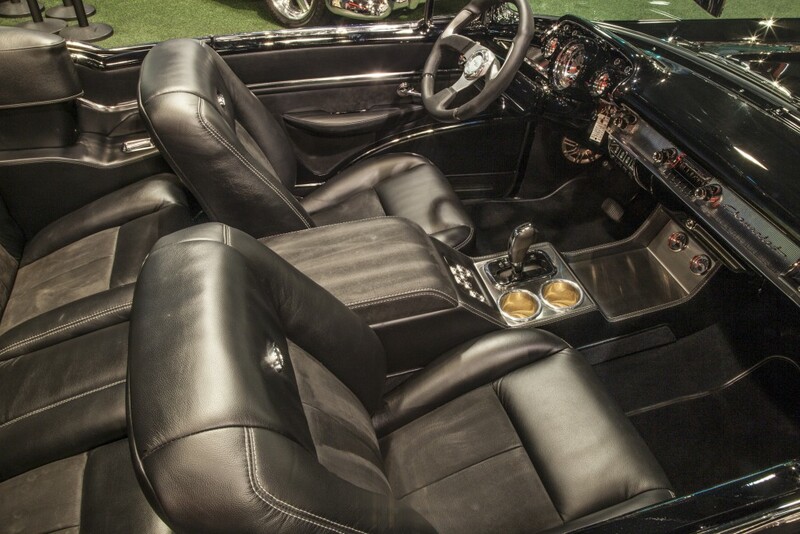 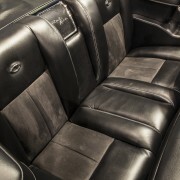 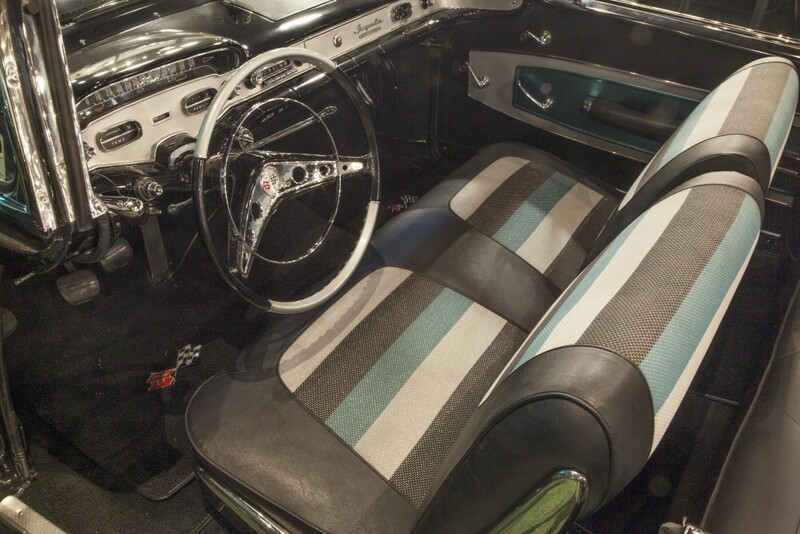 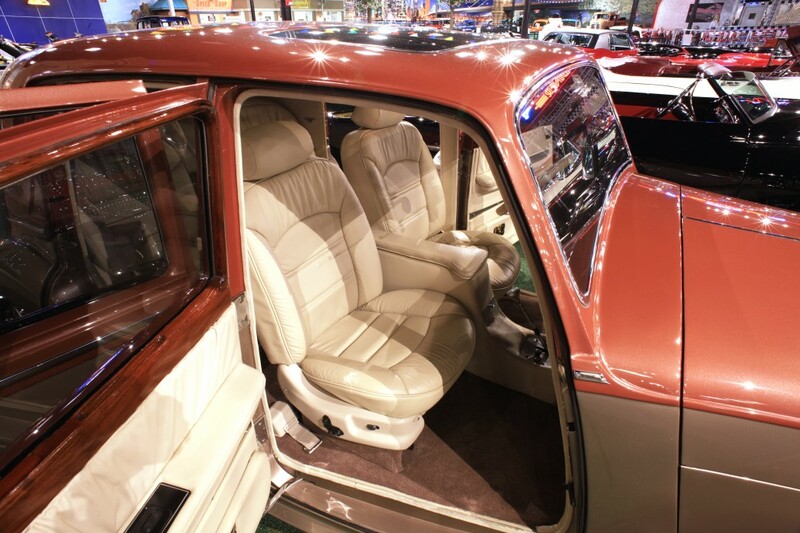 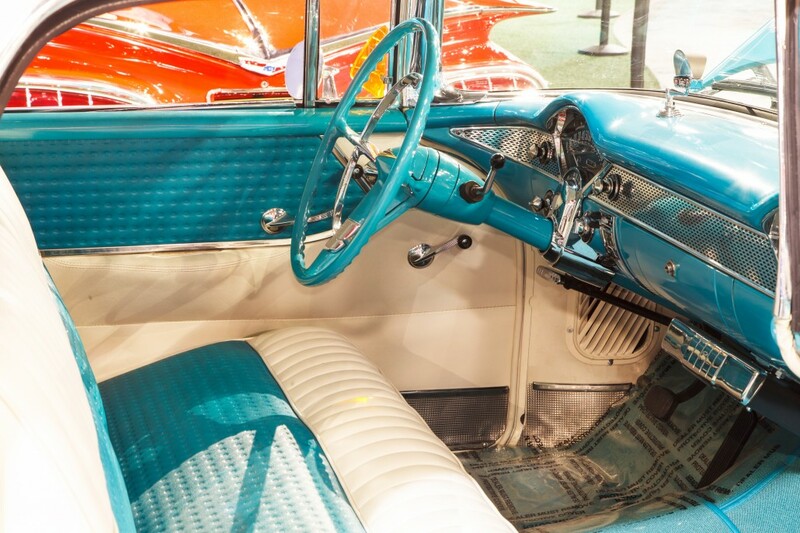 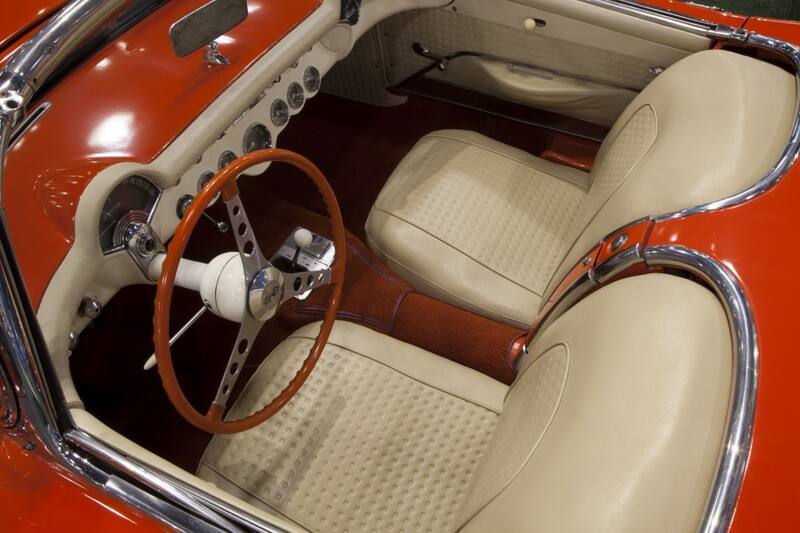 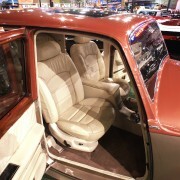 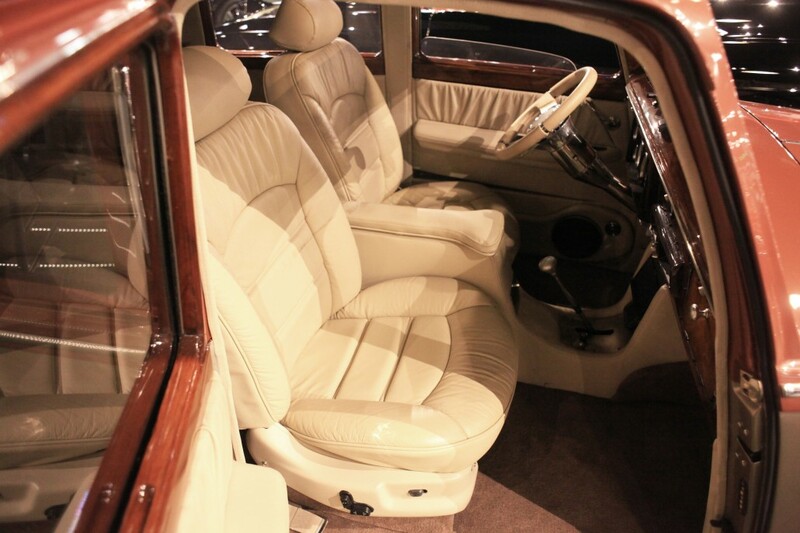 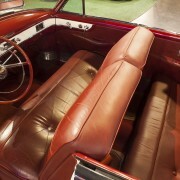 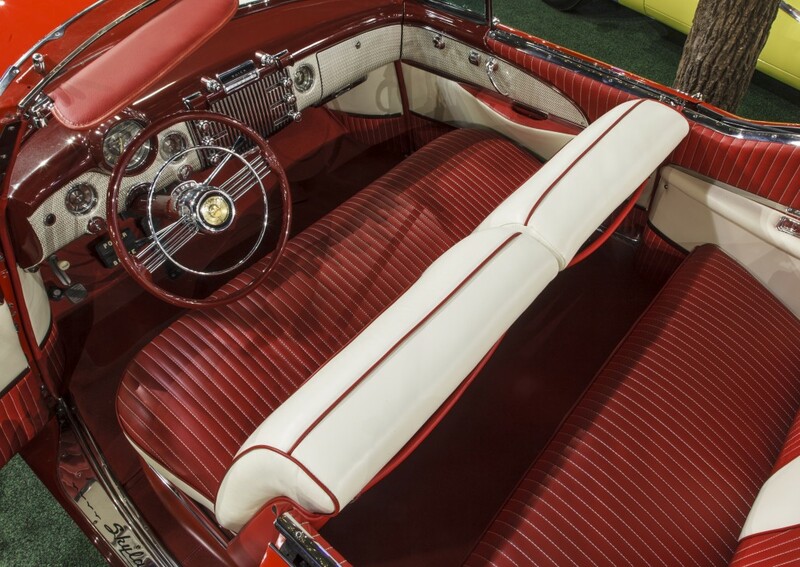 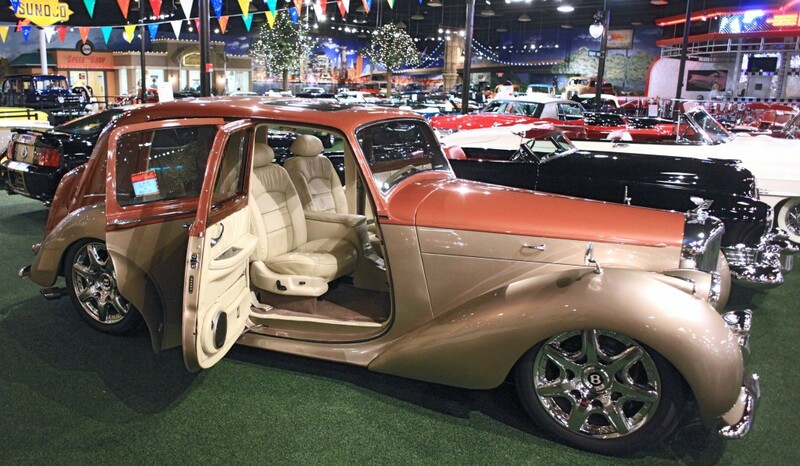 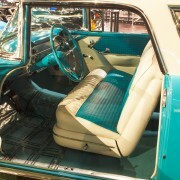 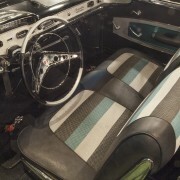 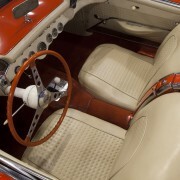 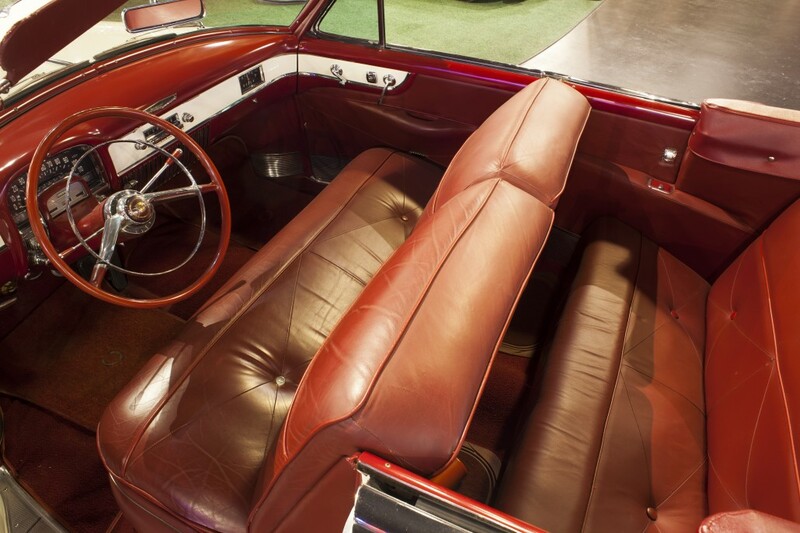 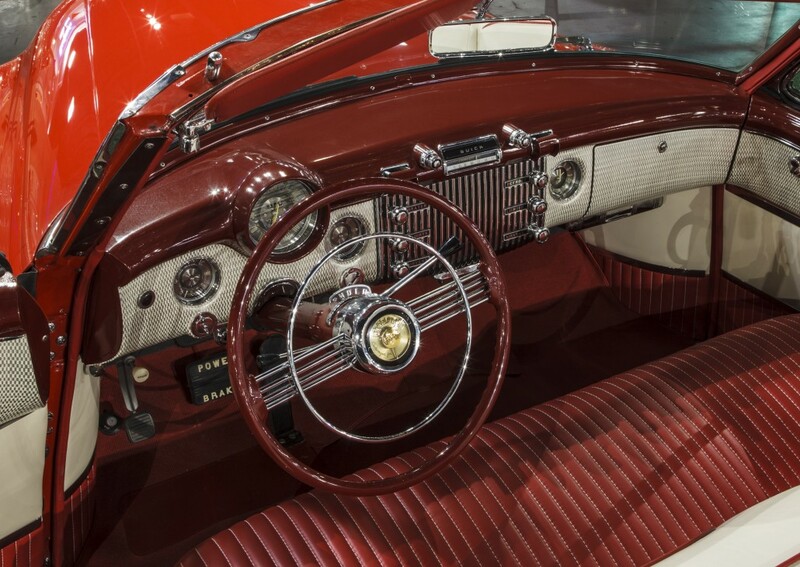 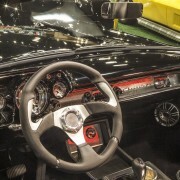 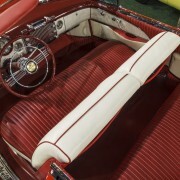 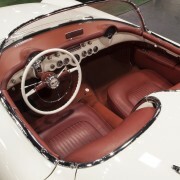 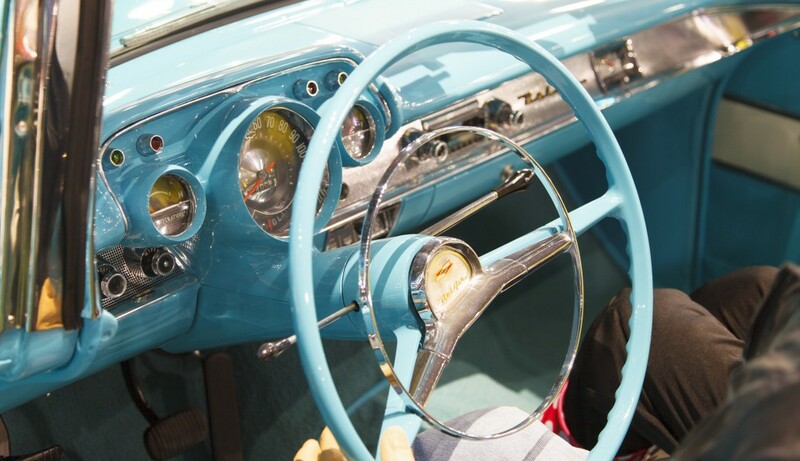 A factory-style two-tone gray finishes the completely restored interior. 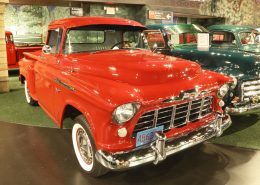 This pickup is loaded with options not seen on most, including traffic view finder, radio, heater, sun visor, window guards, door-handle shields, dual exhaust and wide whitewalls with full wheel caps, Other options added during restoration for reliability and comfort include Vintage Air and a factory-style retro AM/FM stereo. 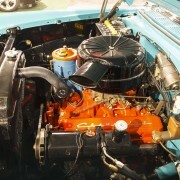 The generator was changed to an alternator charging system and an axillary electric fan, that still maintains the original look, was added. 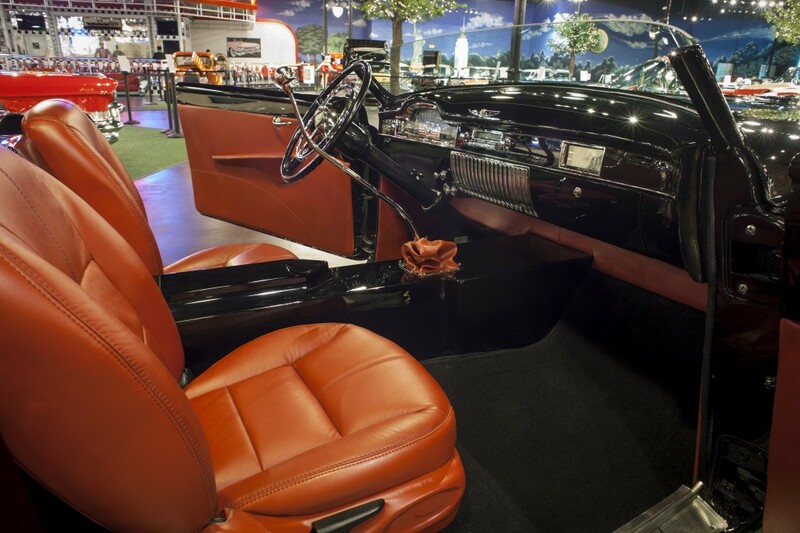 Powered by an LS1 400HP engine, 4L60E automatic transmission, 4-wheel power disc brakes, tubular a-arms, AC, power windows and tilt steering column. 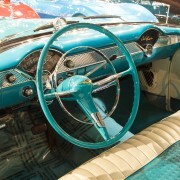 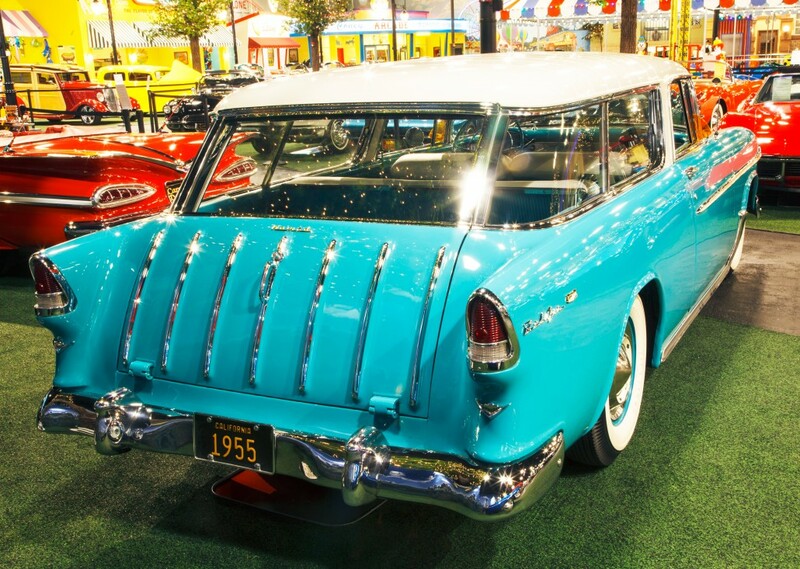 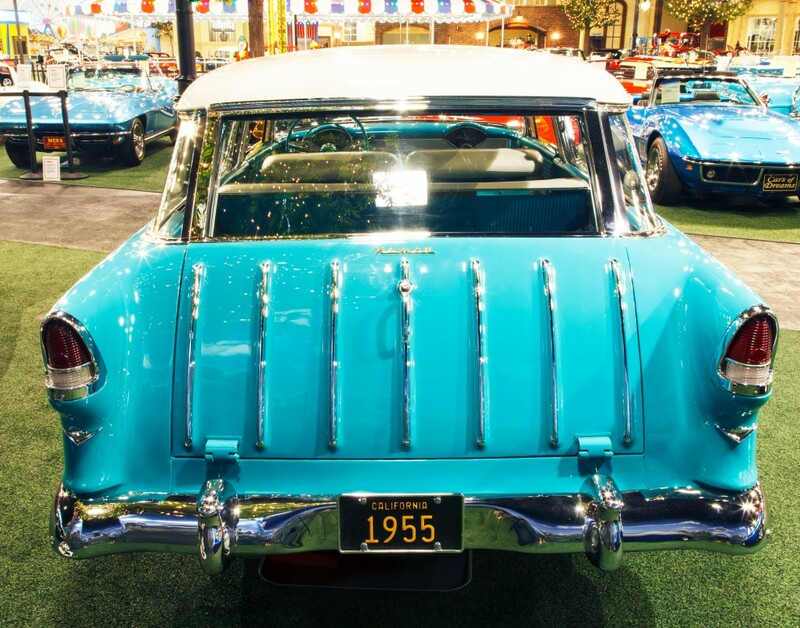 Tropical turquoise with Indian ivory top, frame off-restoration, 283CID, 4-barrel carburetor, 3-speed automatic, dual exhaust.